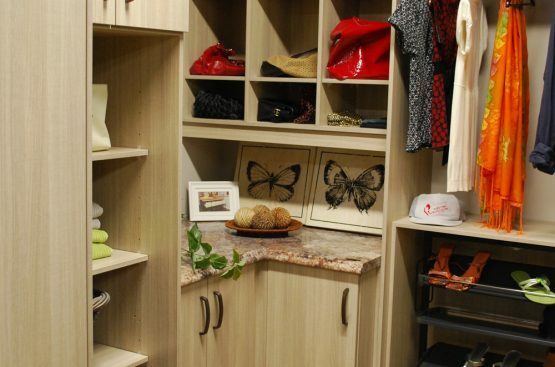 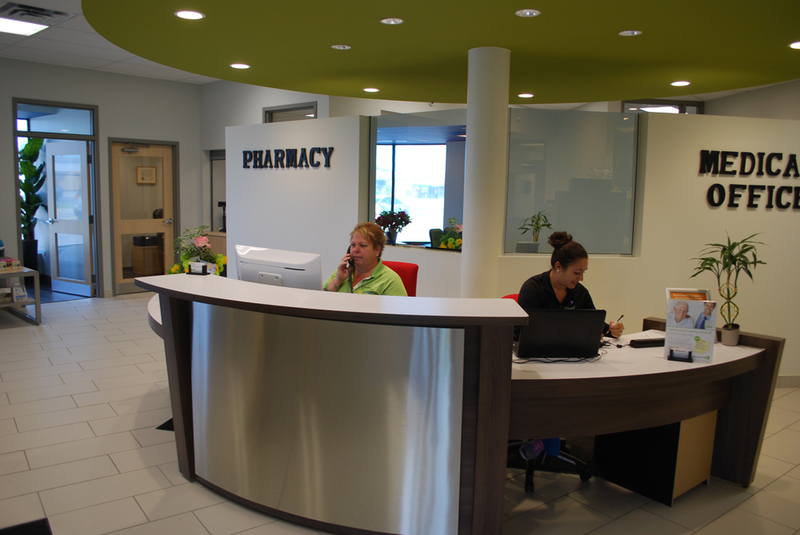 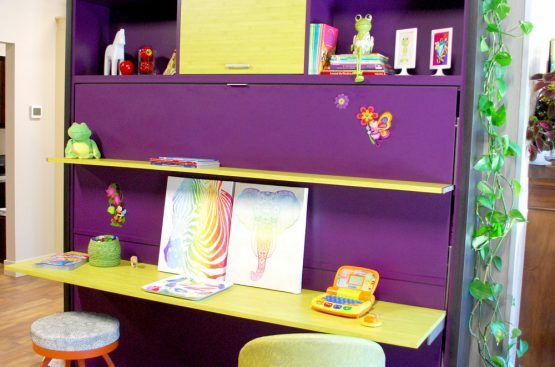 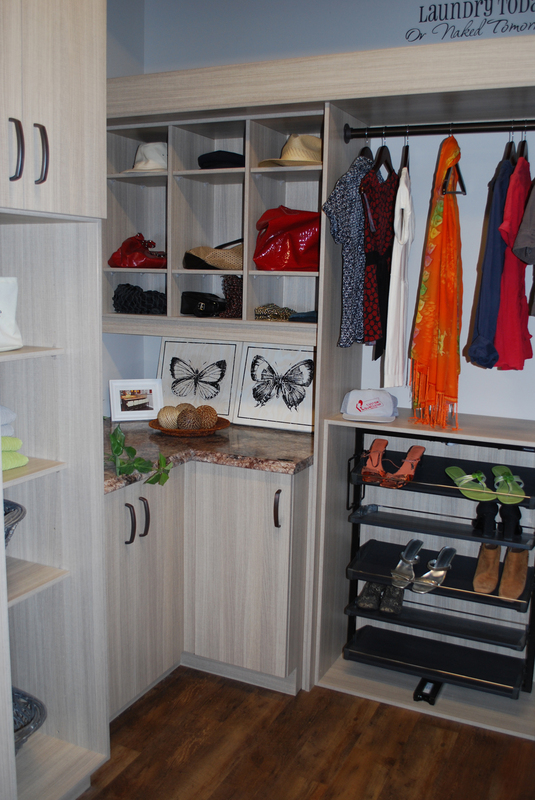 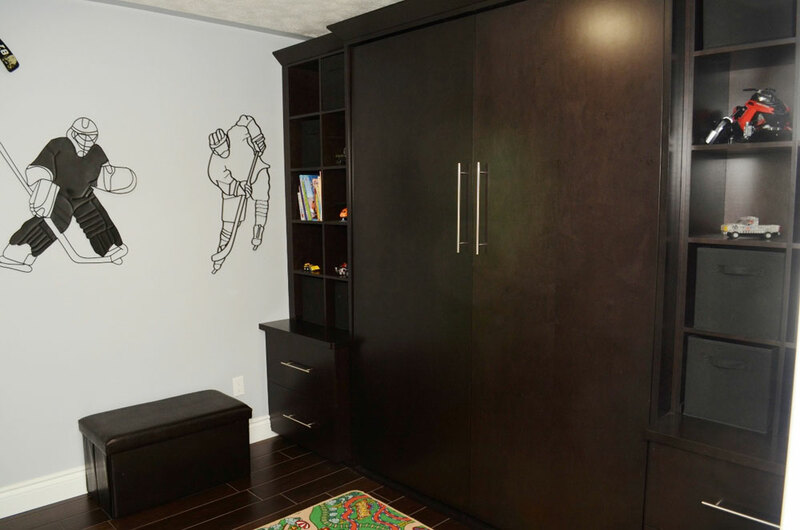 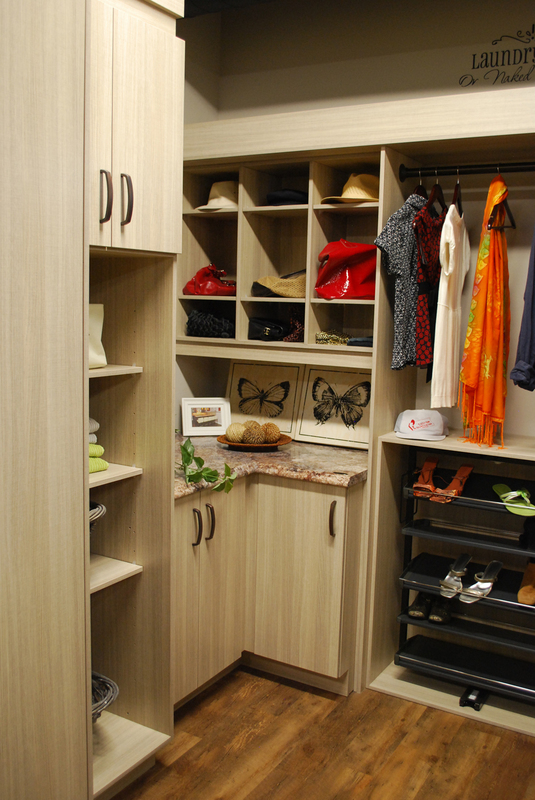 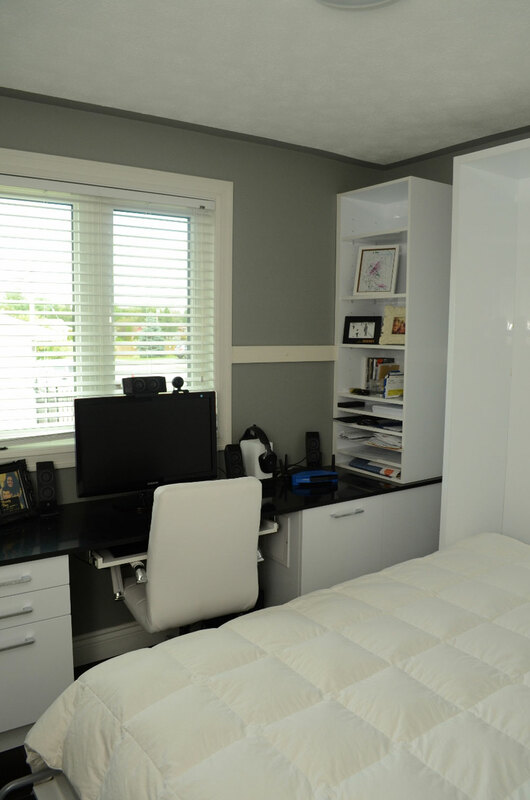 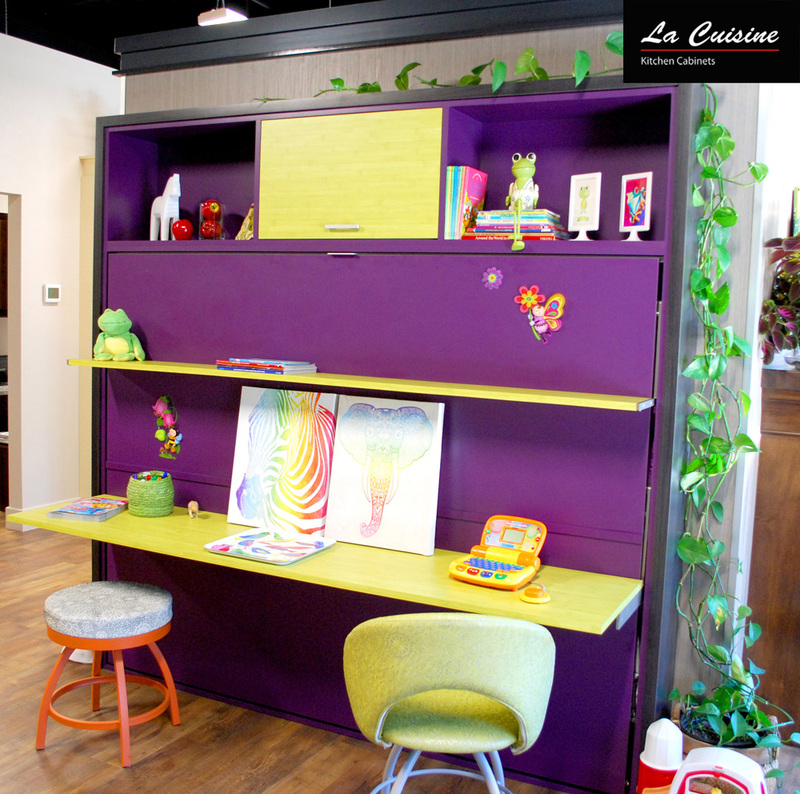 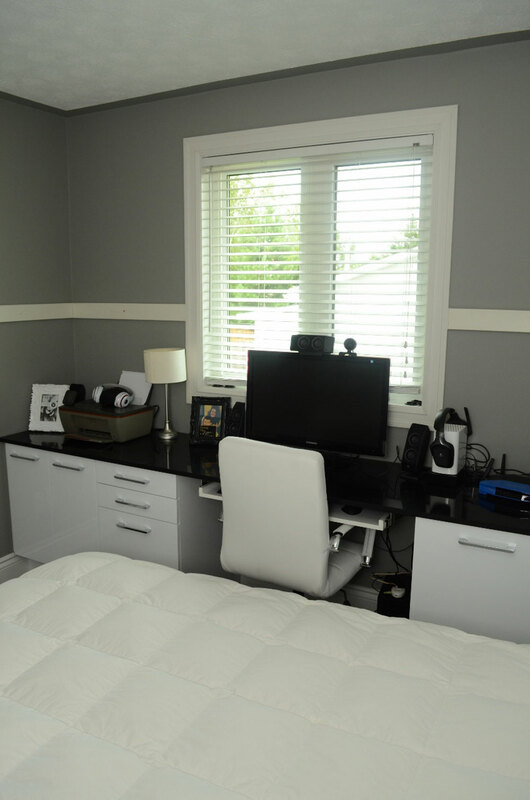 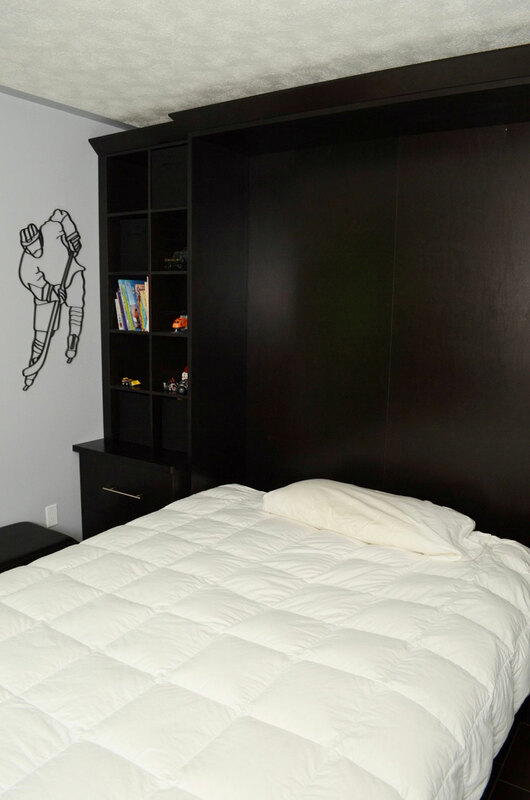 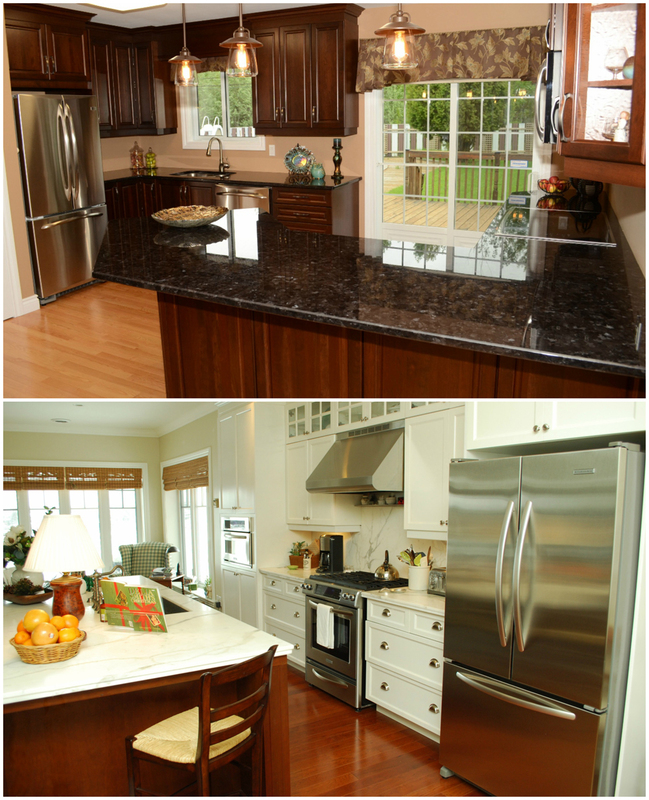 We provide our families with complete solutions, inspiring designs, and quality product. 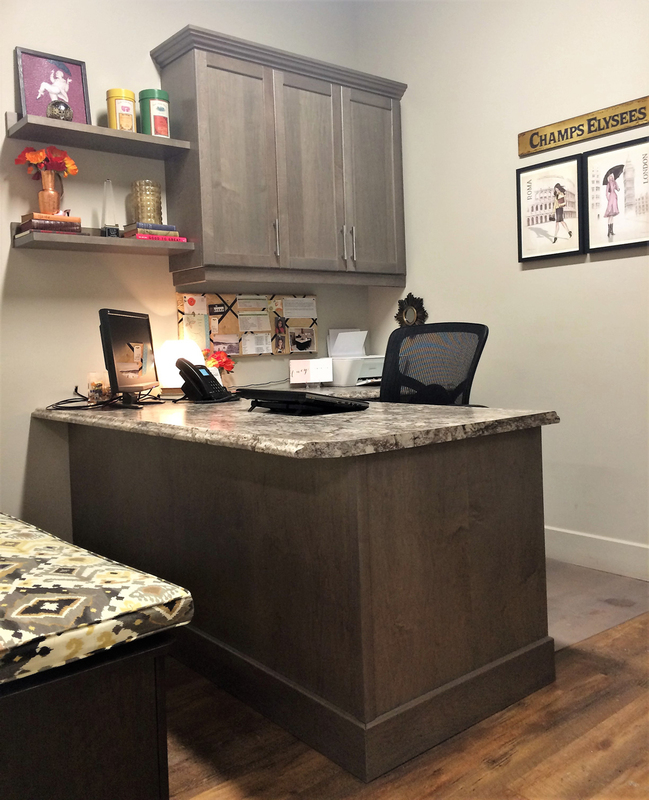 We have the experience, skill and service to make your vision a smooth reality. 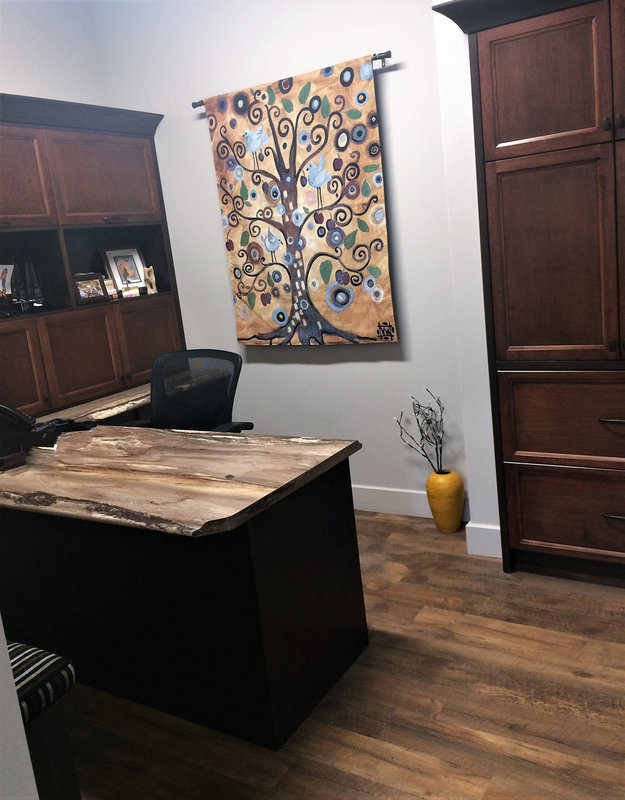 Communication is key… we are always an email or call away! 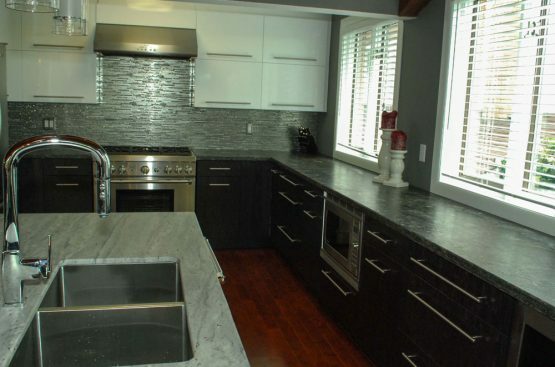 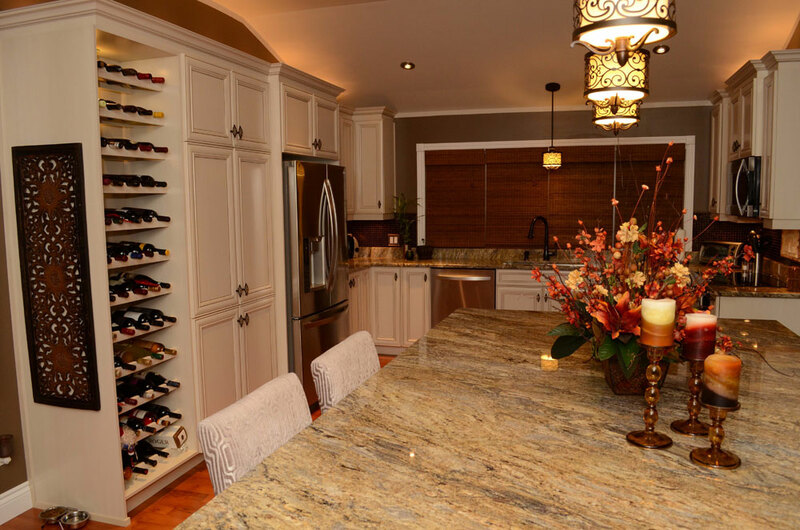 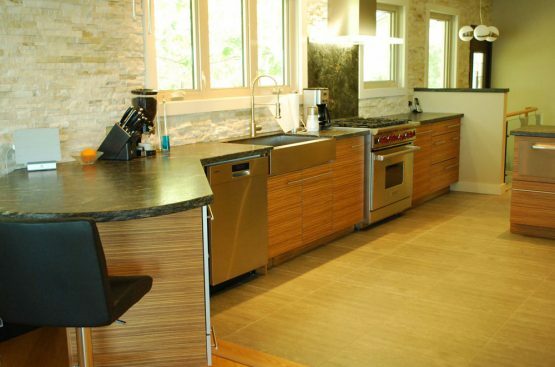 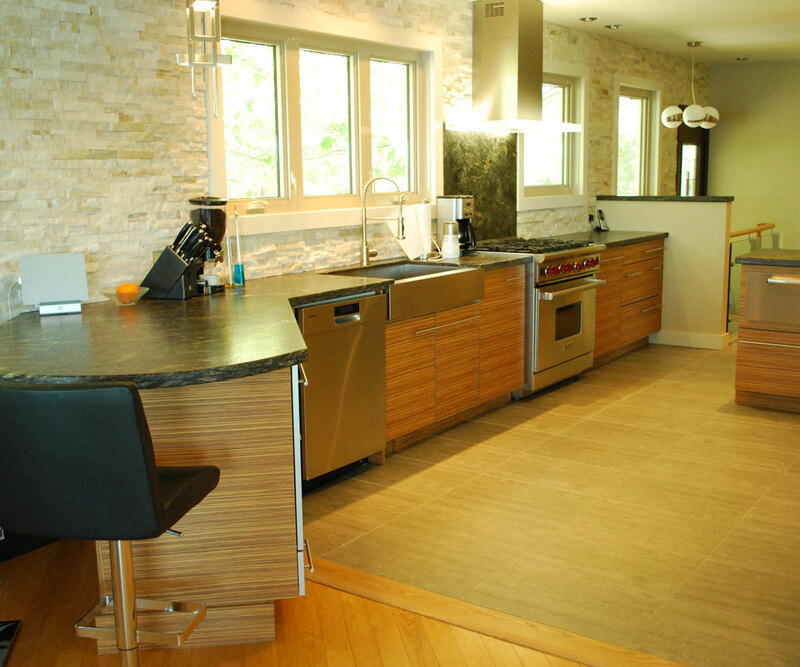 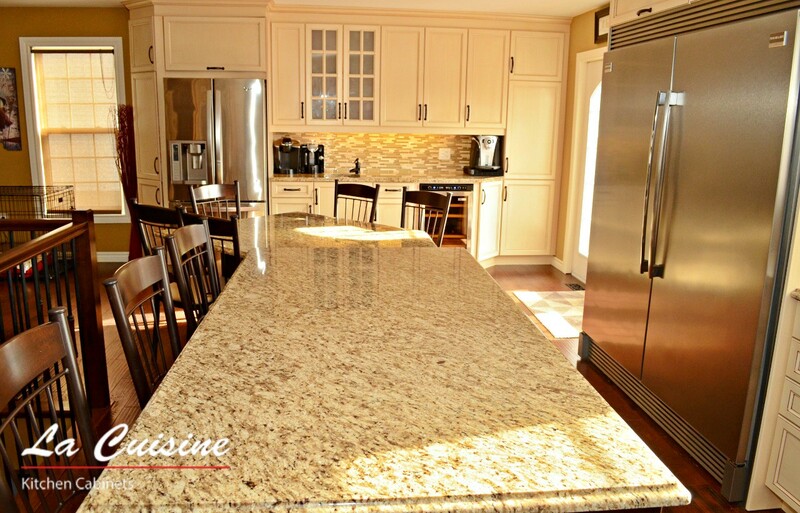 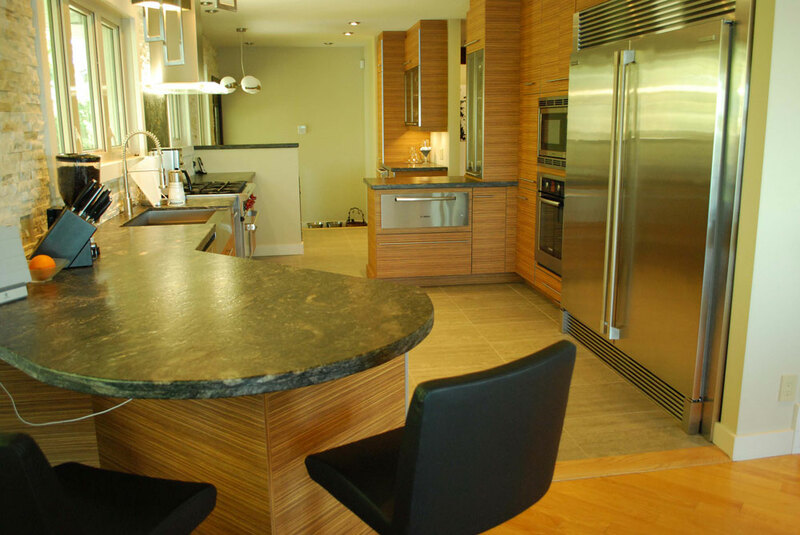 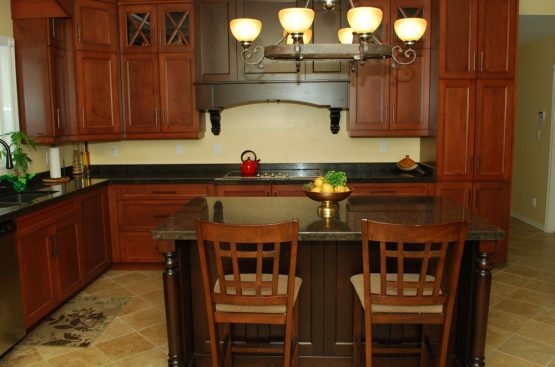 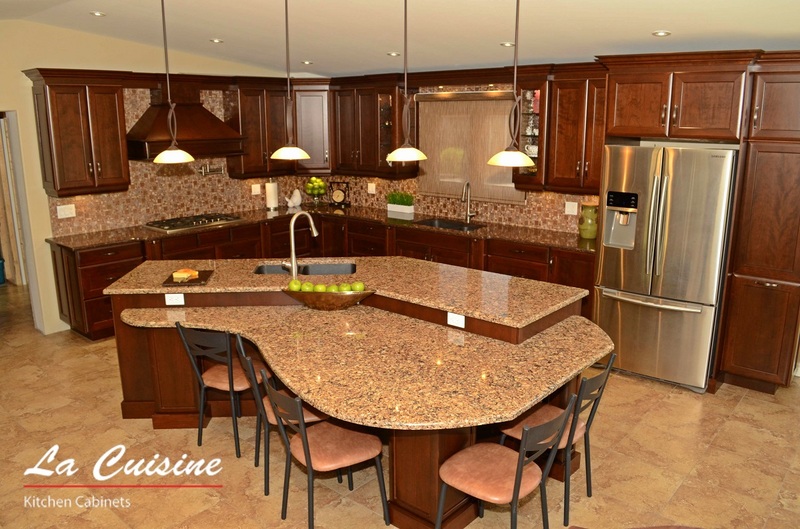 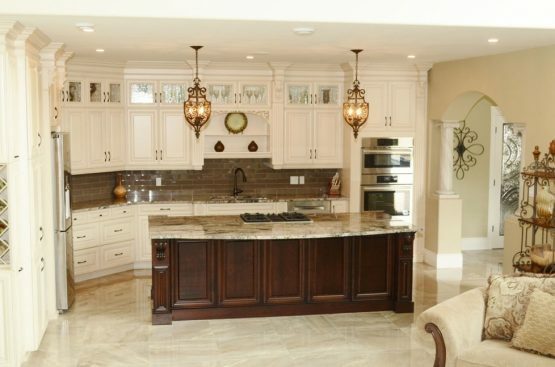 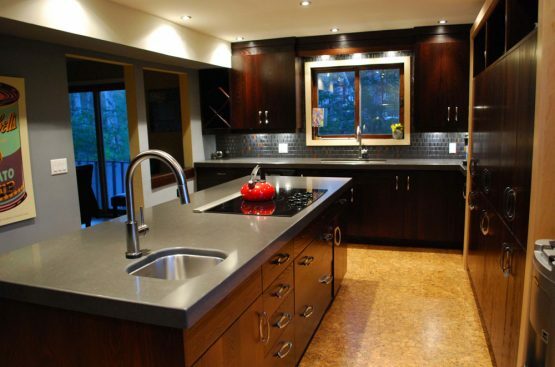 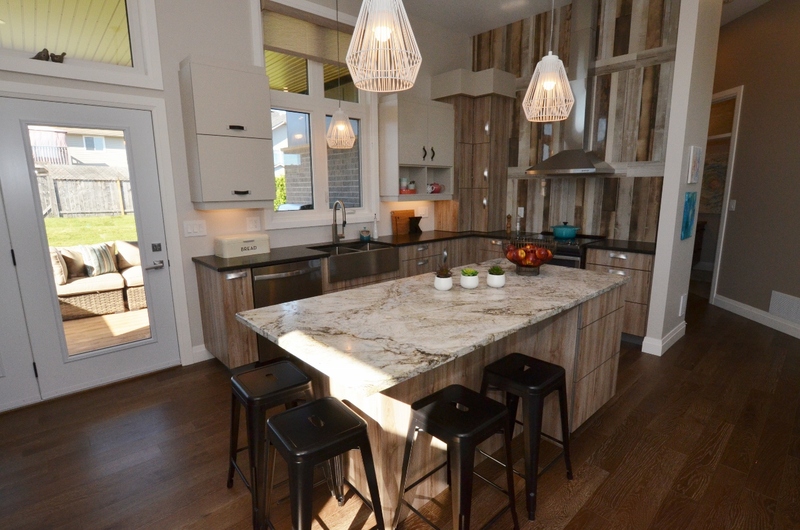 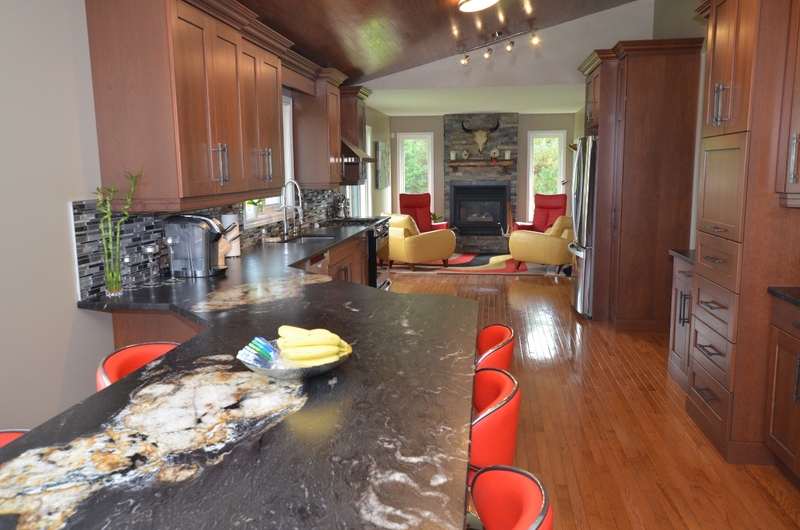 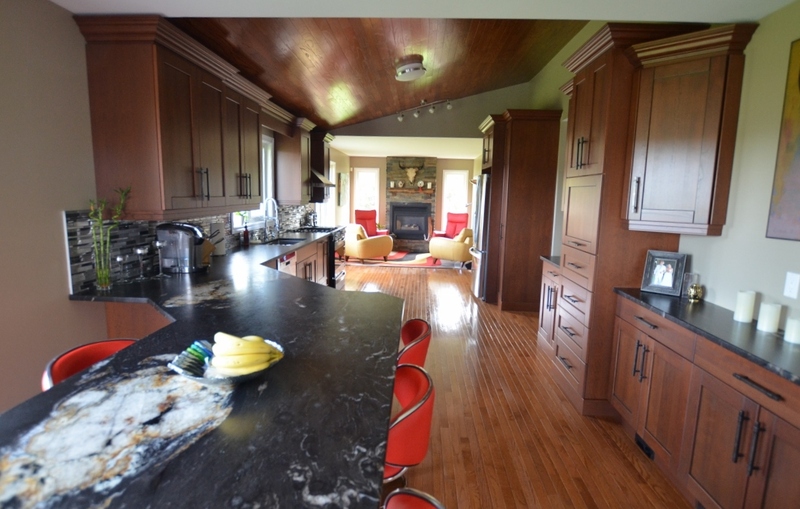 Granite was the surface selection for this kitchen. 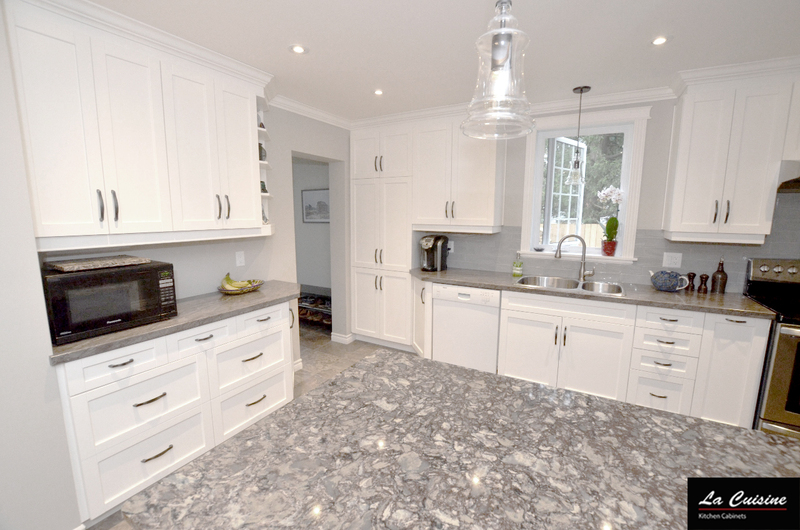 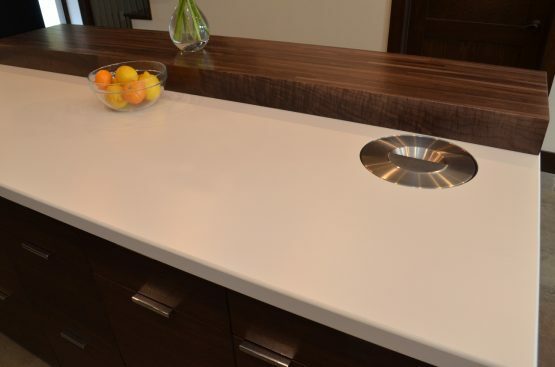 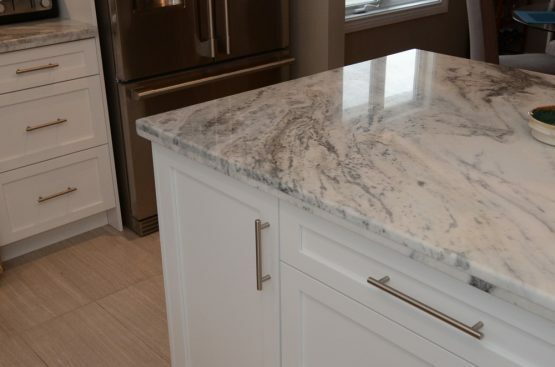 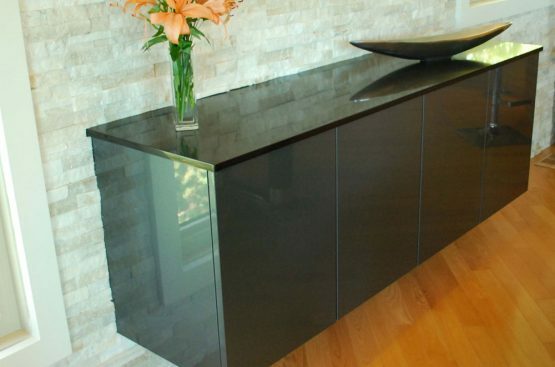 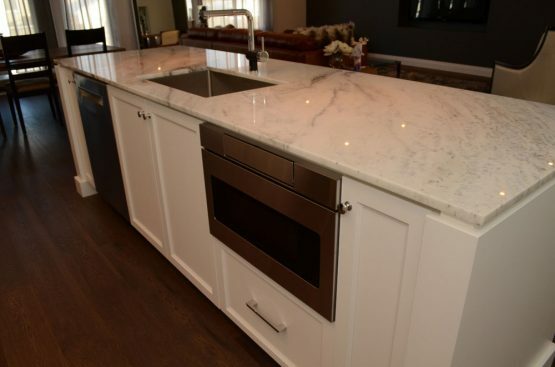 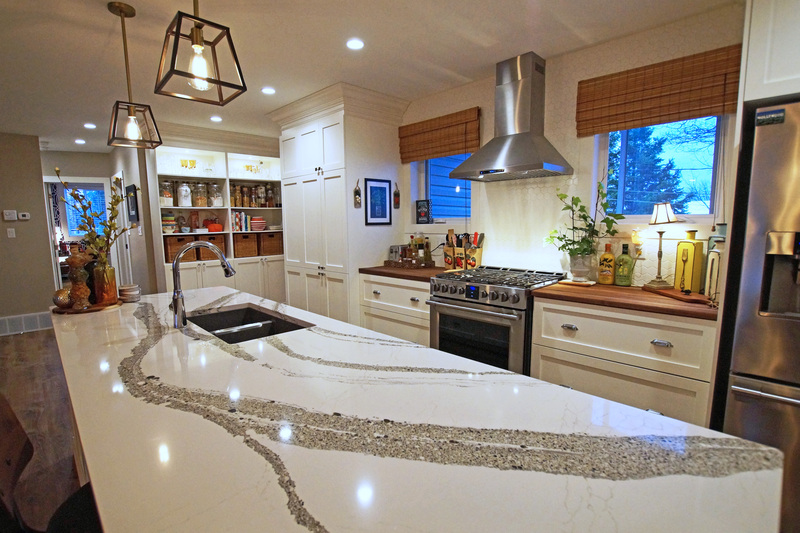 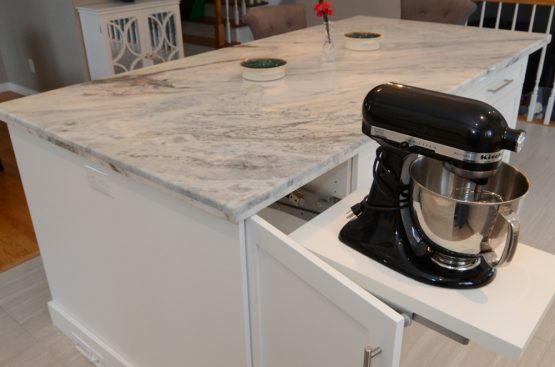 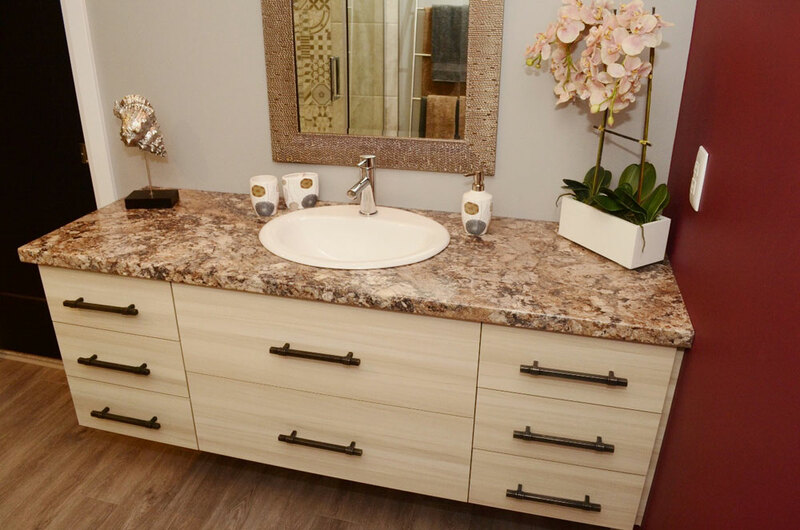 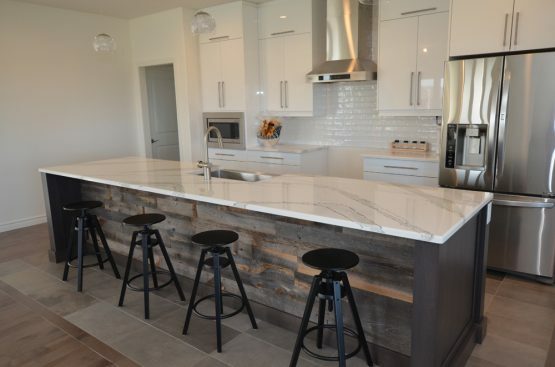 Granite is not an in-store acquisition, however, we do offer a wide variety of Quartz from Cambria and Prémoulé (Silestone and Ceaserstone) as well as an array of colours and finishes of laminate counters (Bélanger Laminés). 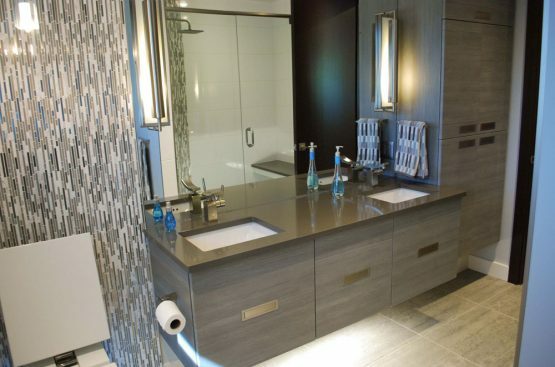 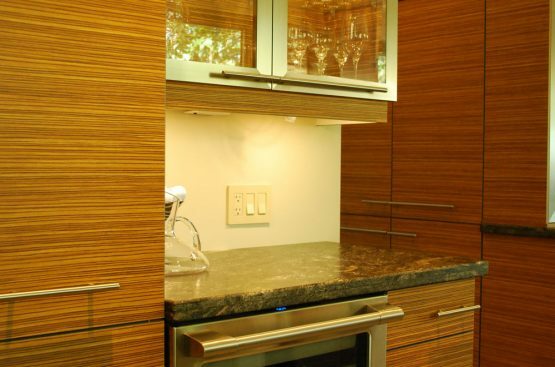 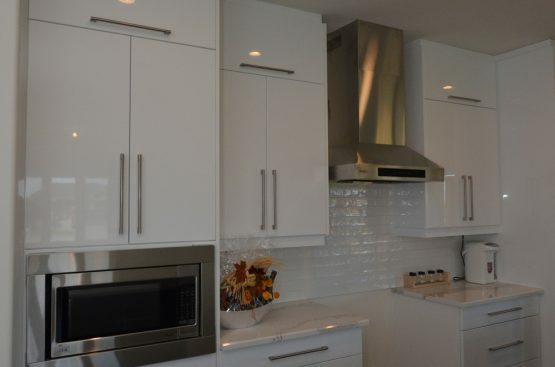 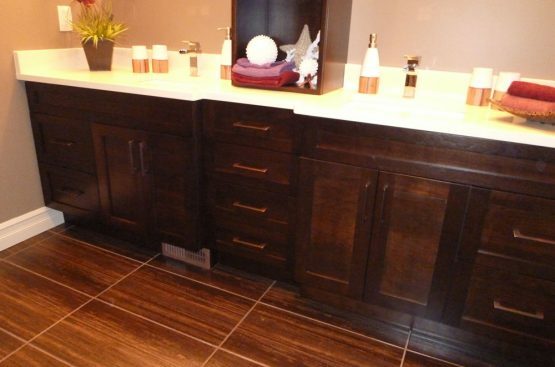 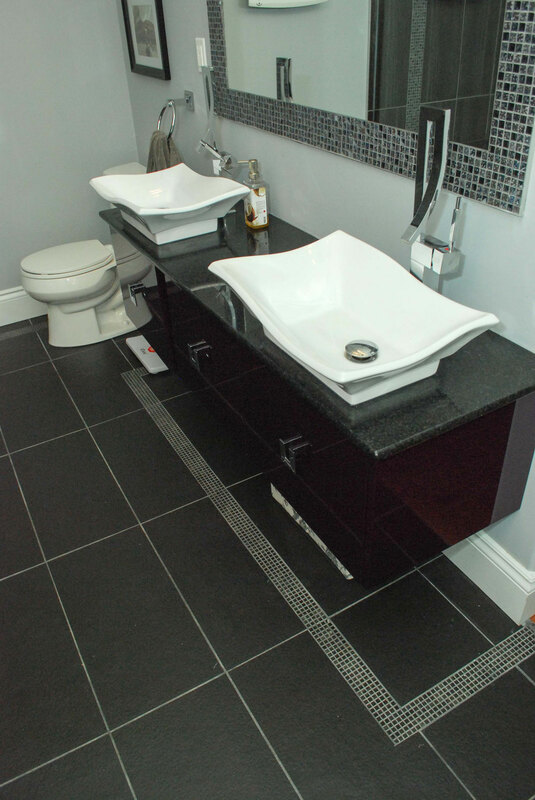 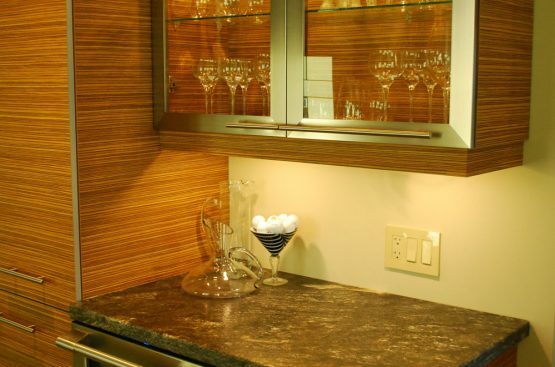 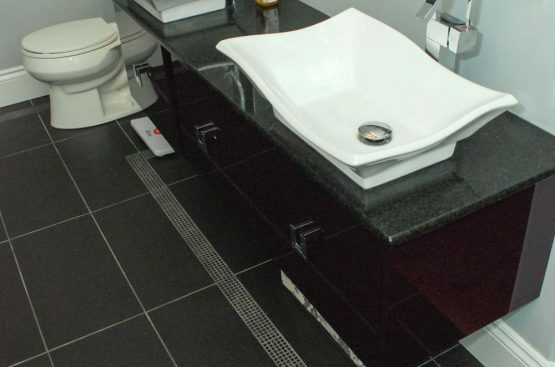 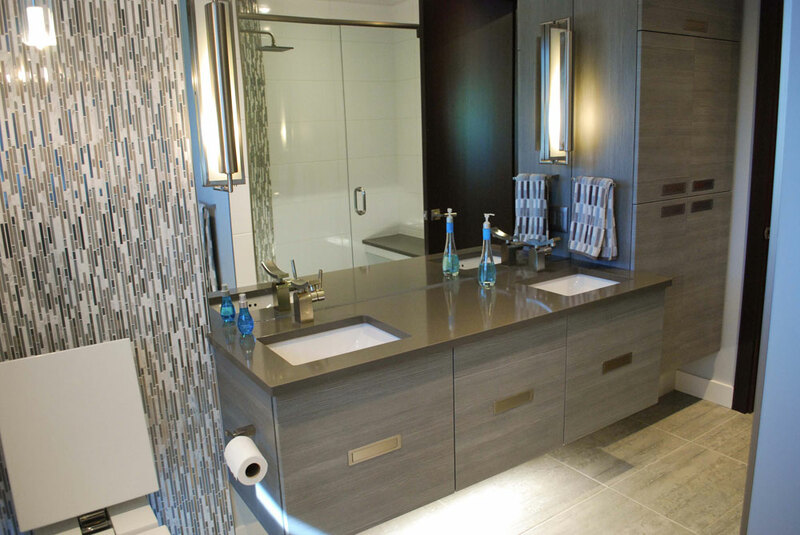 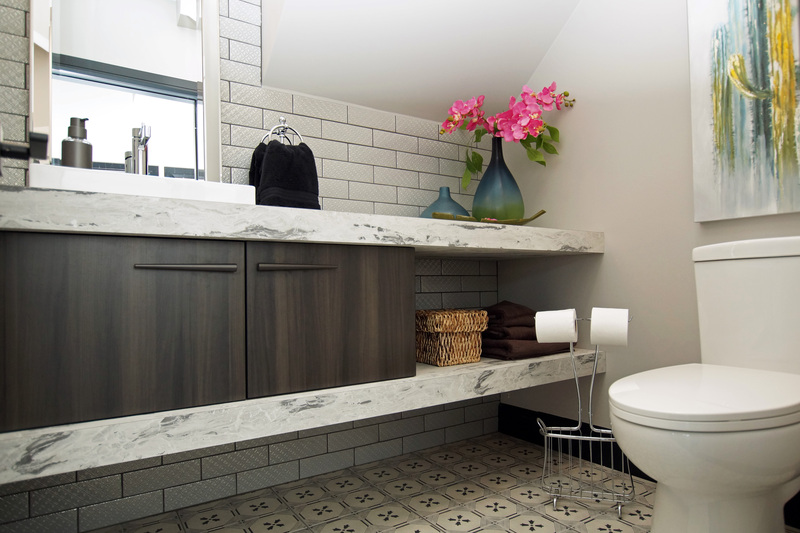 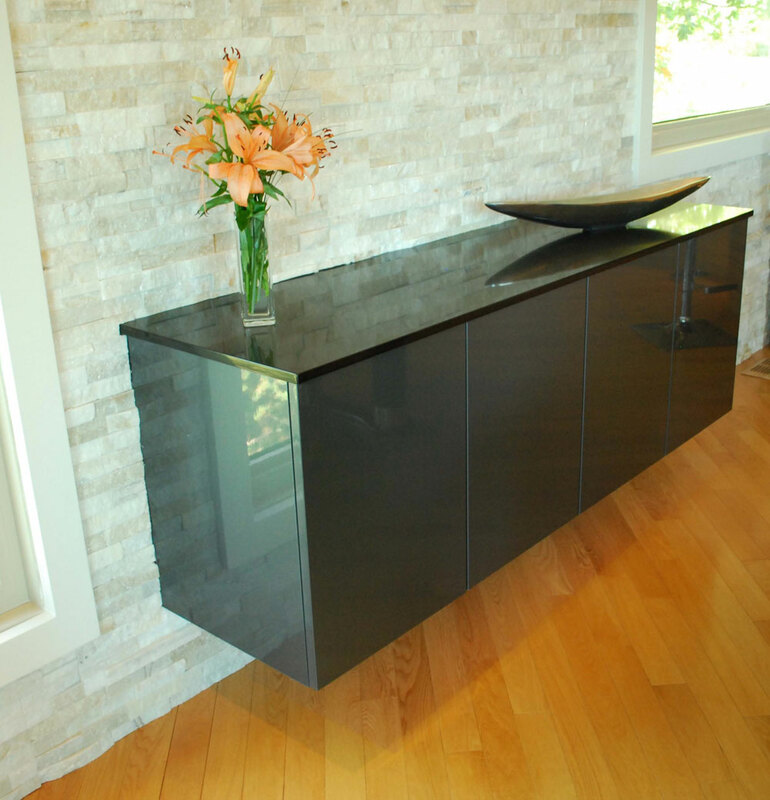 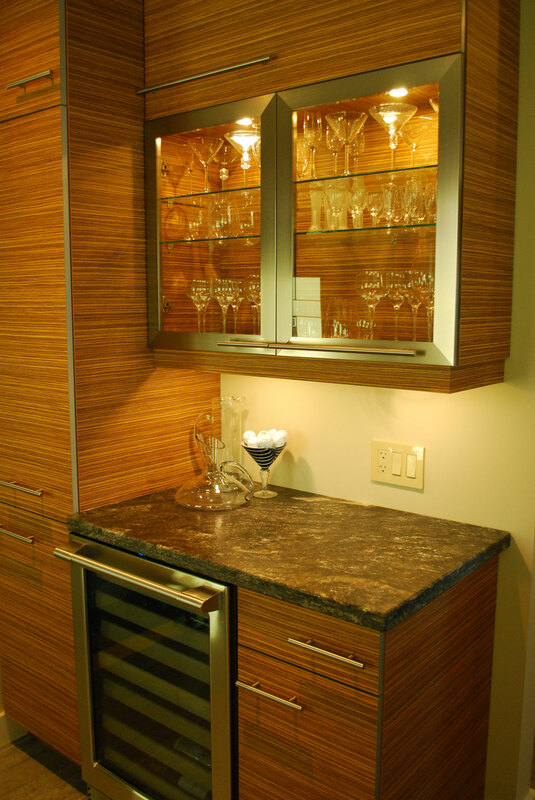 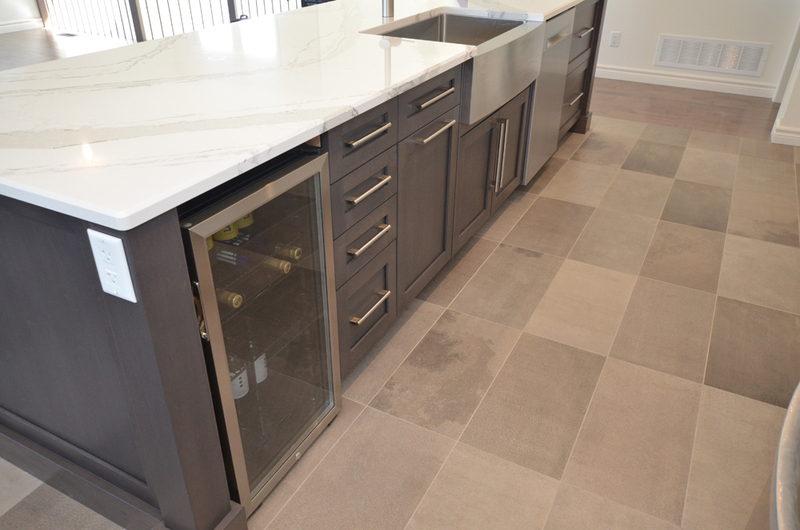 The client selected a beautiful tile backslash that is not available in house. 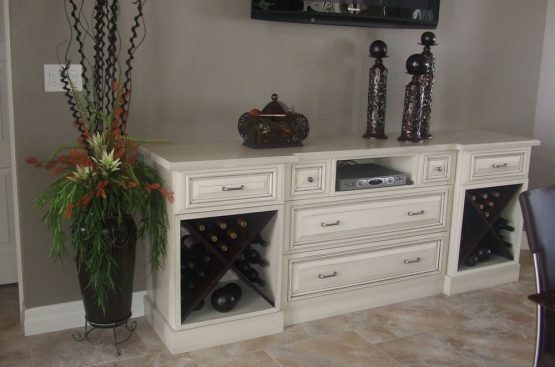 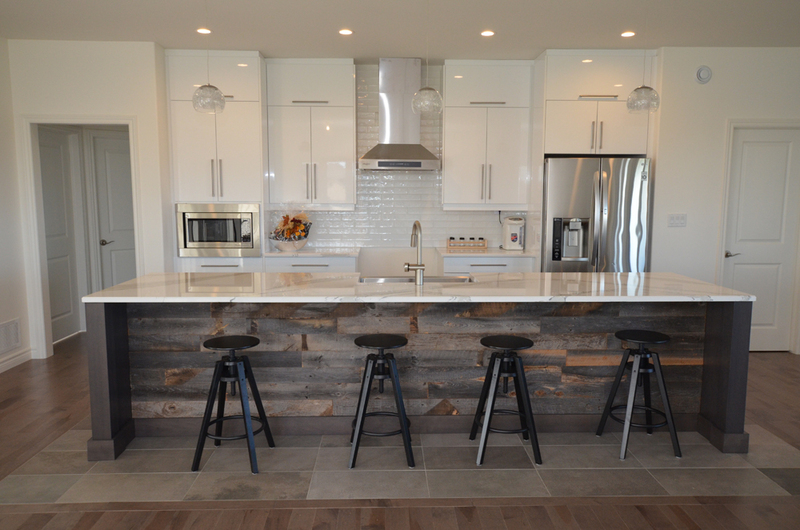 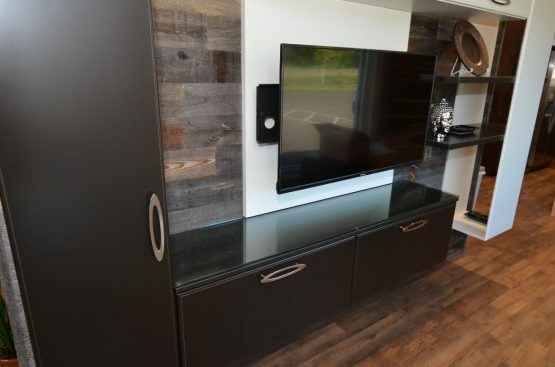 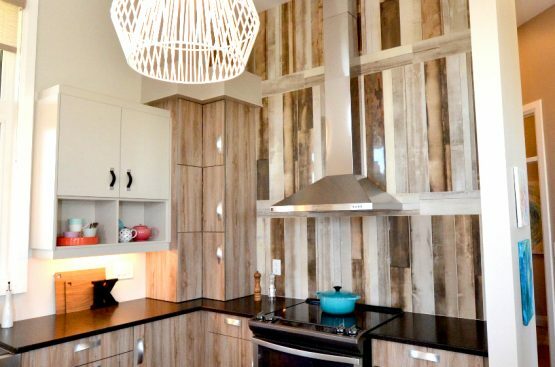 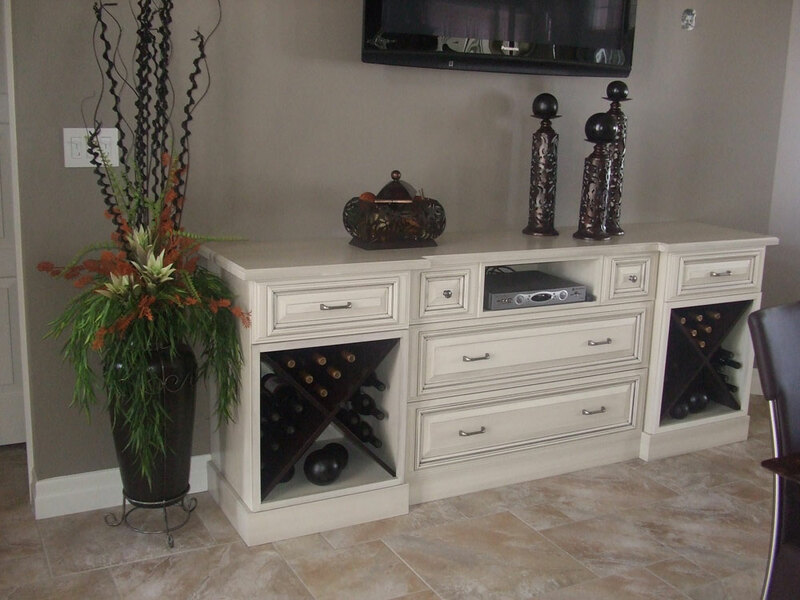 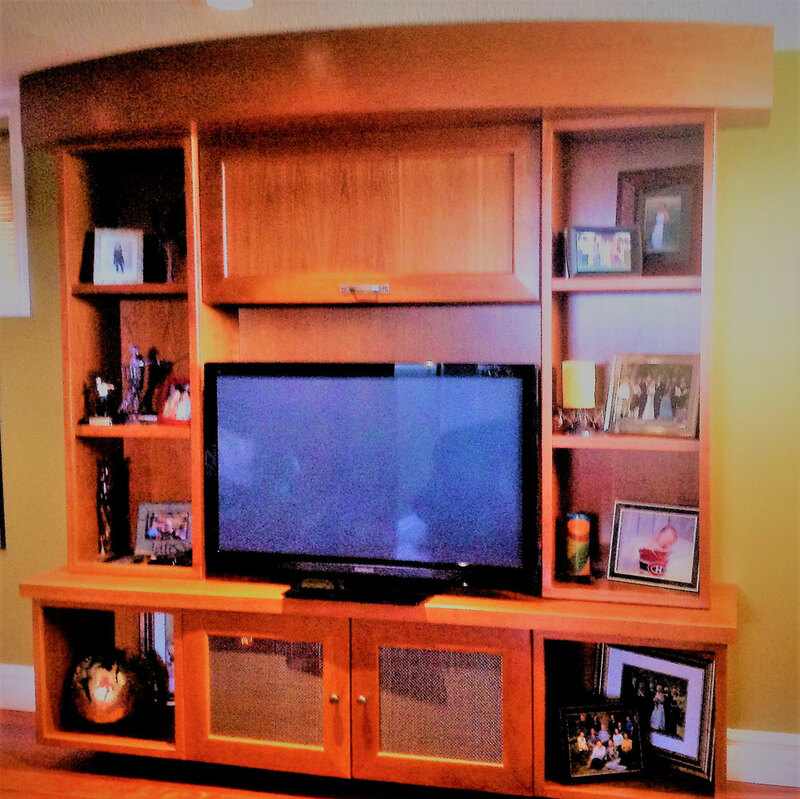 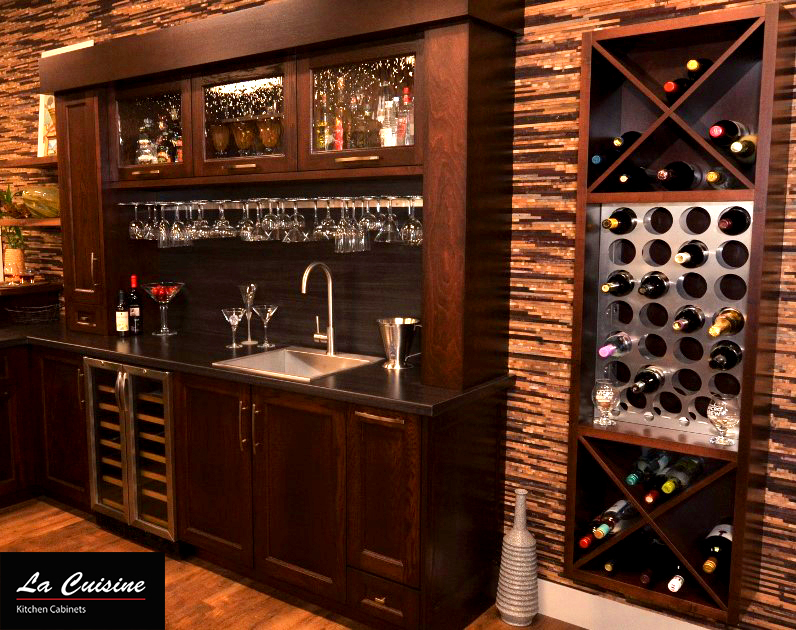 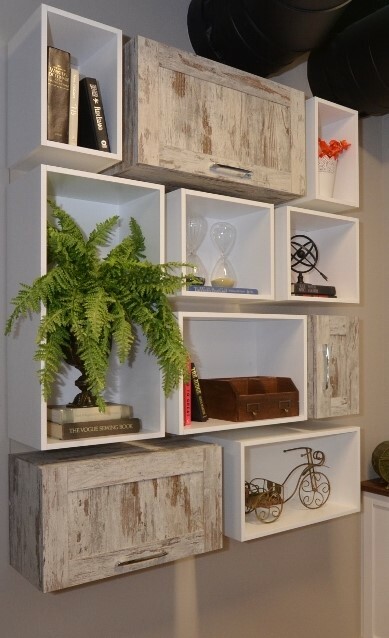 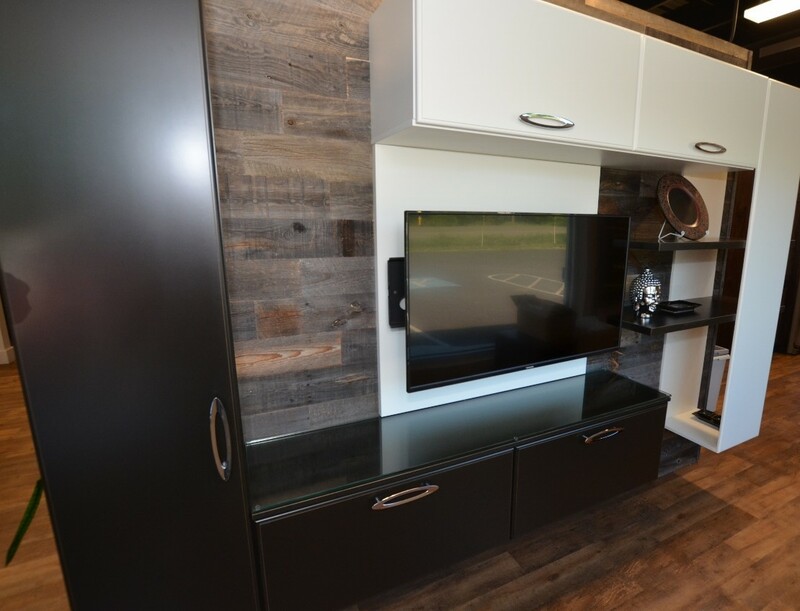 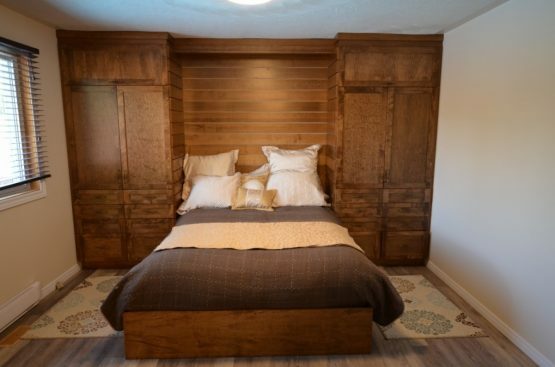 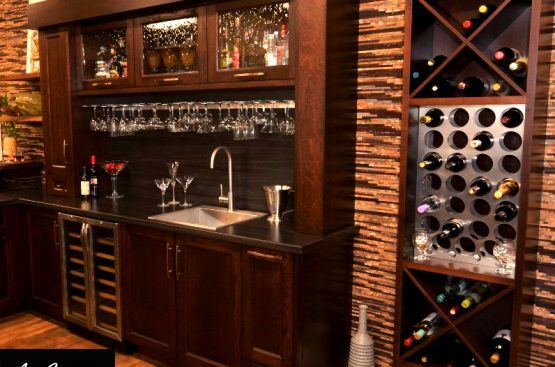 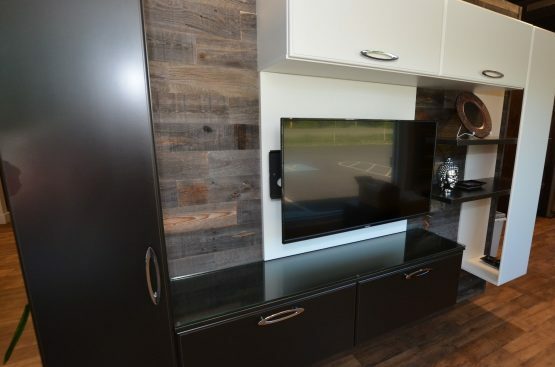 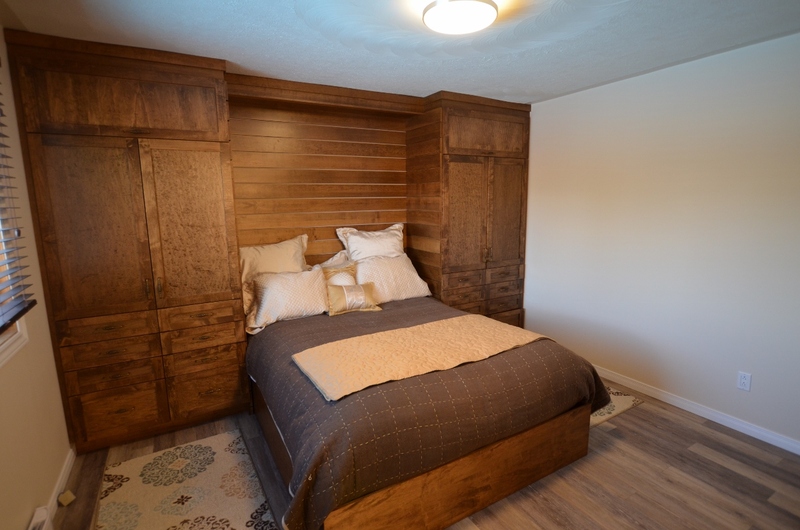 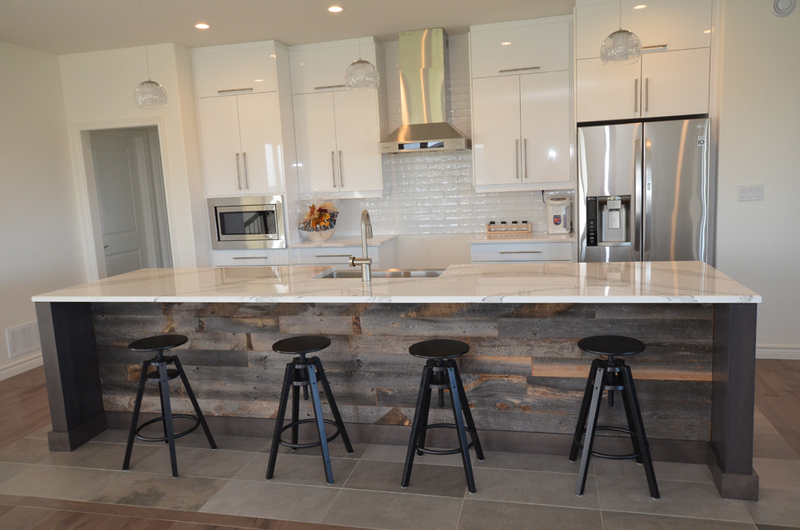 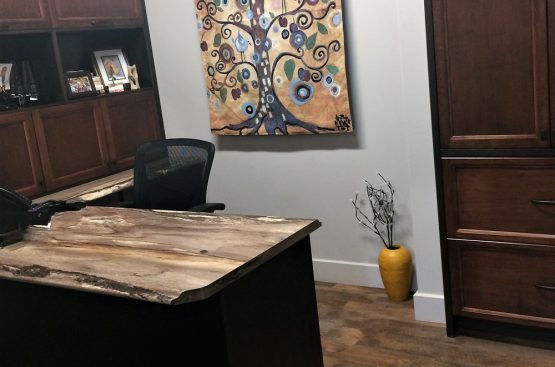 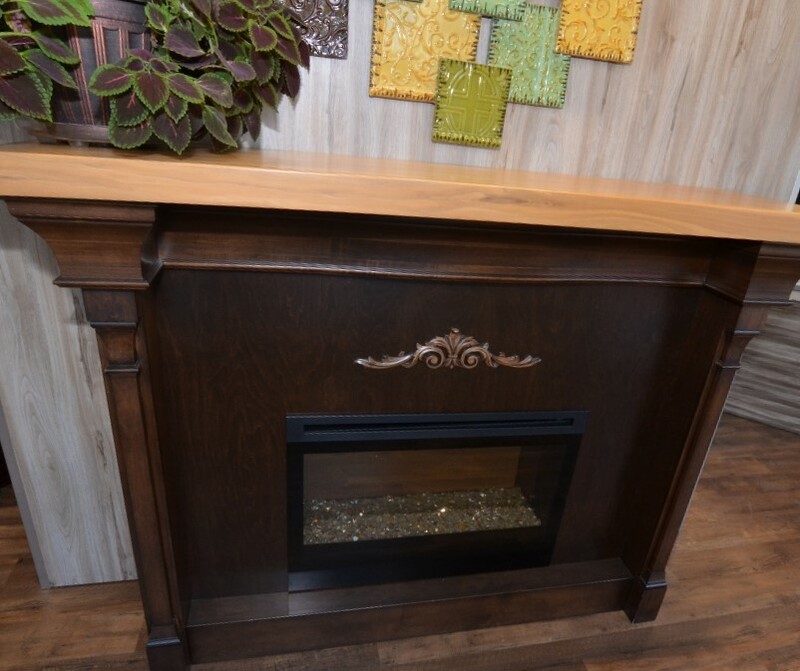 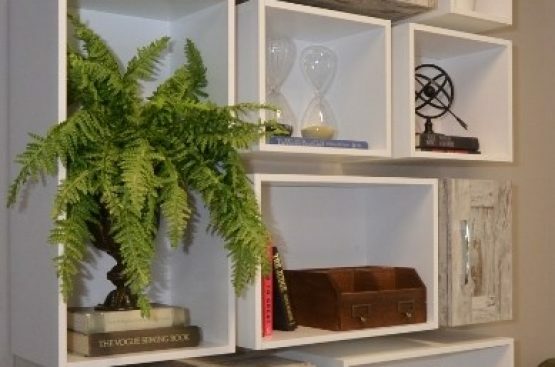 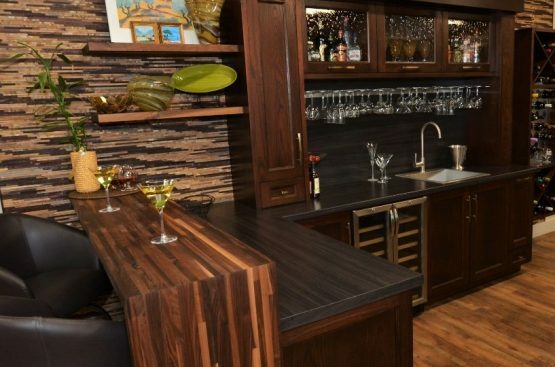 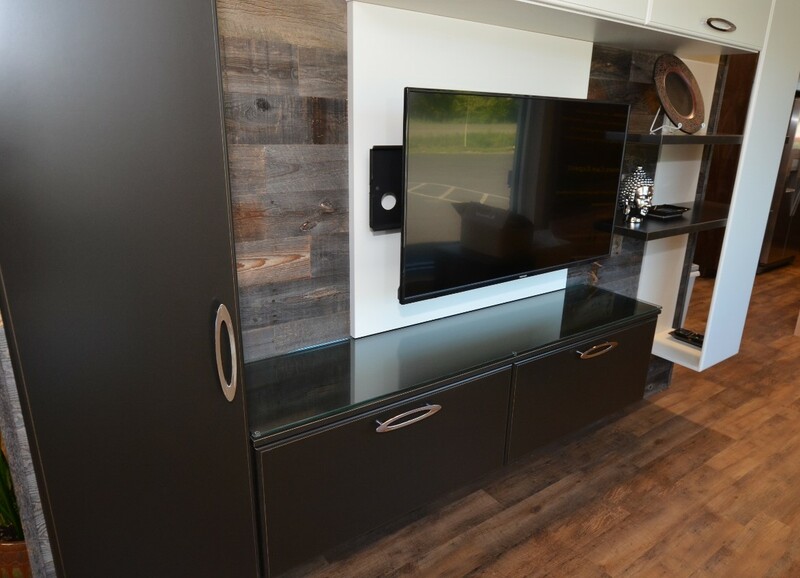 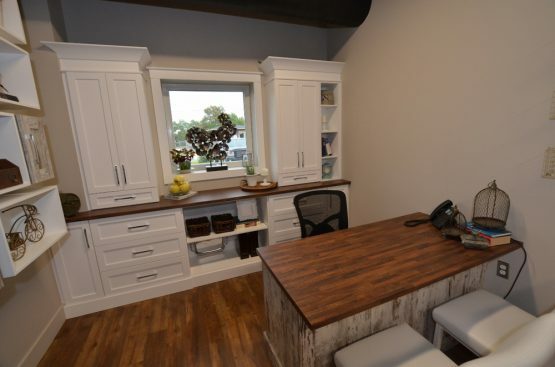 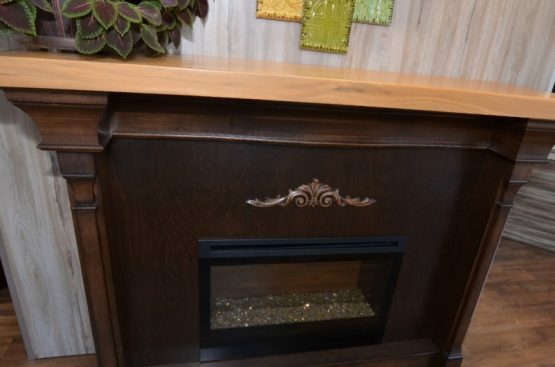 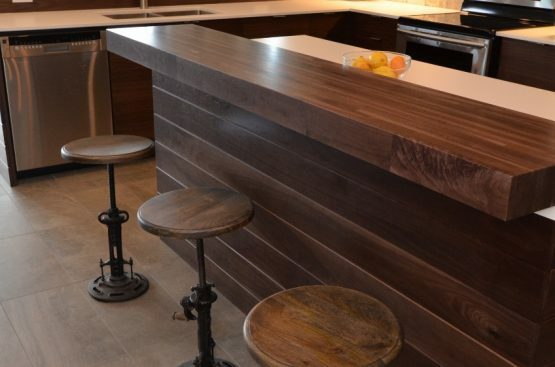 Conversely, we do offer various wall appliqués such a refurbished barn wood and refurbished wine barrels as well as wall laminates and stone veneers. 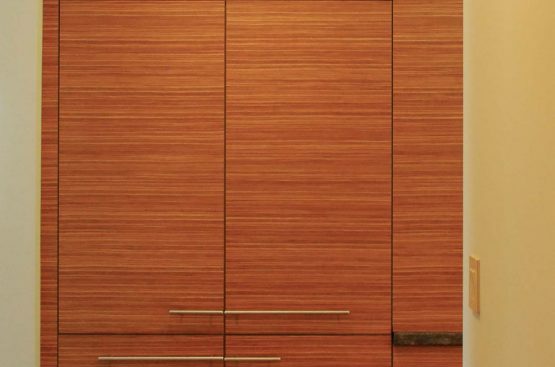 Here we have cherry wood Stratford wide-frame doors finished with a Harvest stain and Chocolate glaze. 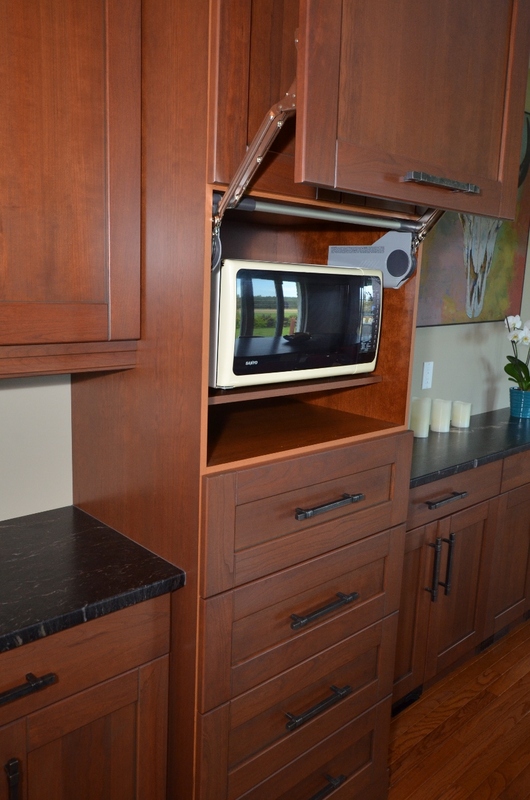 The interior features maroon door grade melamine. 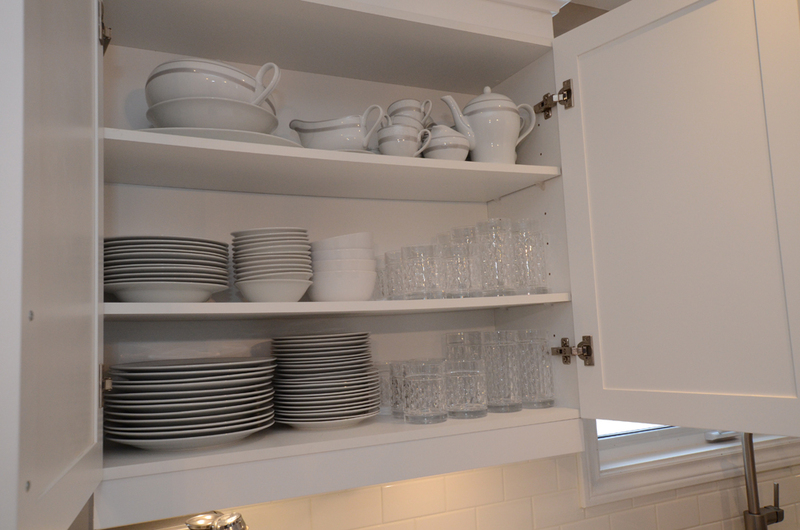 All upper cabinets are 36”high. 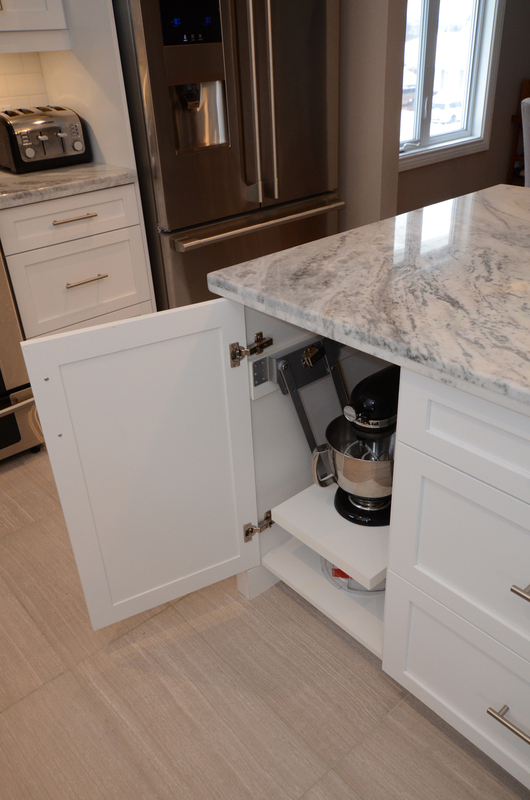 The depths vary pending on location - 14”, 16”, 24” & 30” deep uppers as well as base cabinets’ with variant custom depths. 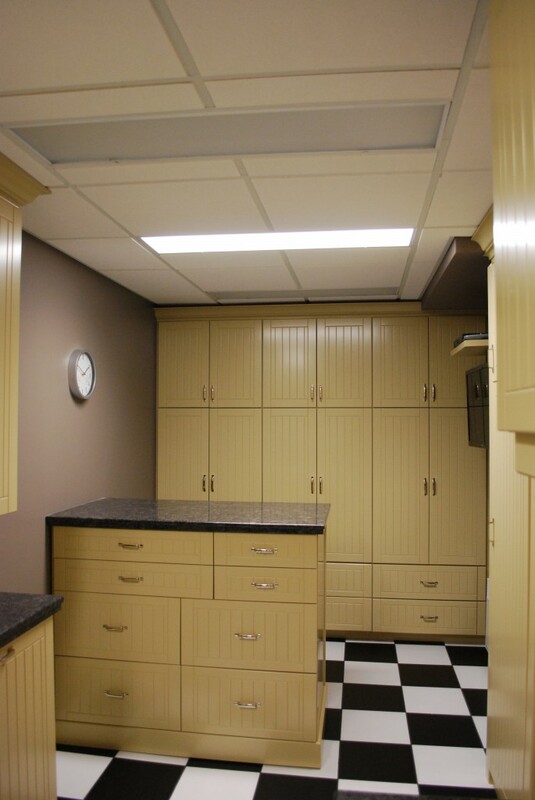 Complete with flush and recessed toe kicks and light shields as well as beautiful crown molding. 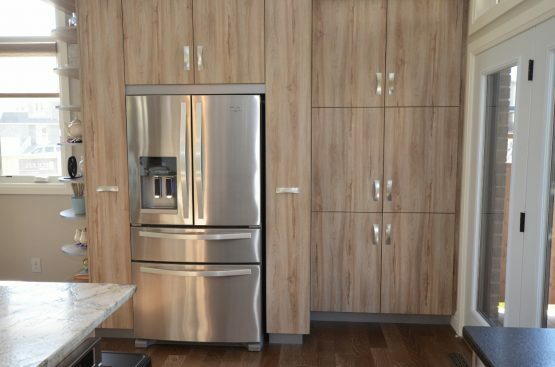 This kitchen features many unique touches such as a hide-away microwave with an Aventos HL mechanism for effortless opening and smooth closing for parallel-opening doors. 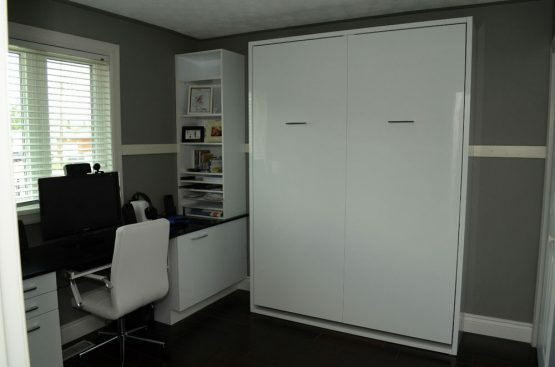 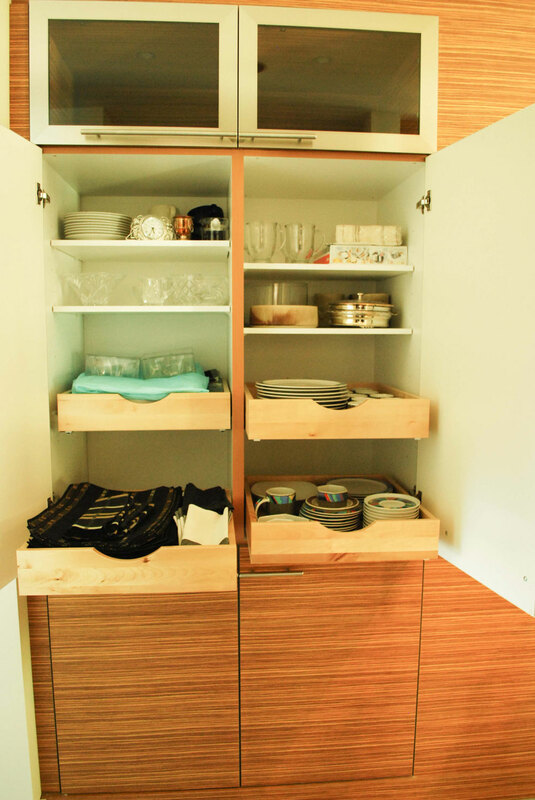 All doors are equipped with soft-closing Blum hinges (lifetime guarantee). 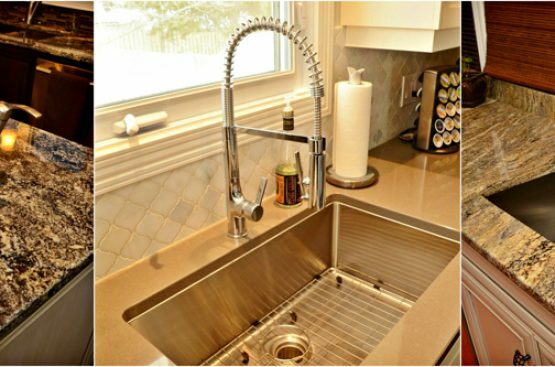 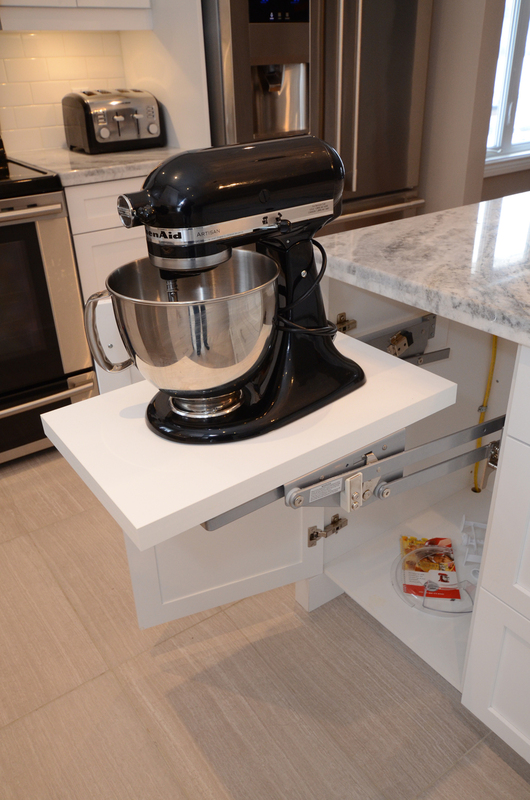 Today’s kitchen has kept up with technical advancements. 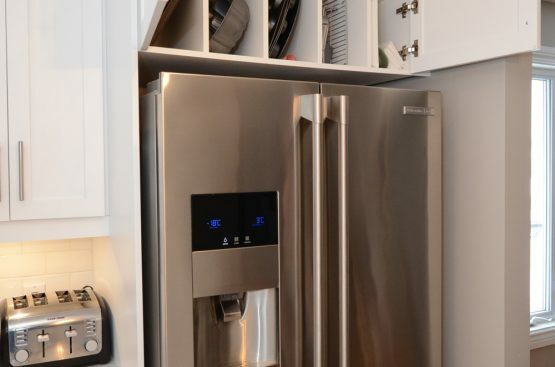 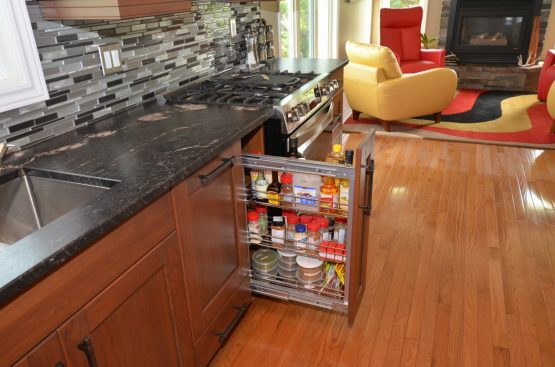 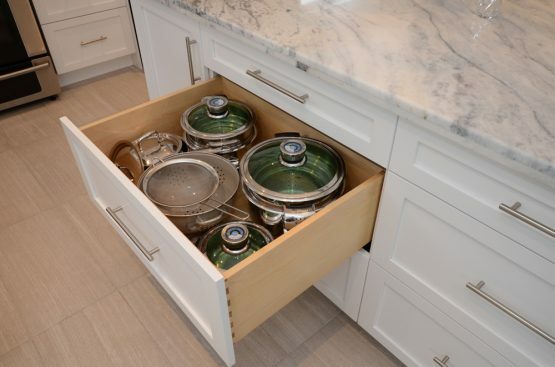 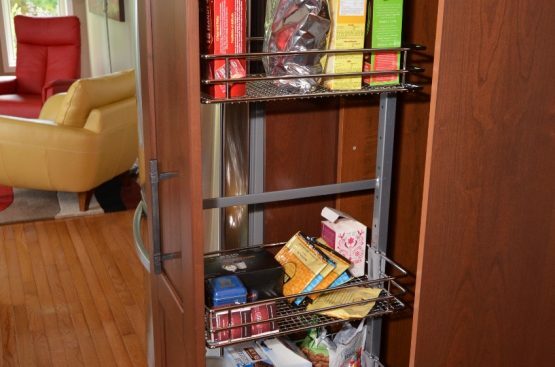 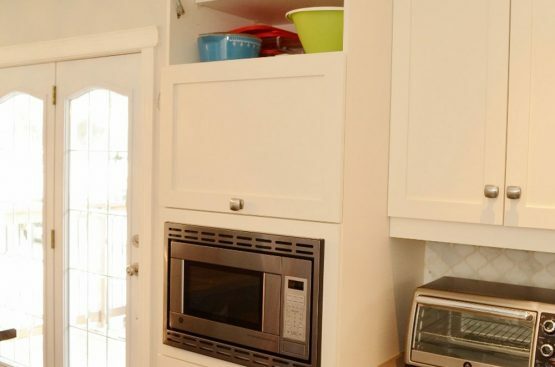 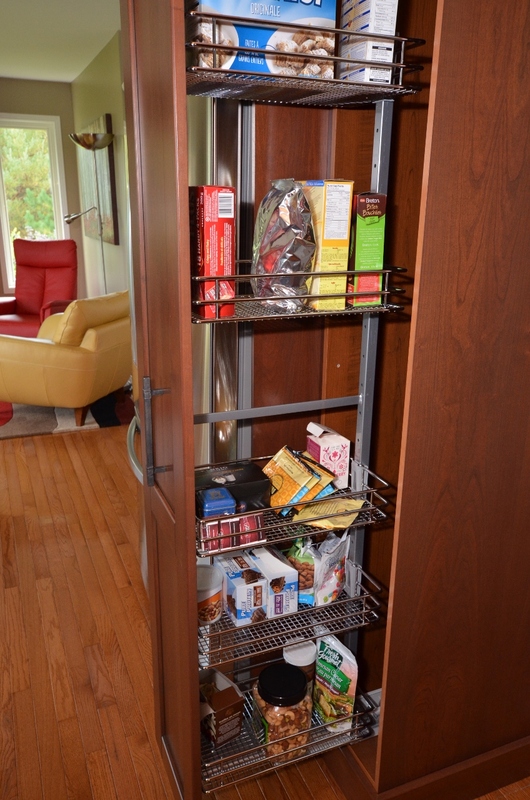 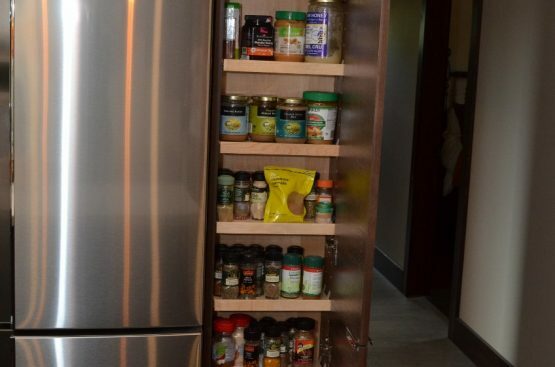 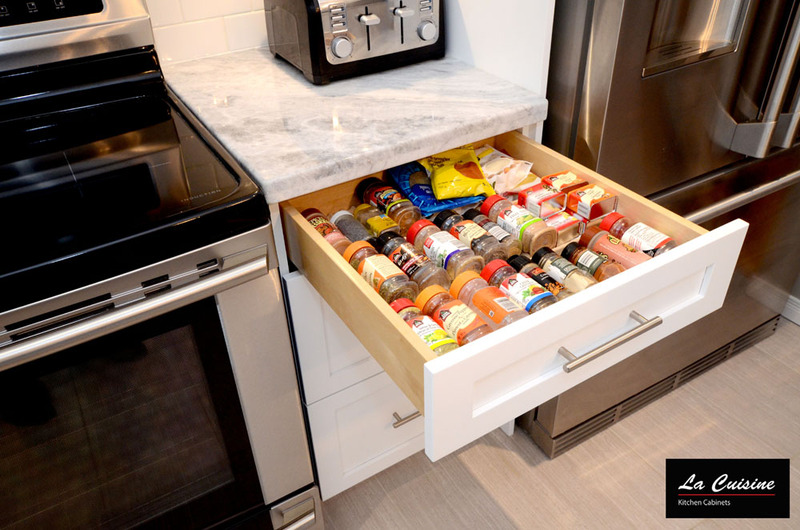 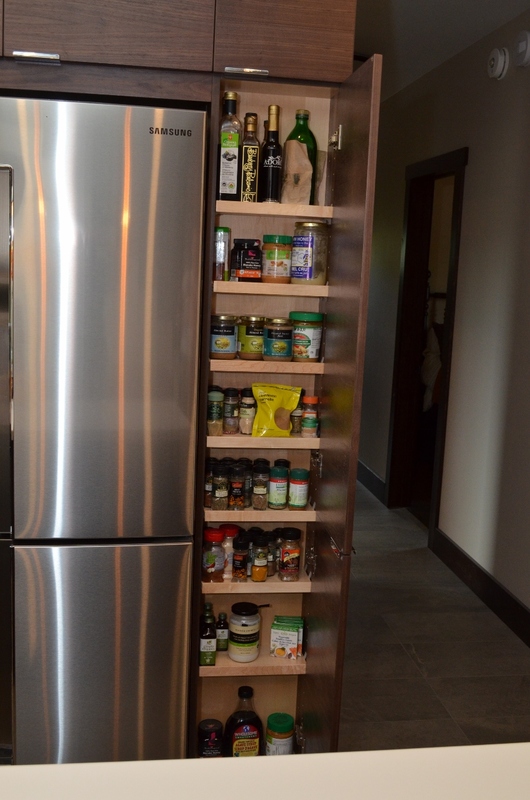 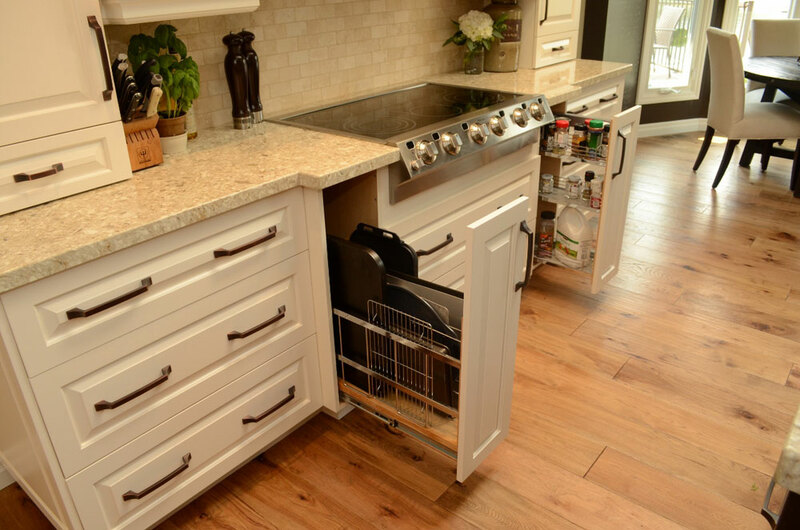 This kitchen is peppered with smart storage such as base Wire Spice Pull-Outs, a Euro Recycling Center and a Larder Unit for optimal storage in the pantry which is only some of the available accessories that truly make your kitchen flow with efficiency. 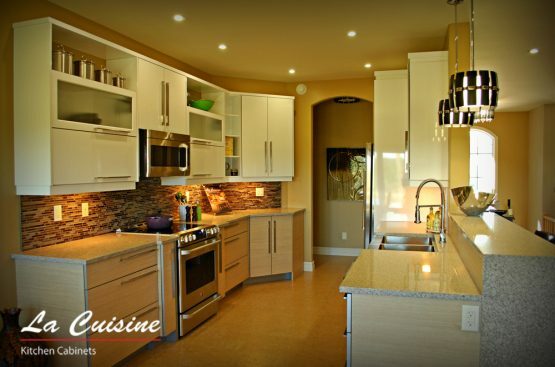 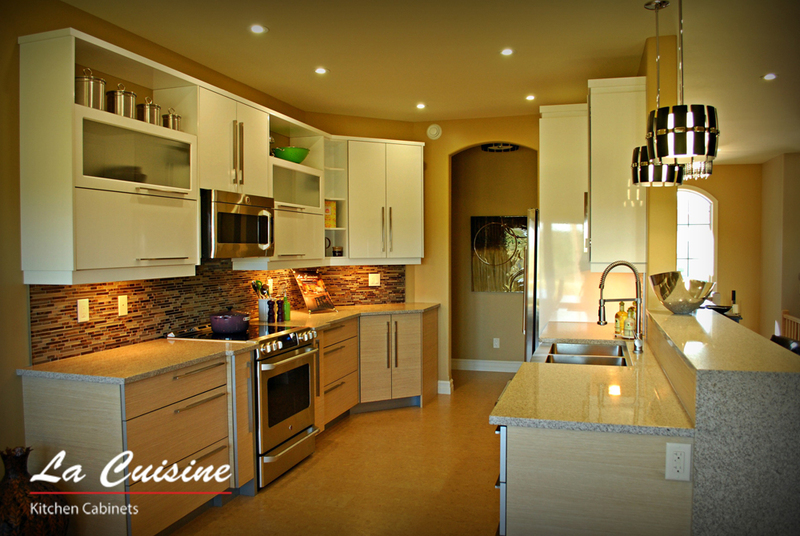 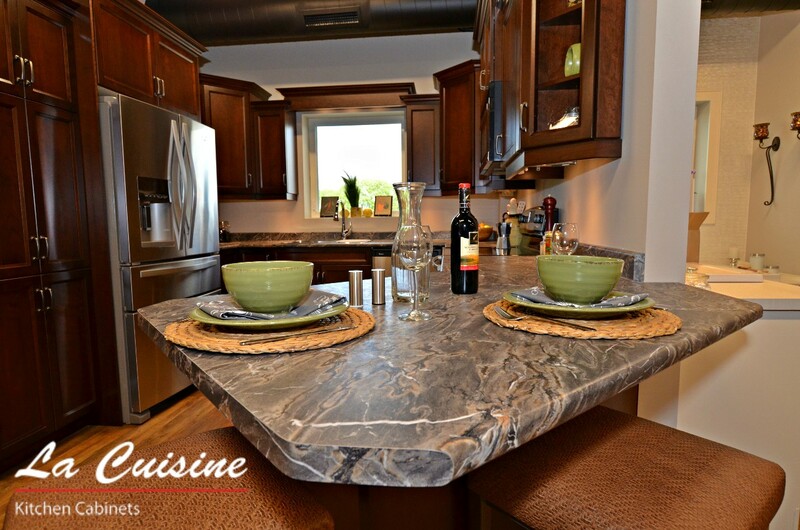 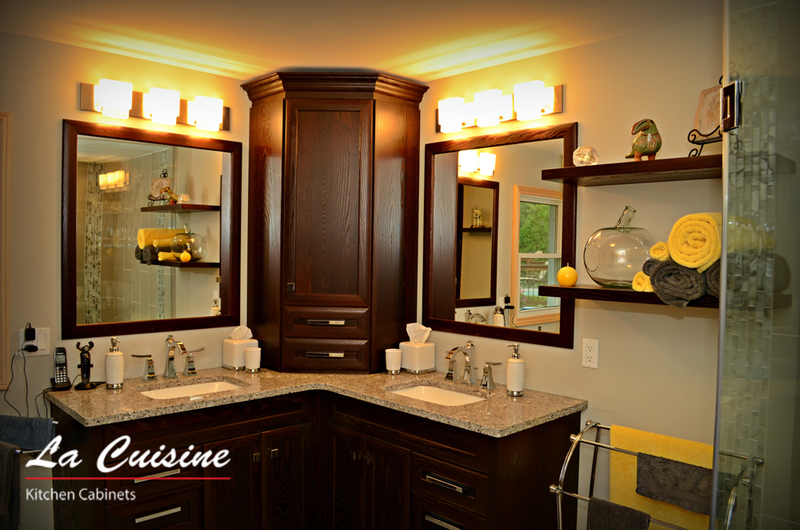 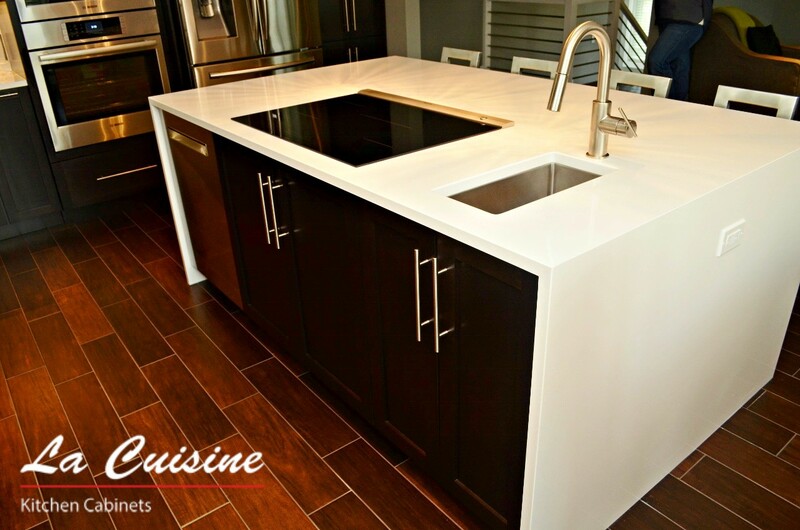 “Dealing with Paul and the La Cuisine team was a great experience. 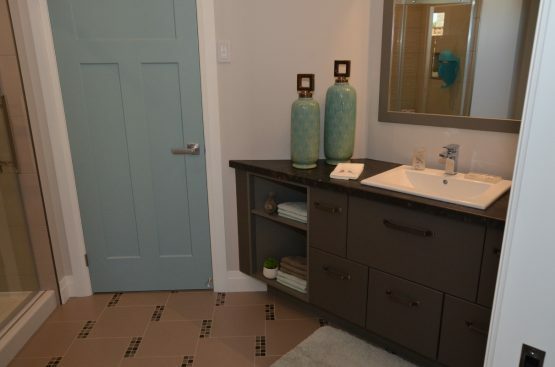 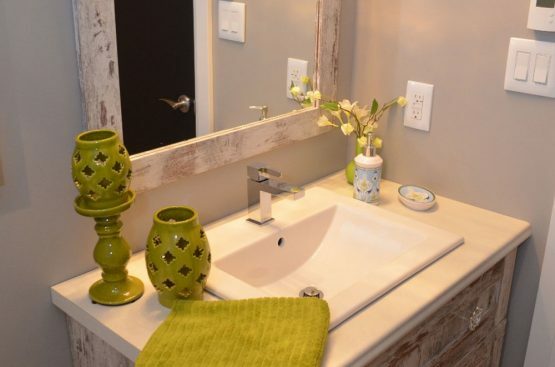 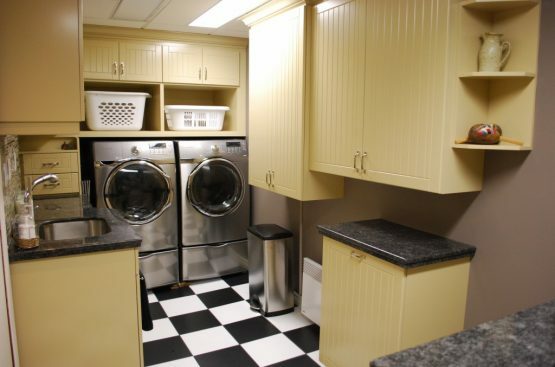 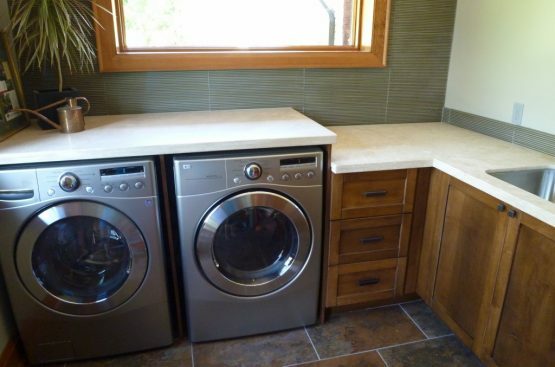 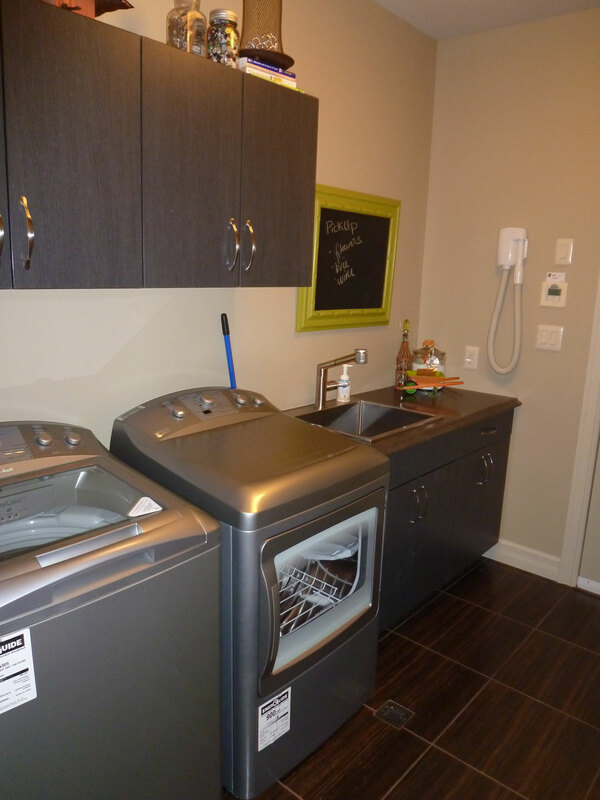 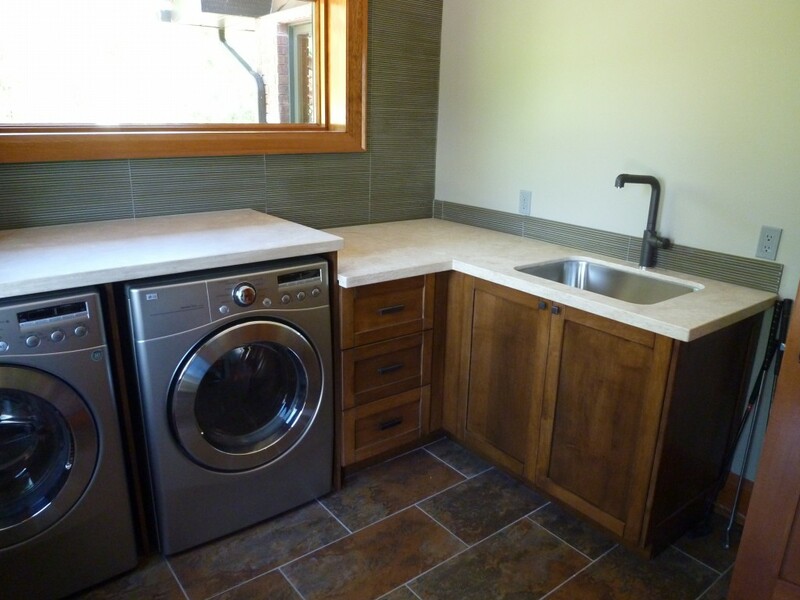 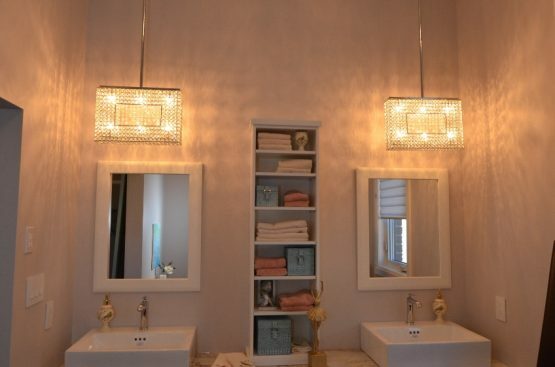 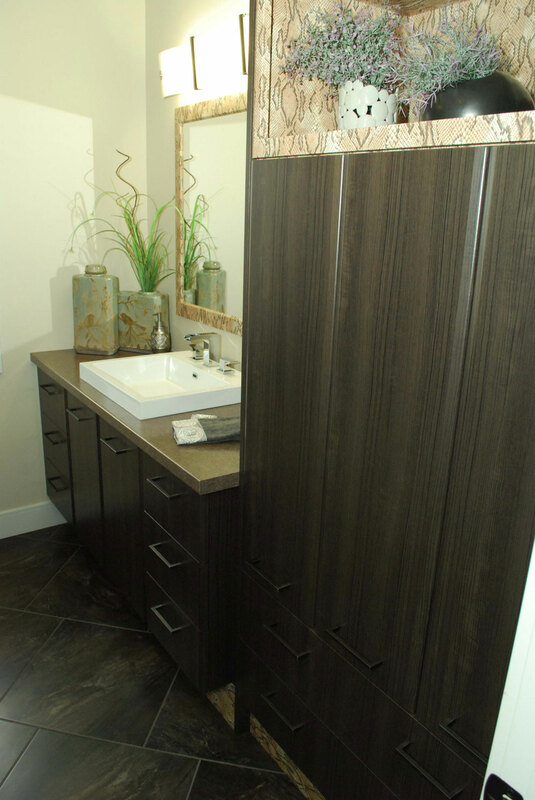 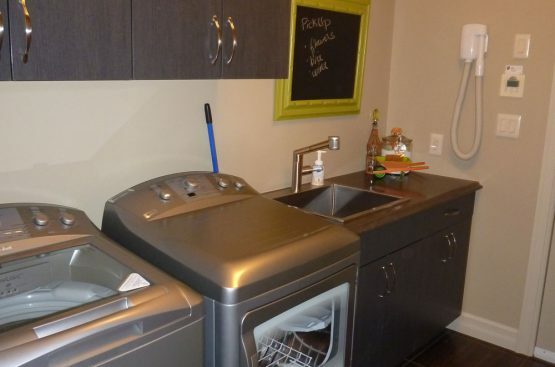 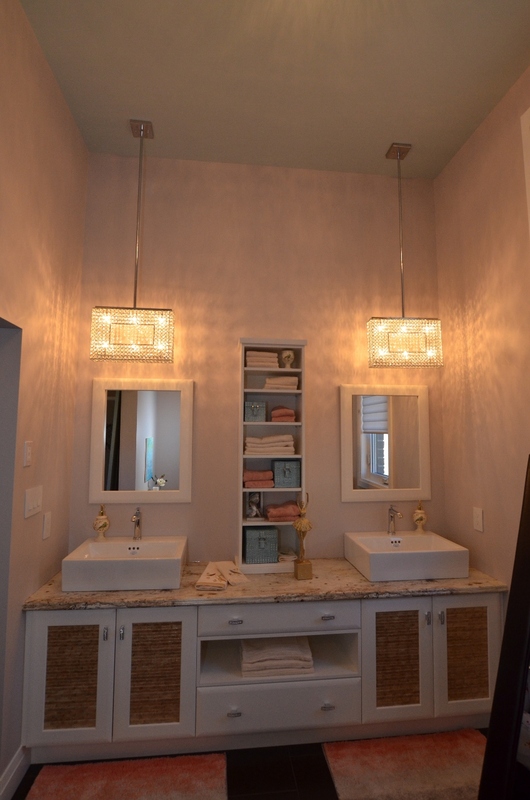 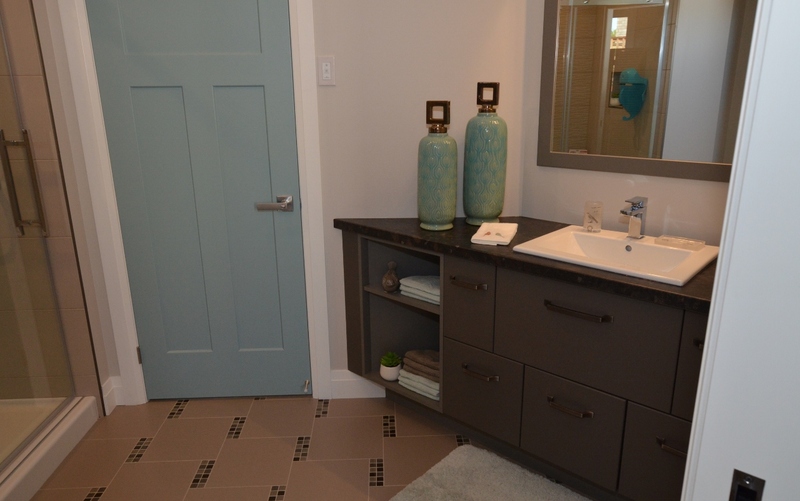 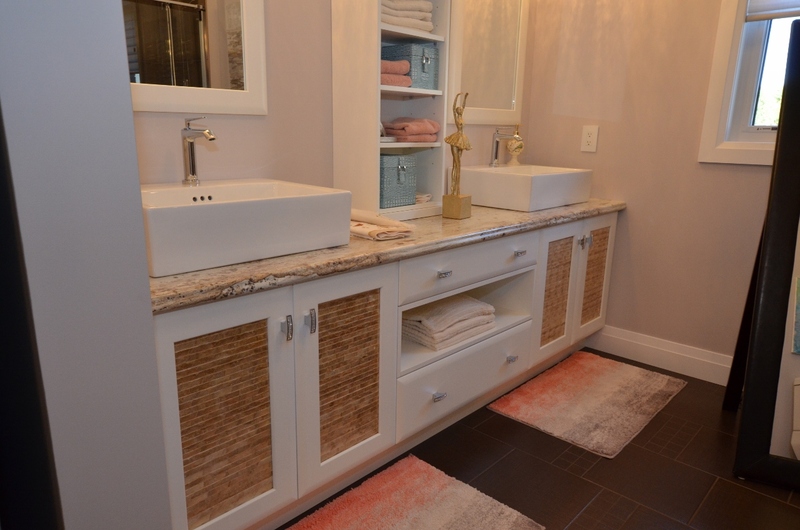 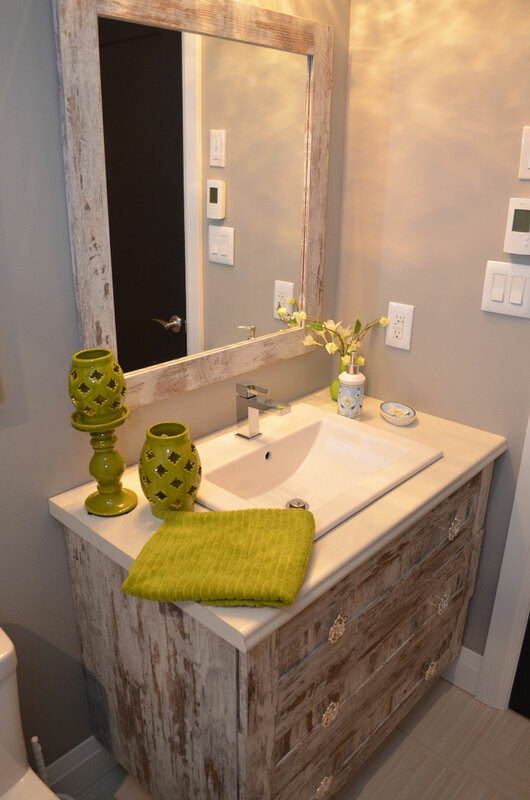 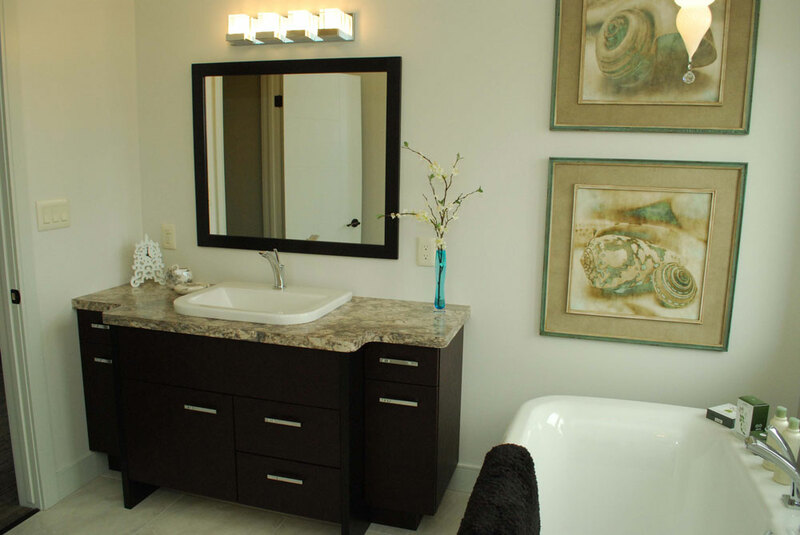 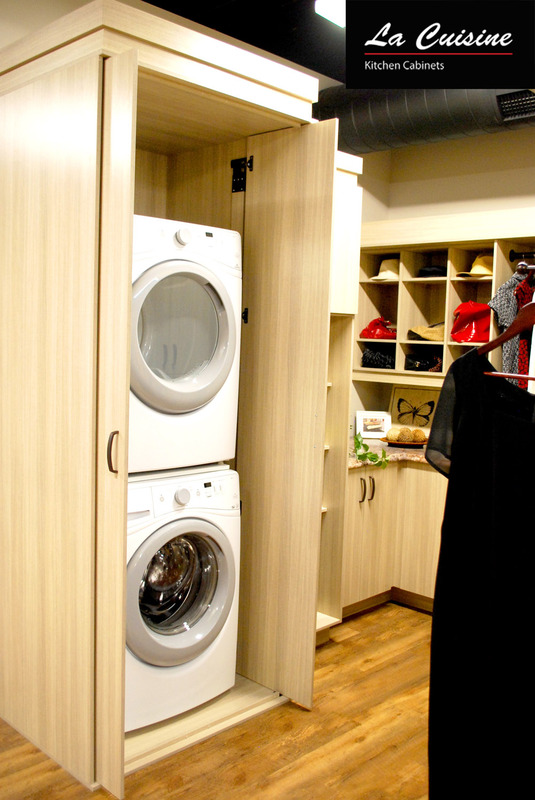 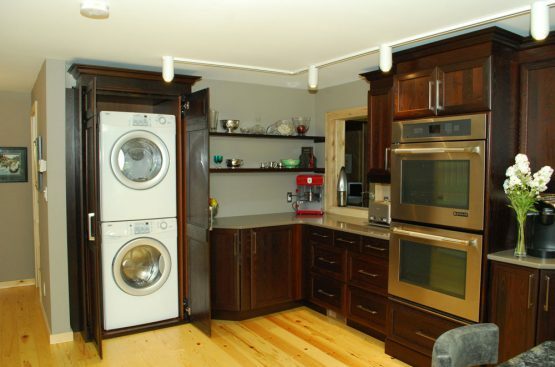 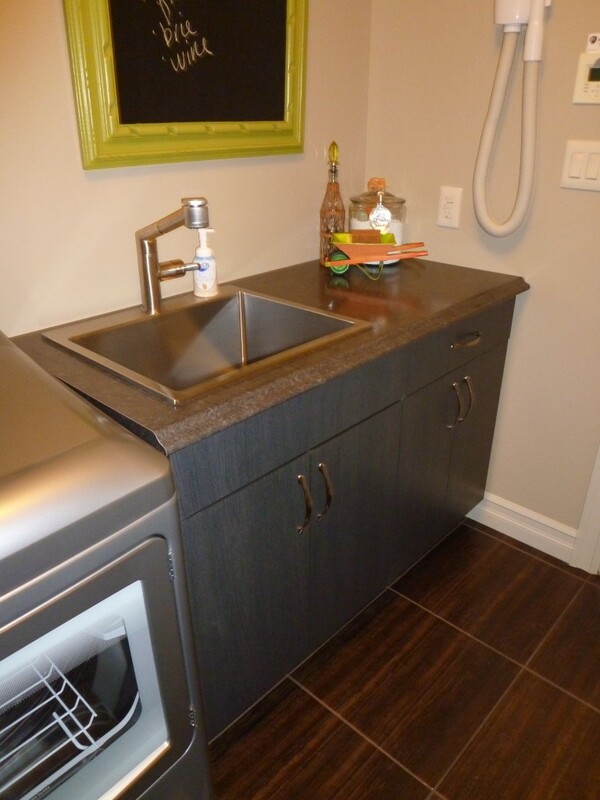 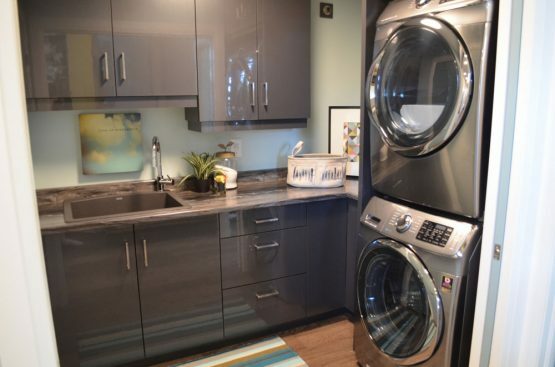 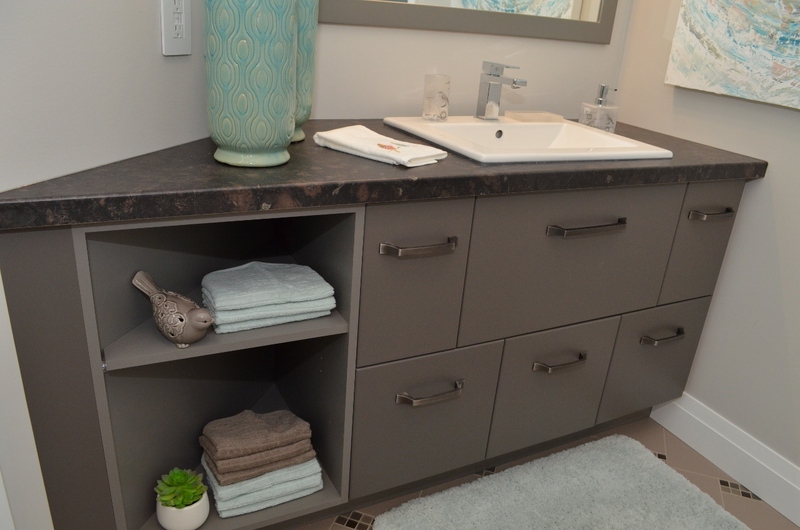 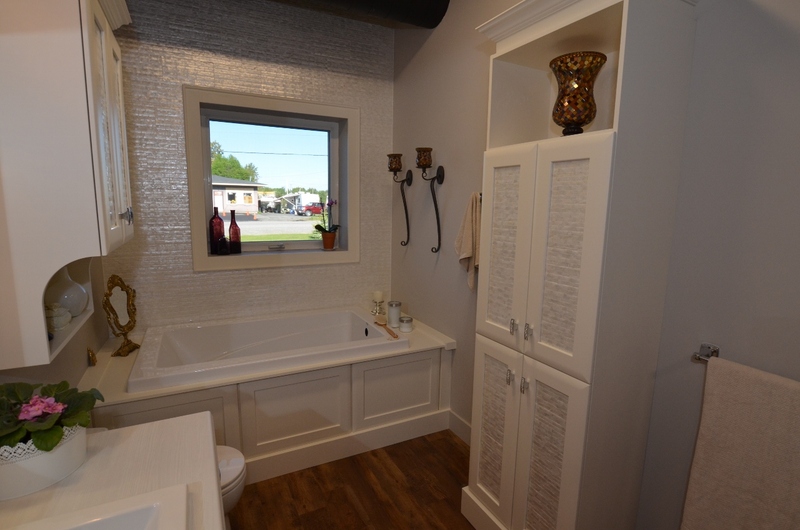 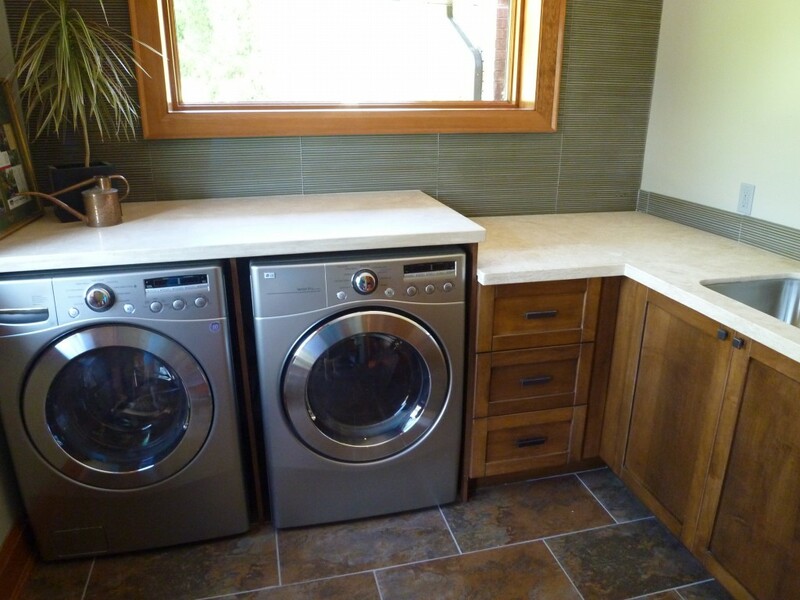 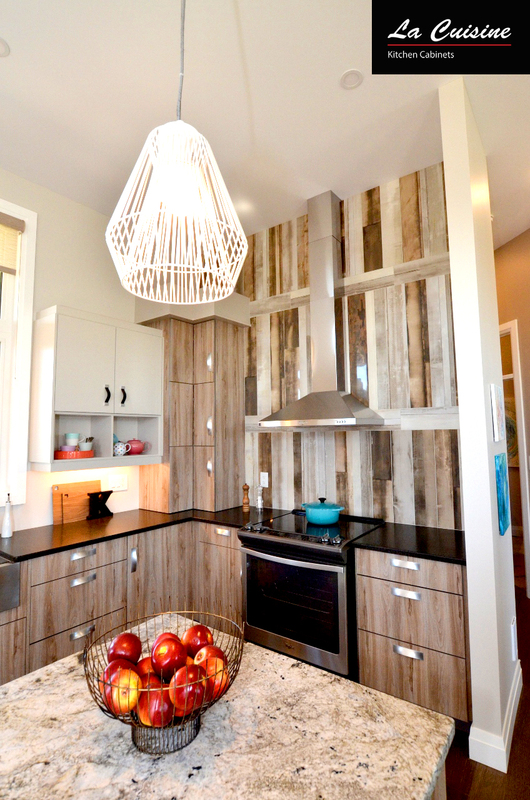 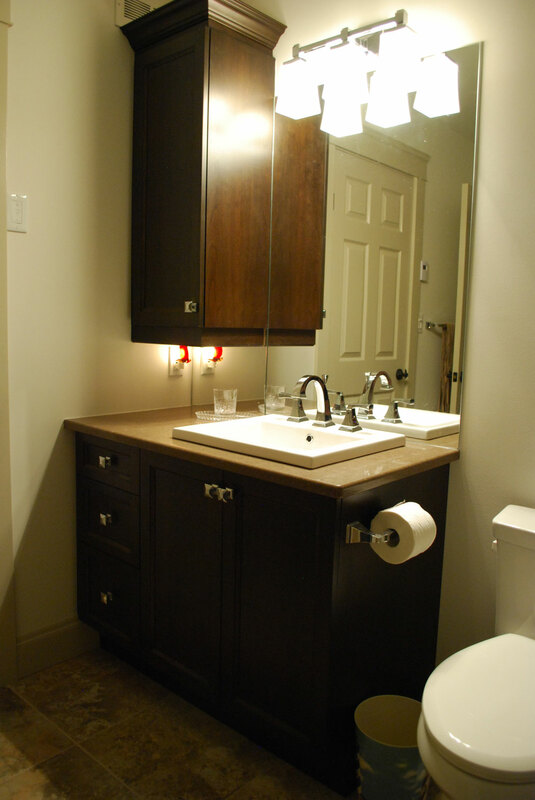 I had many ideas that I wanted to incorporate into our dream kitchen, bathroom vanities and our awesome laundry room. 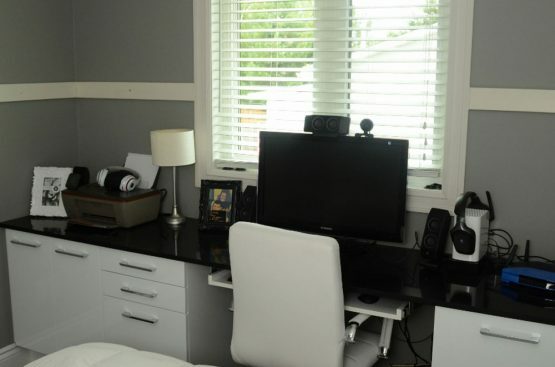 Paul made it all happen. 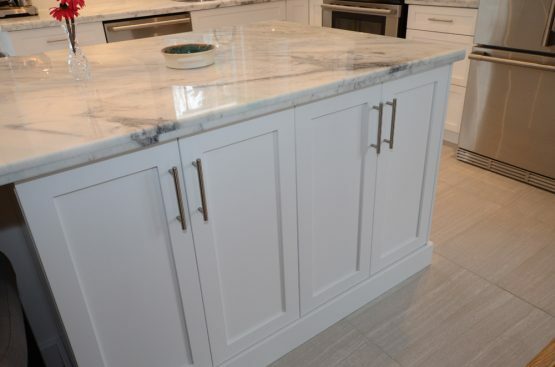 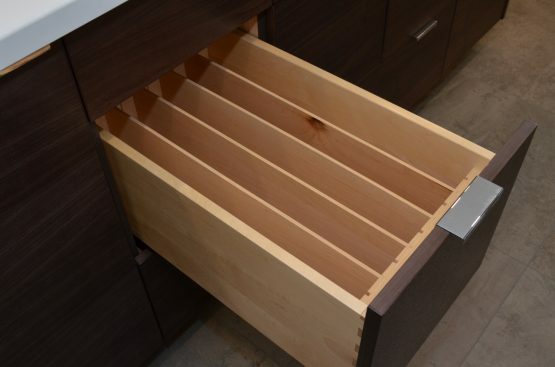 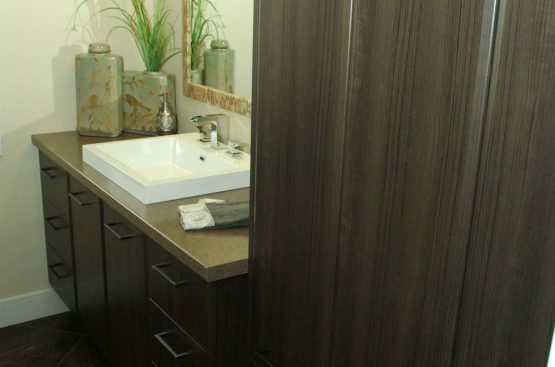 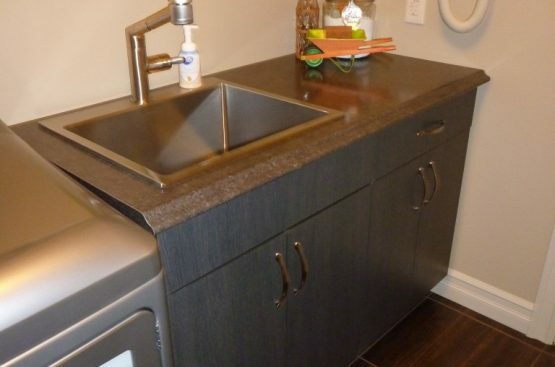 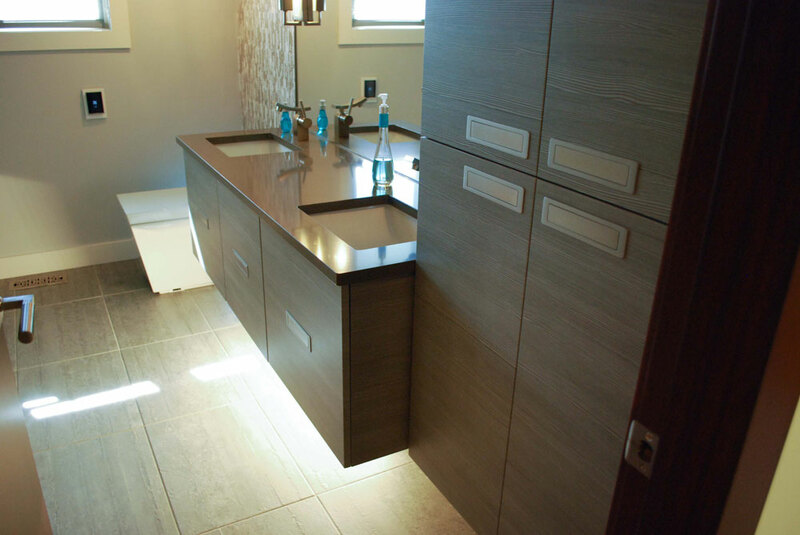 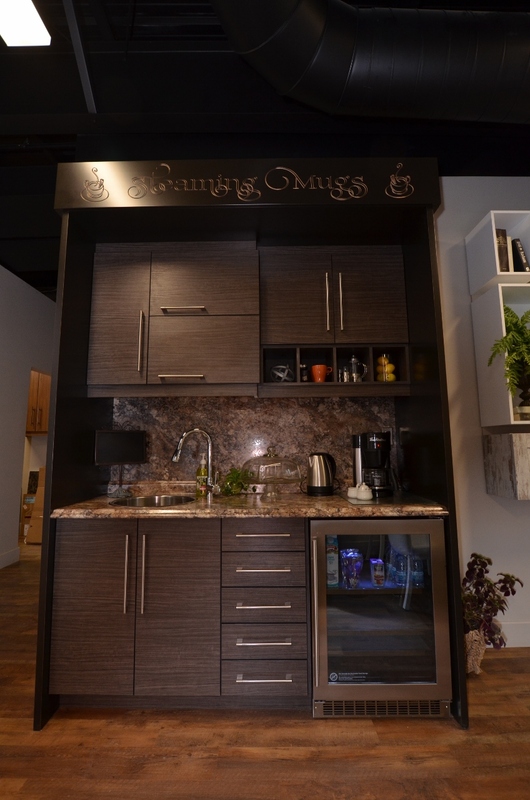 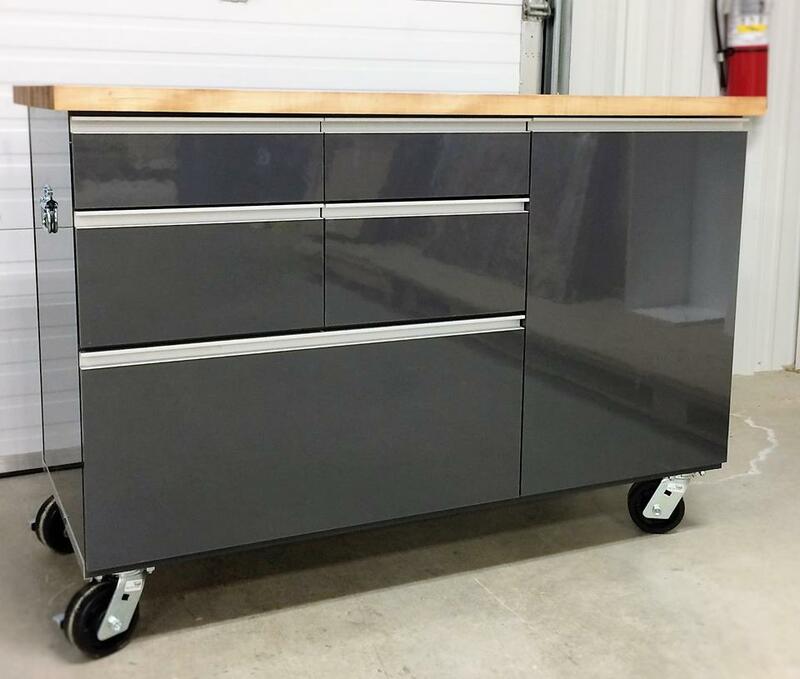 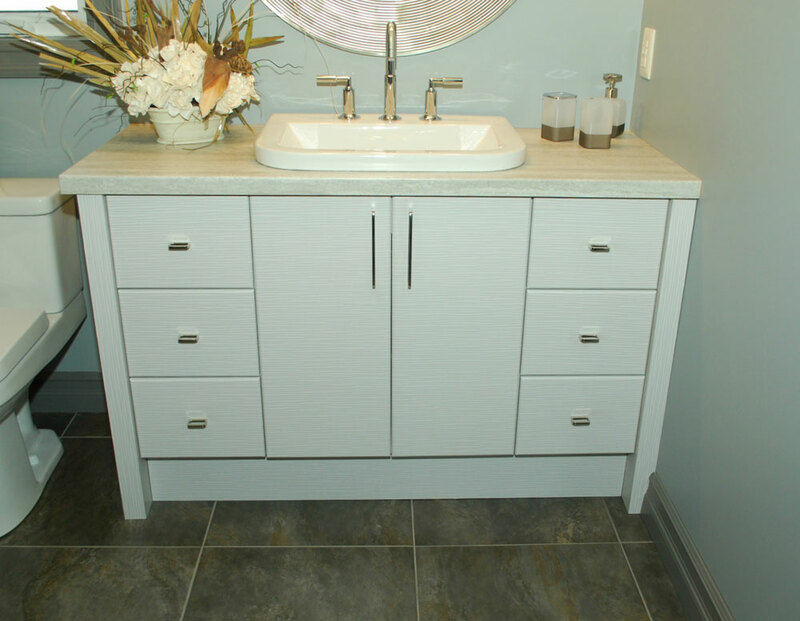 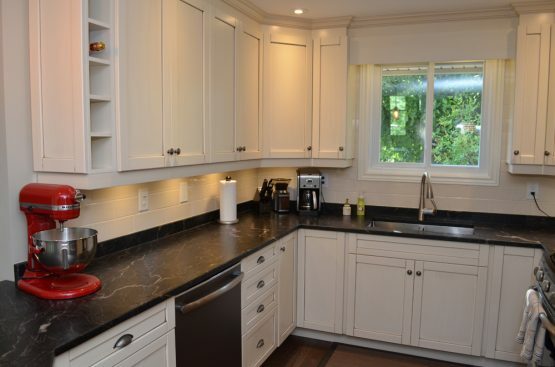 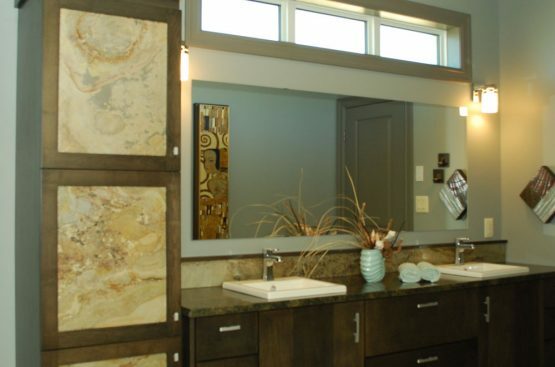 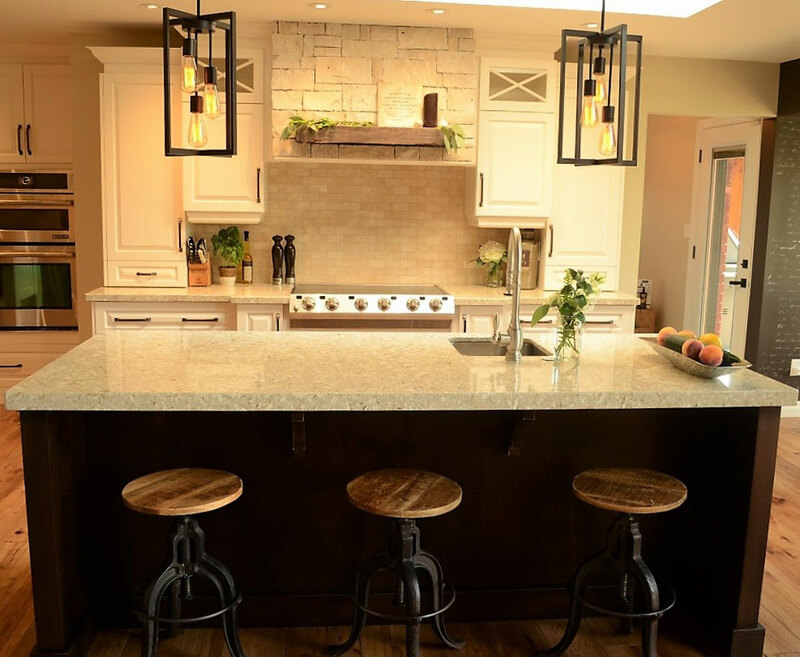 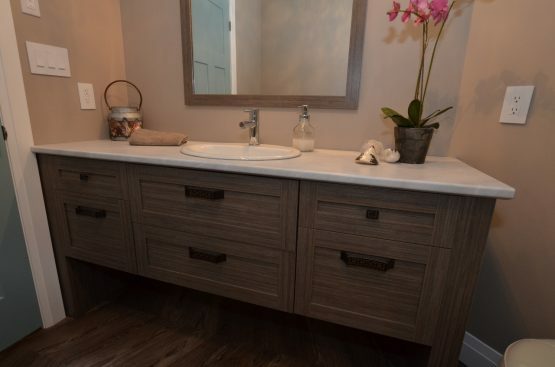 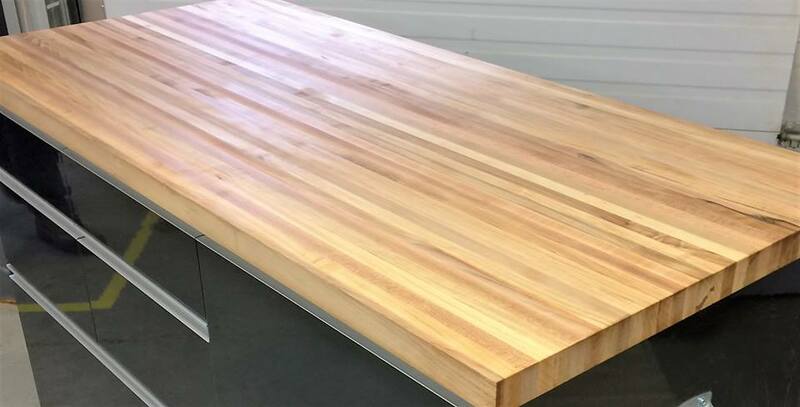 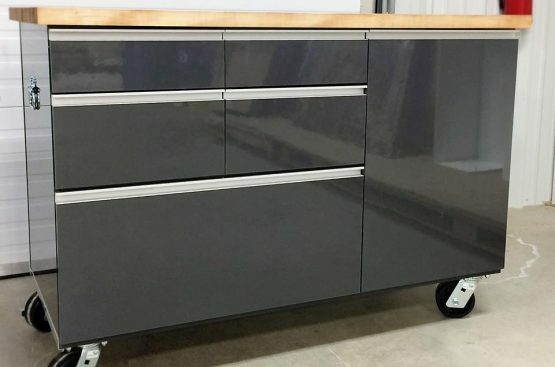 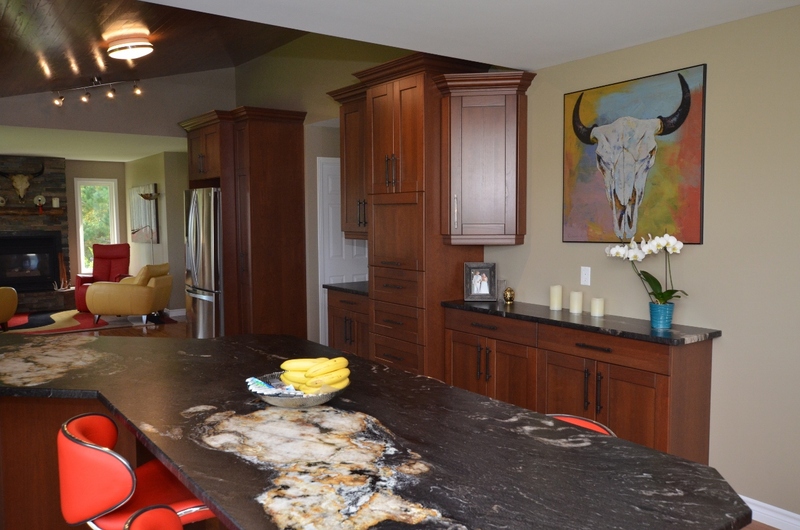 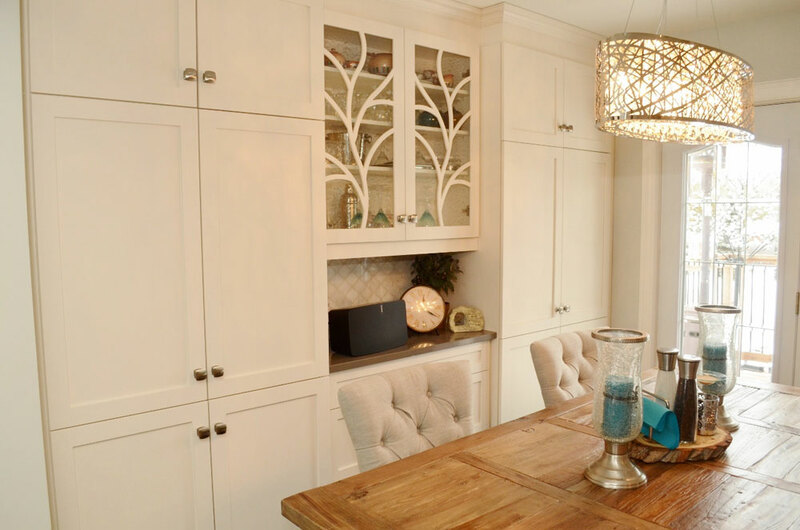 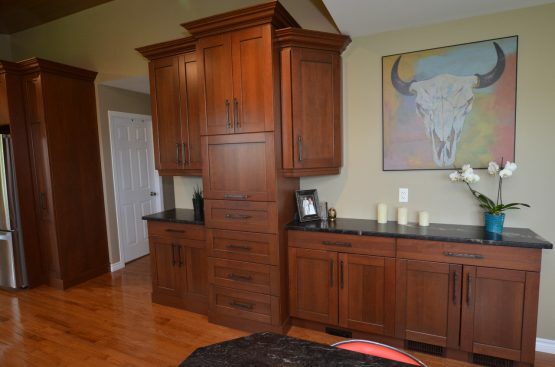 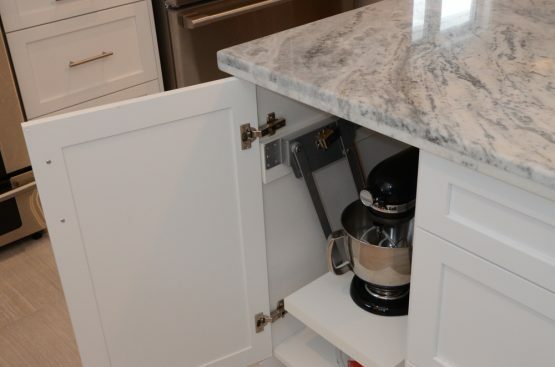 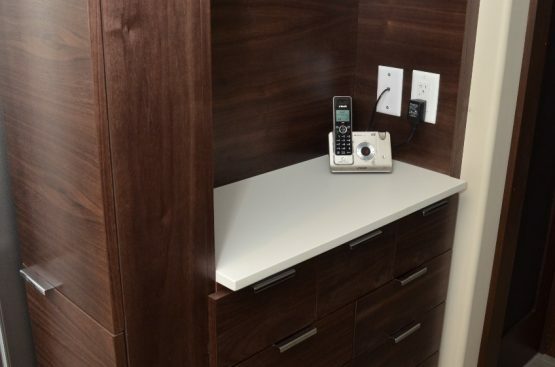 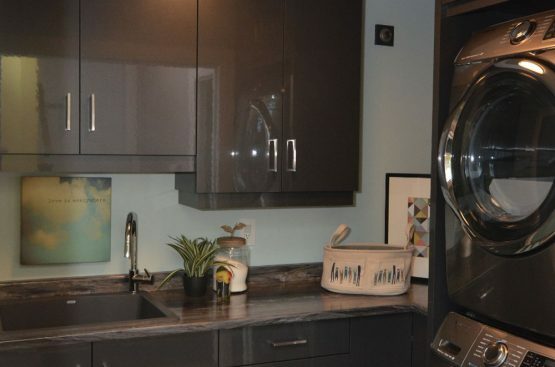 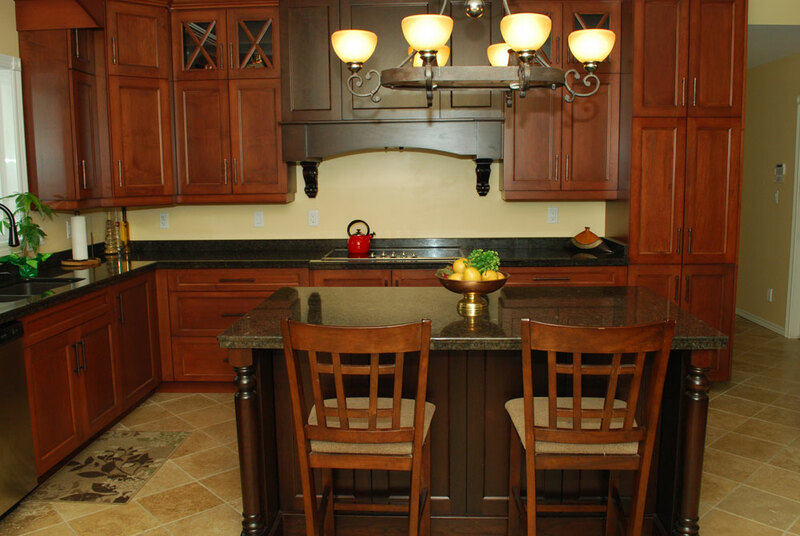 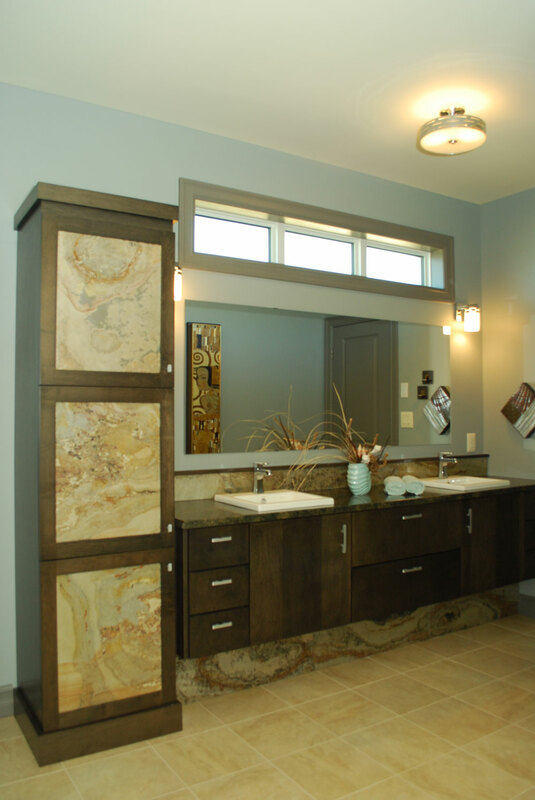 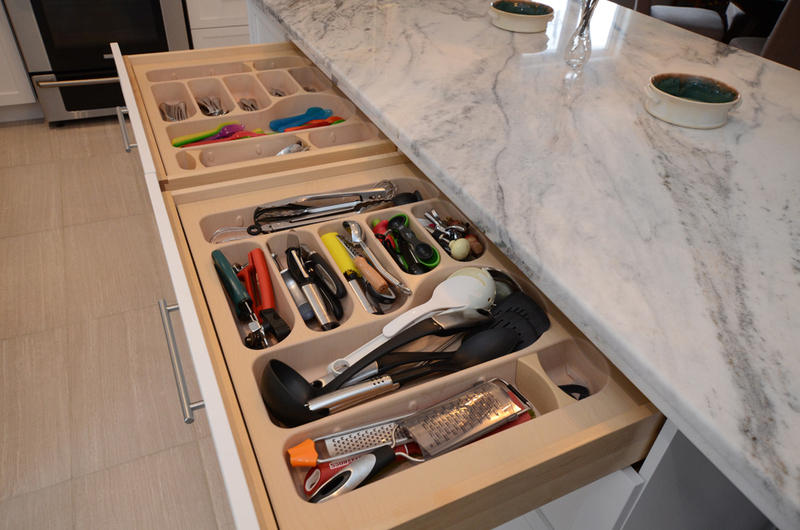 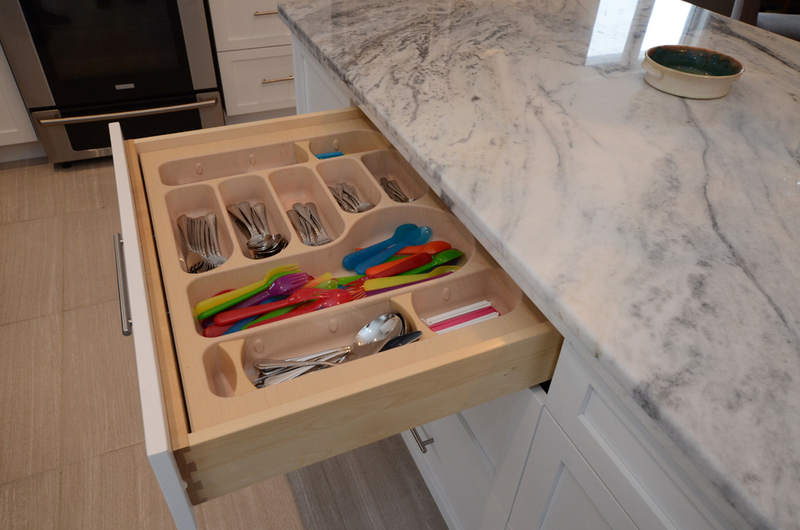 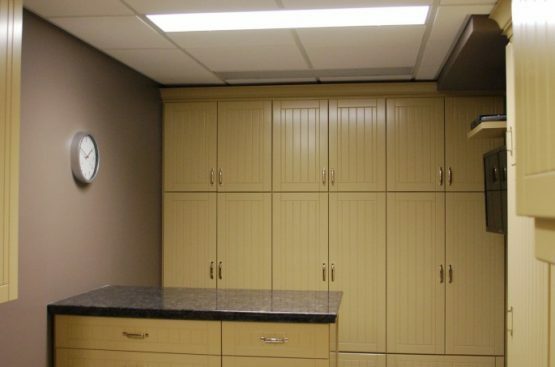 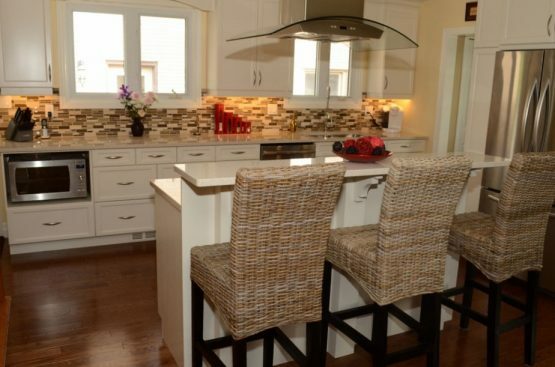 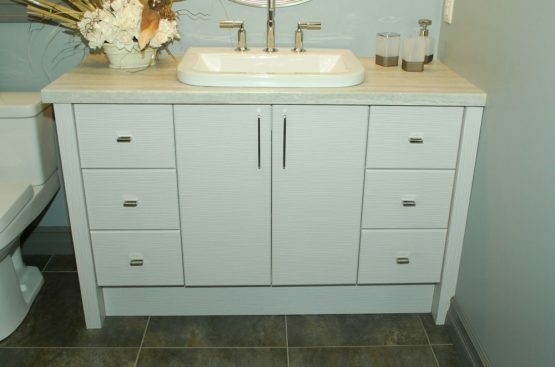 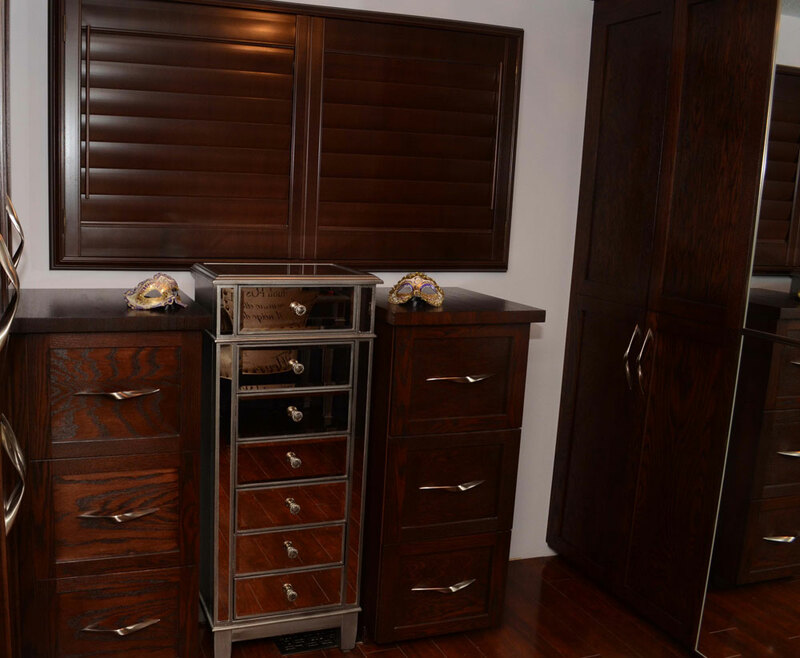 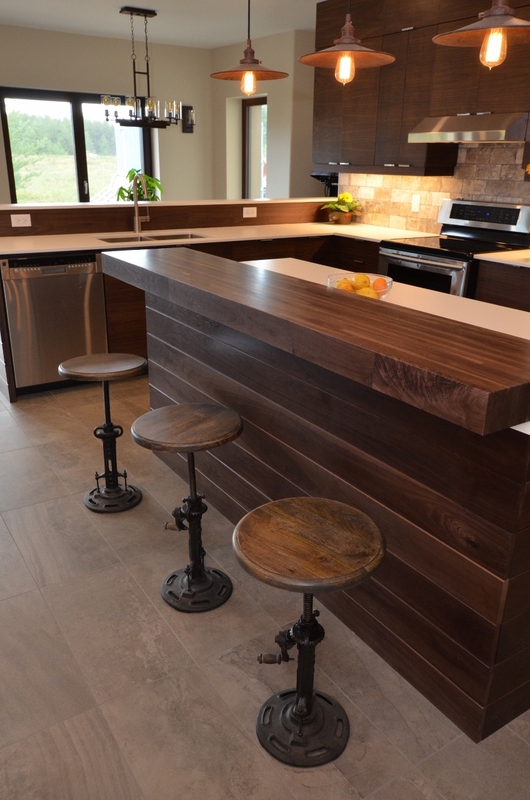 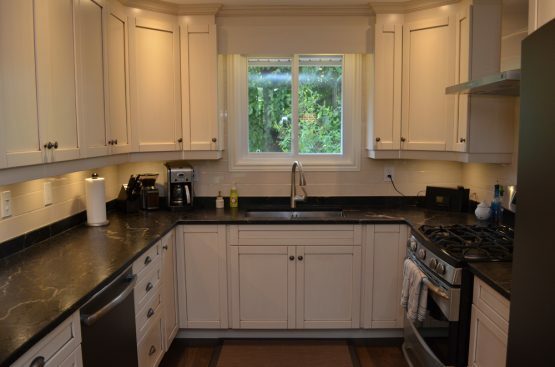 Even though I changed my mind several times with cupboard placement, counter style, sinks, overall designs….Paul was always patient and forthcoming throughout the entire process. 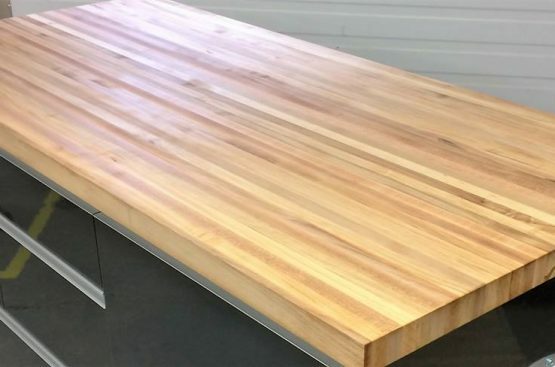 I knew that when I would ask his opinion, I would get an honest “love it” or “I don’t think that will look good” or “great idea, but very pricey” usually followed by “how about this”. 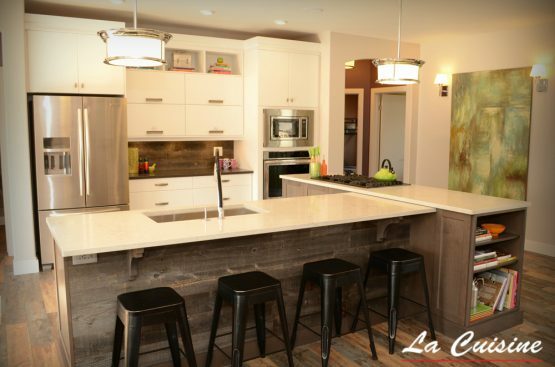 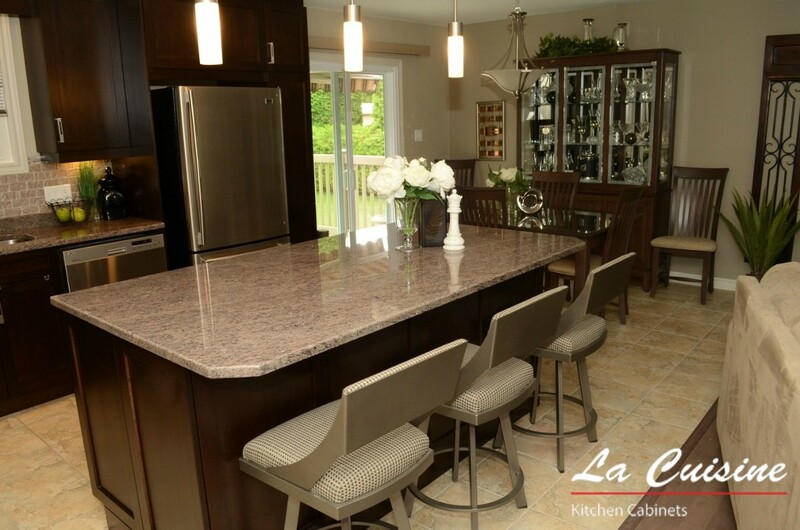 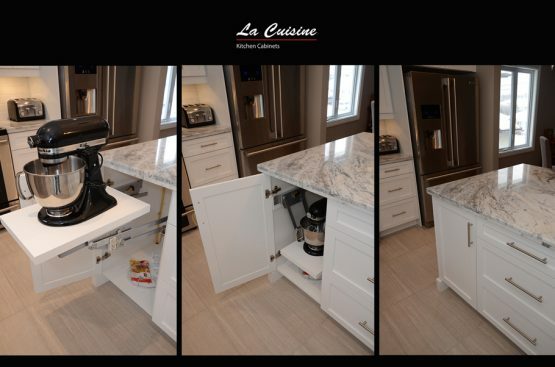 “We had the wonderful opportunity to work with La Cuisine, their customer service was impeccable from the first time you walk through their doors right to the last door hung. 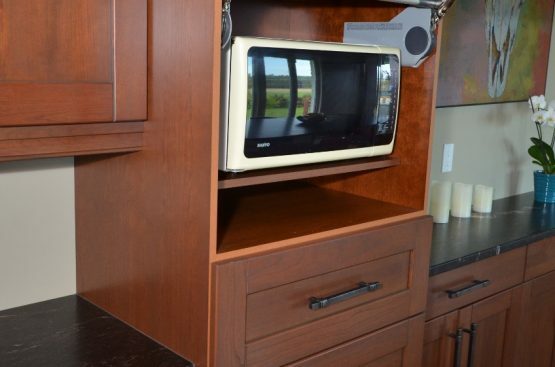 They truly do care about the quality of their product. 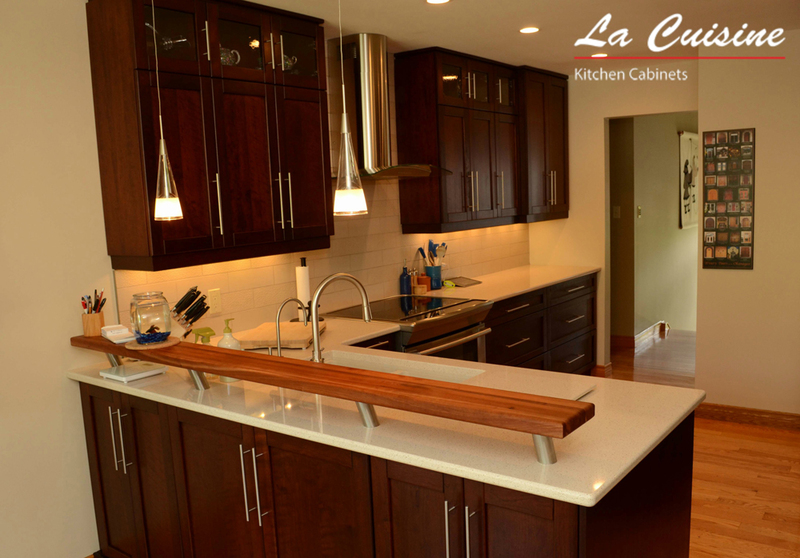 We came in with our vision of the perfect kitchen and they guided us through every step, and we are over the moon with the results. 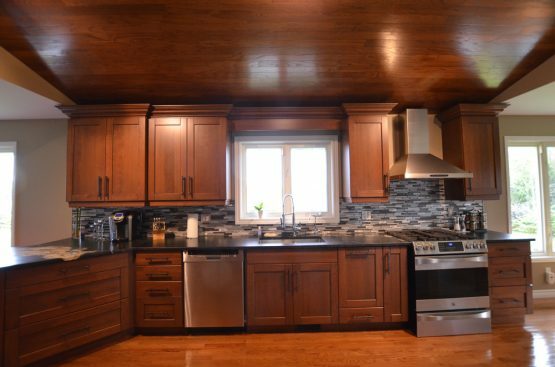 We got our perfect kitchen! 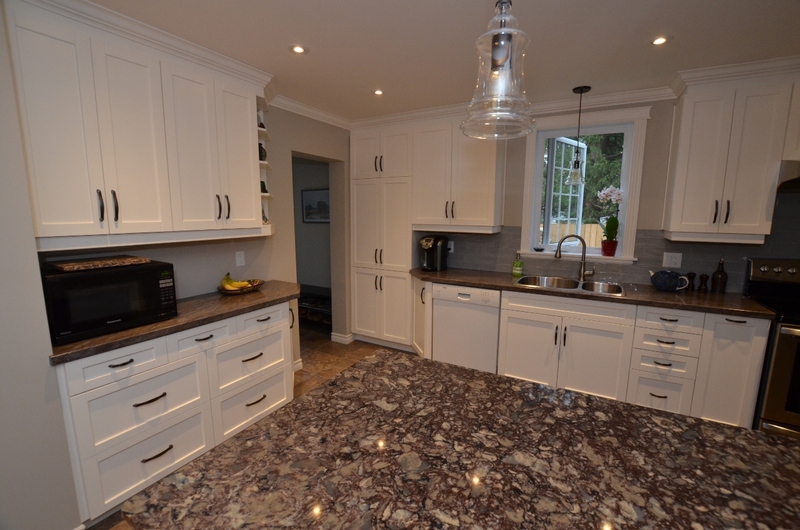 Thank you for the great job with our new kitchen and bathroom countertops. 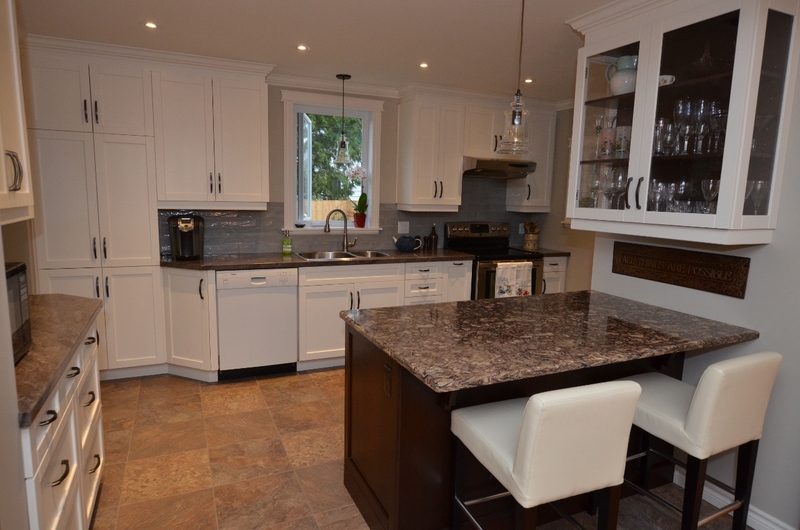 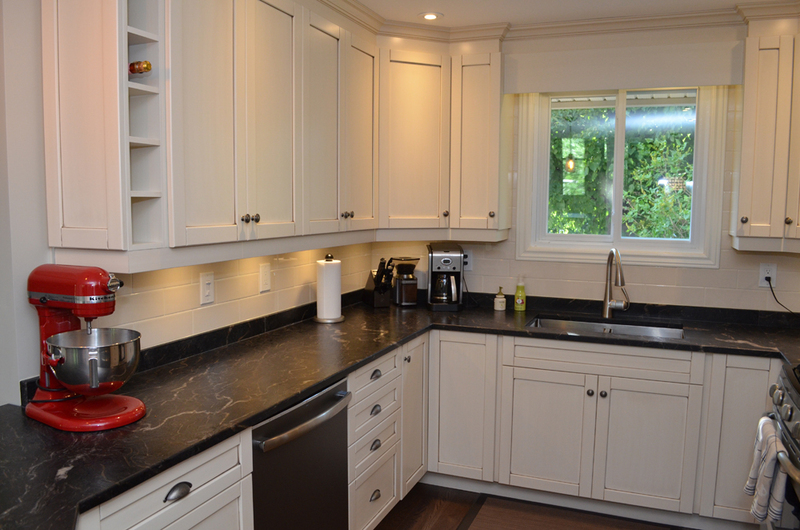 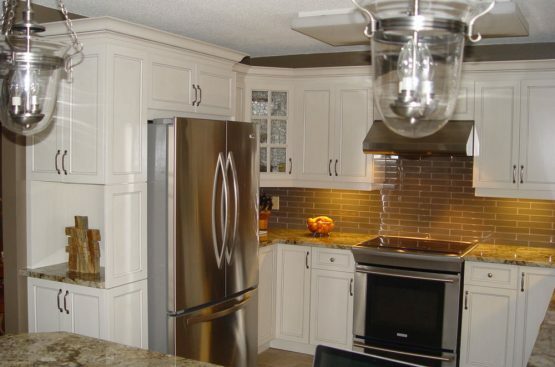 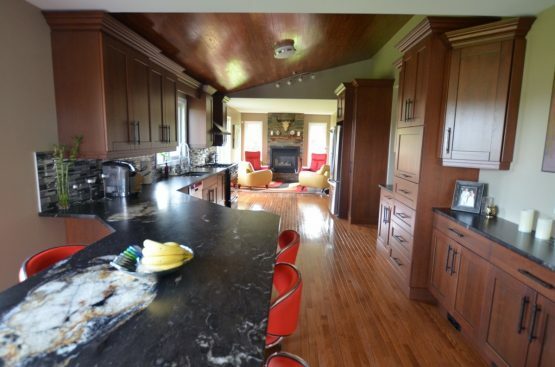 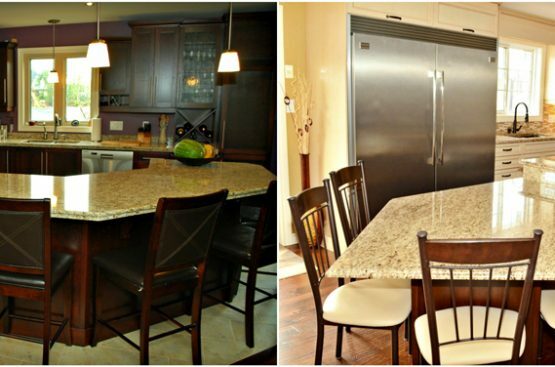 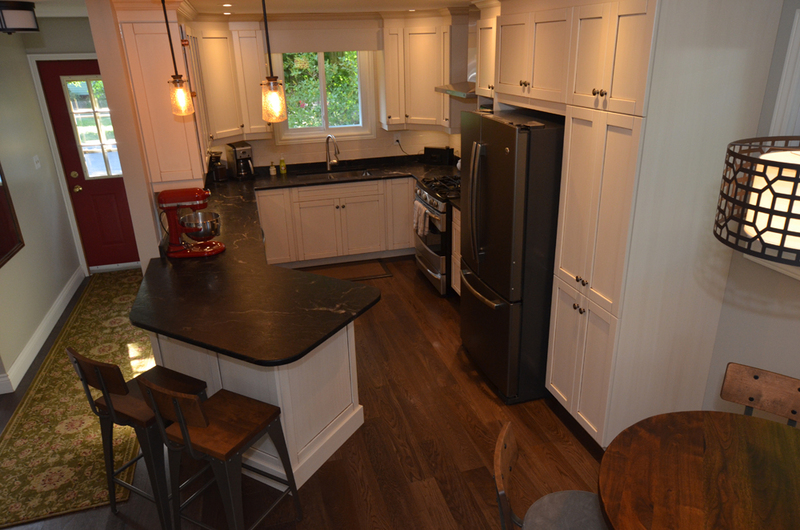 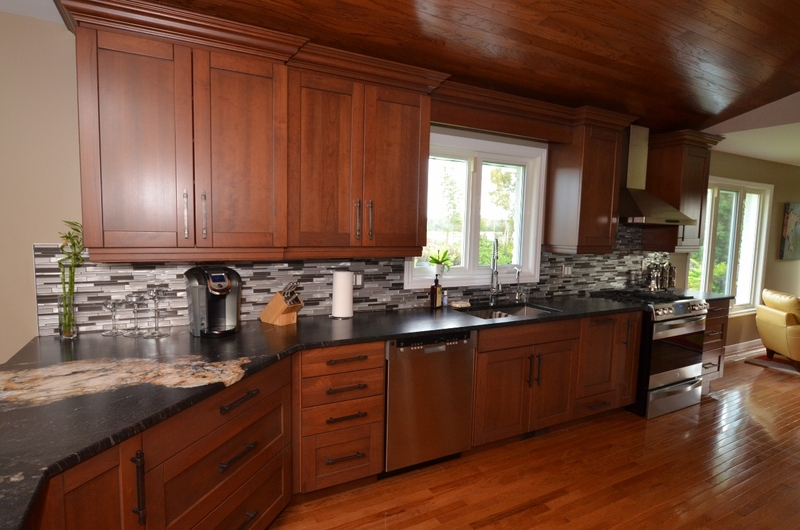 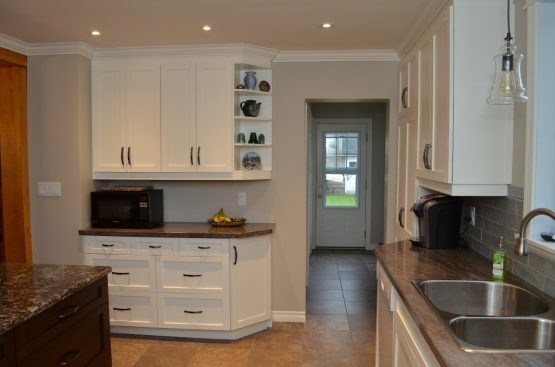 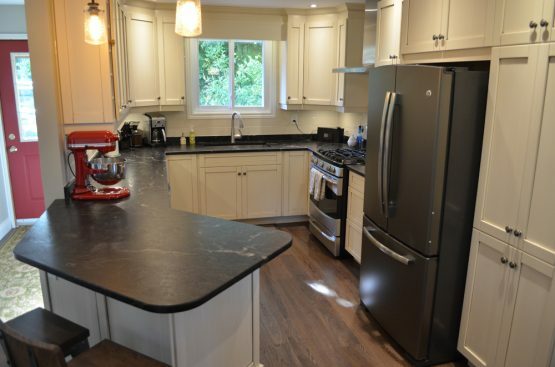 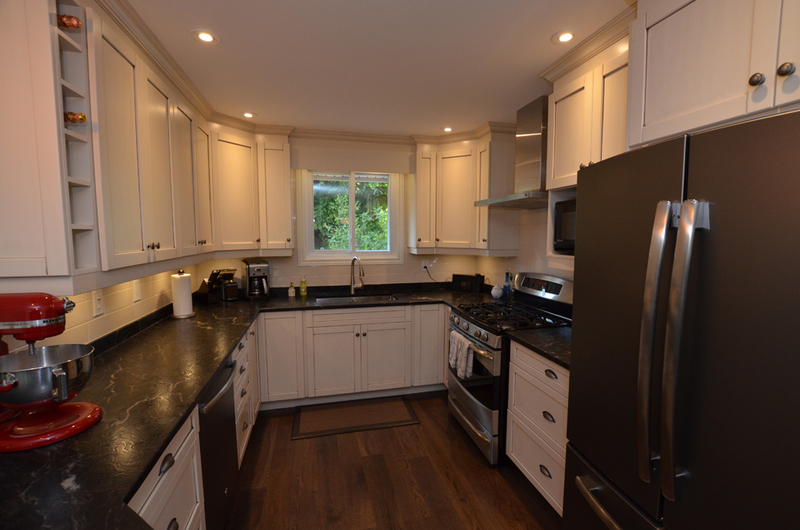 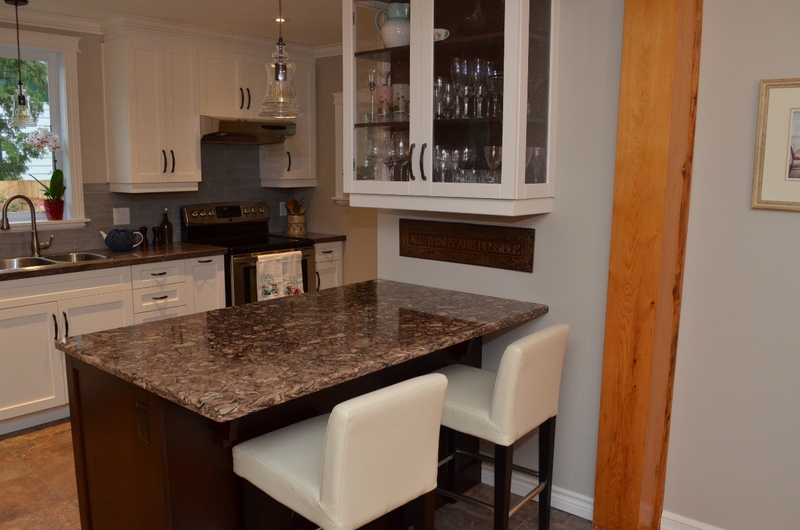 Our decision to stay in our existing home with an expanding family meant that our old kitchen needed to be renovated. 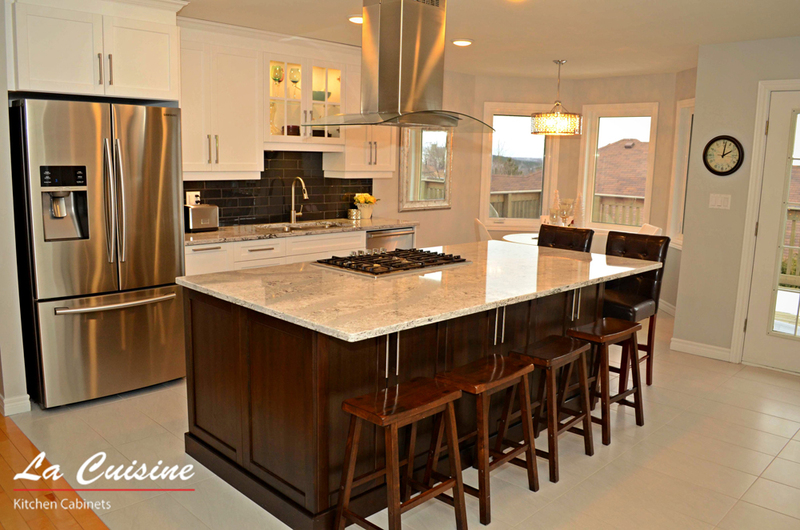 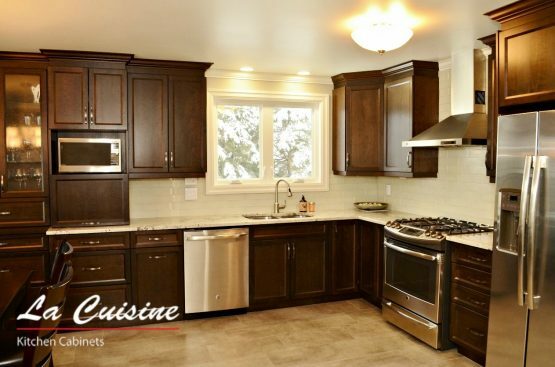 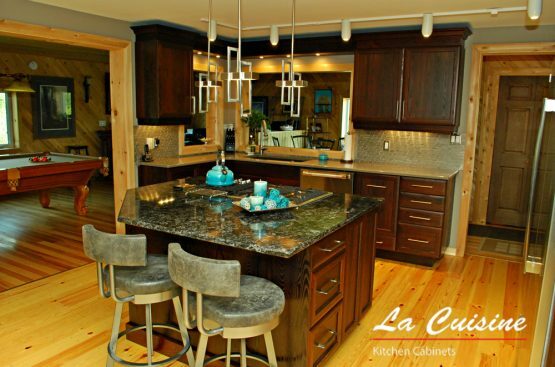 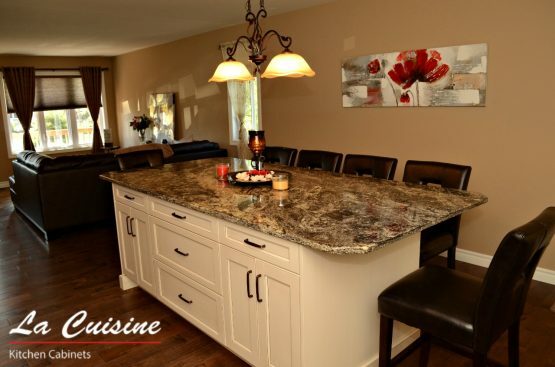 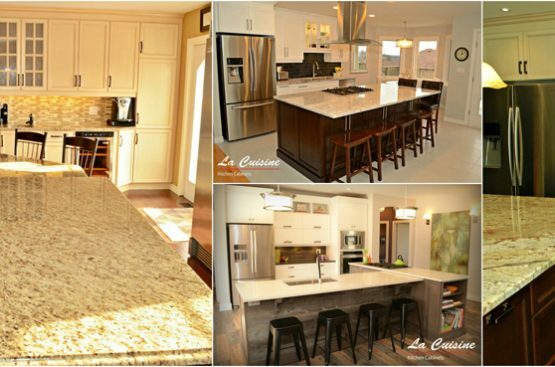 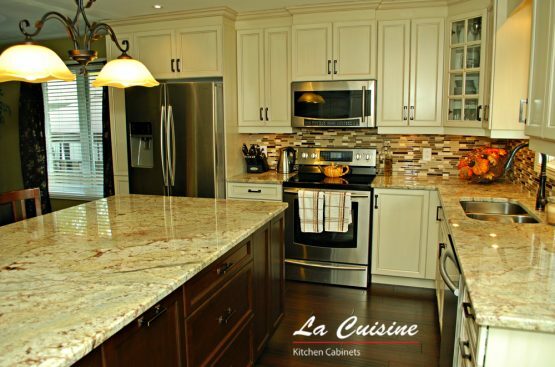 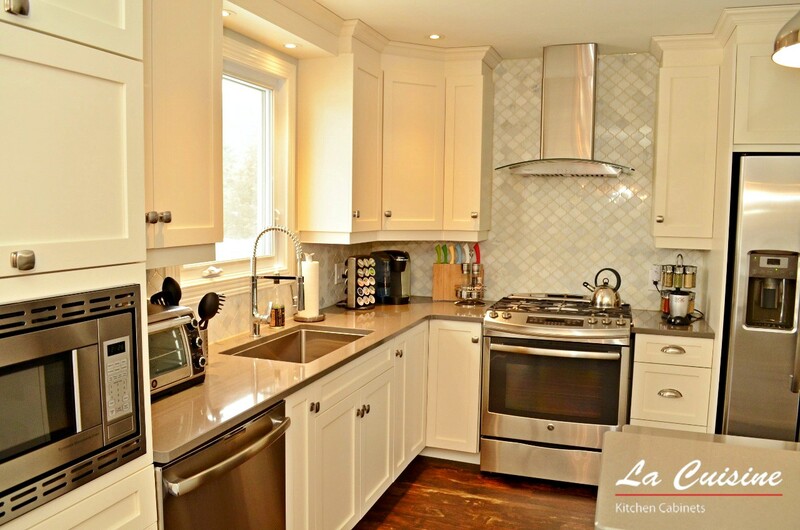 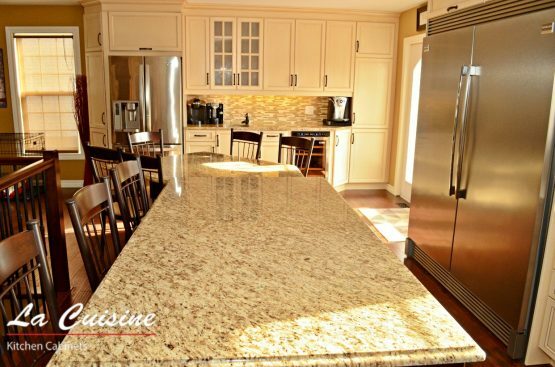 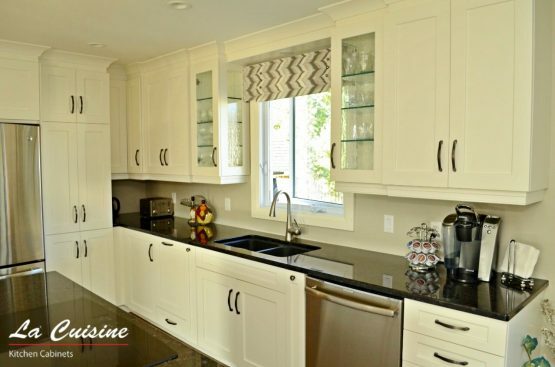 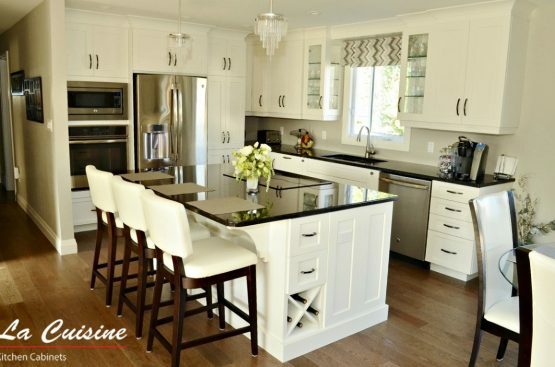 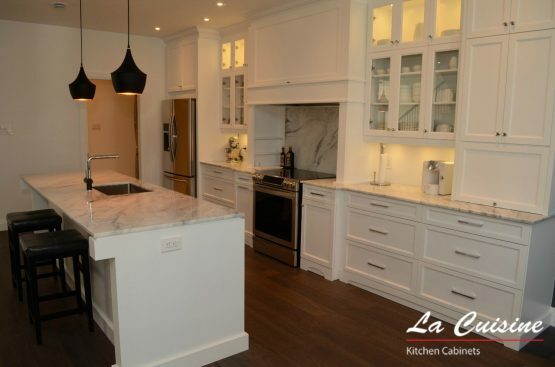 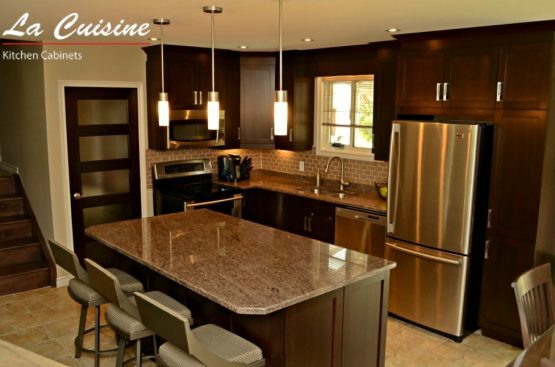 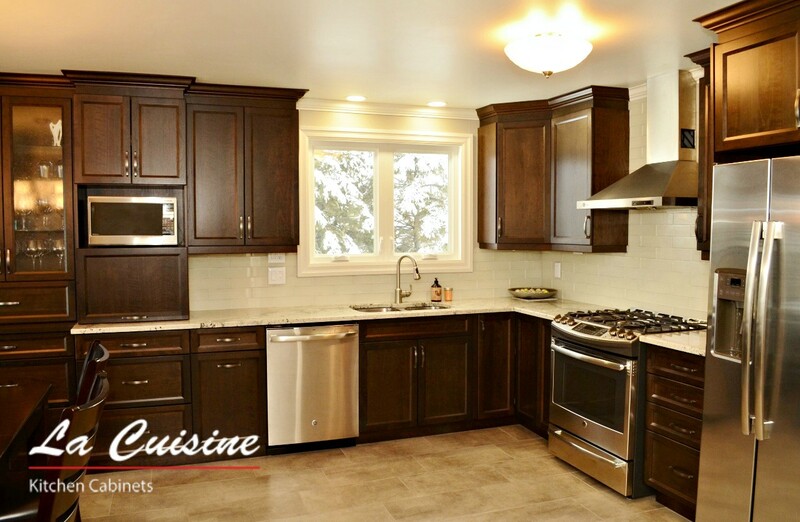 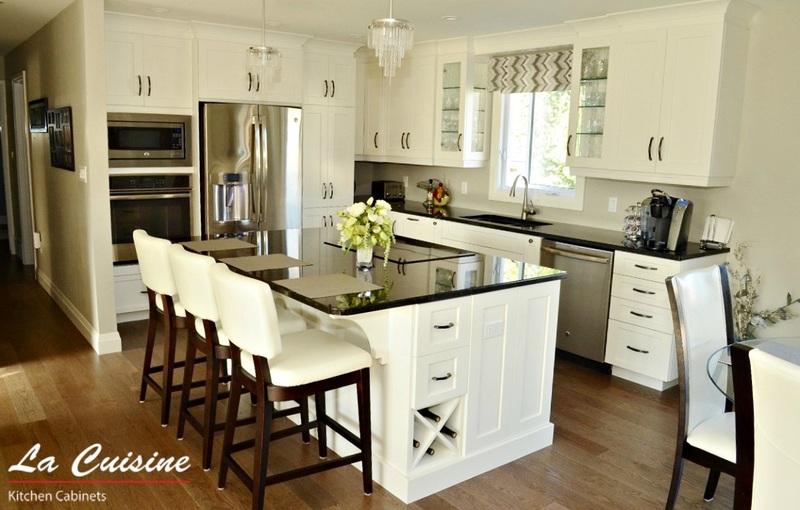 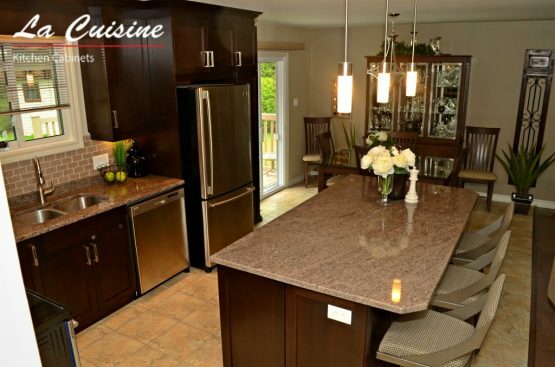 Natalie and her staff at La Cuisine Kitchen Cabinets were attentive to our family’s needs and provided us with an excellent kitchen design with many fine details. The input from staff went beyond the design. 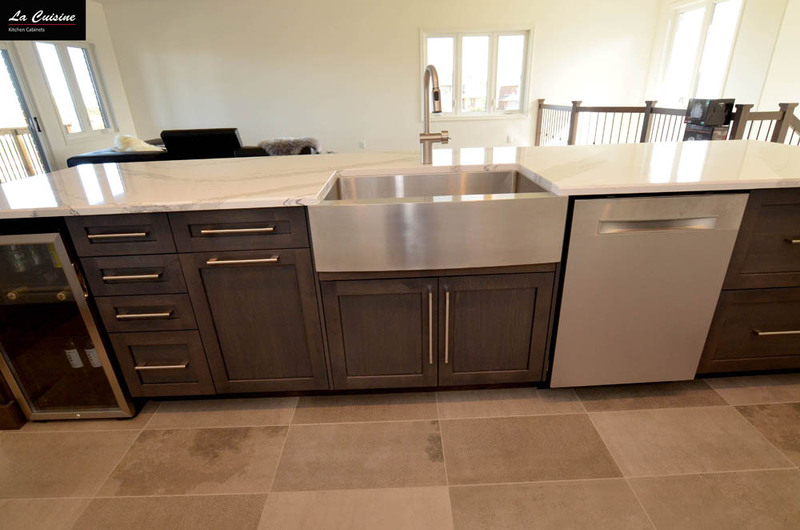 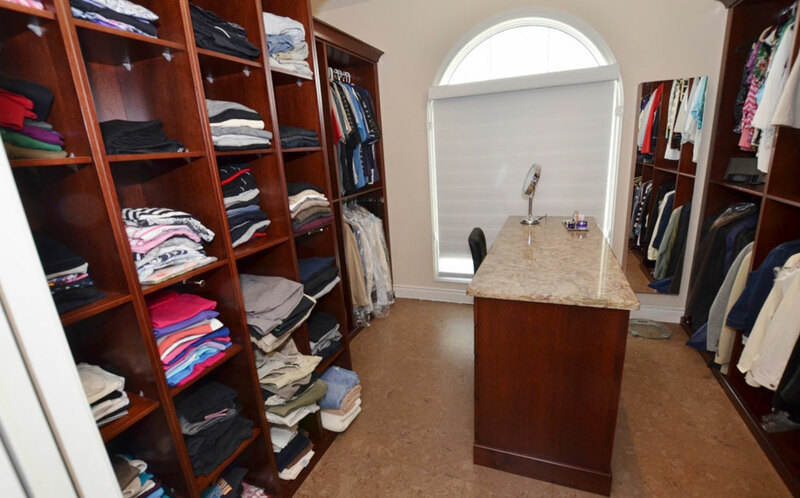 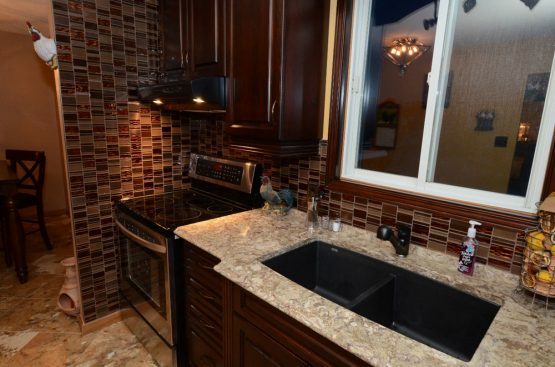 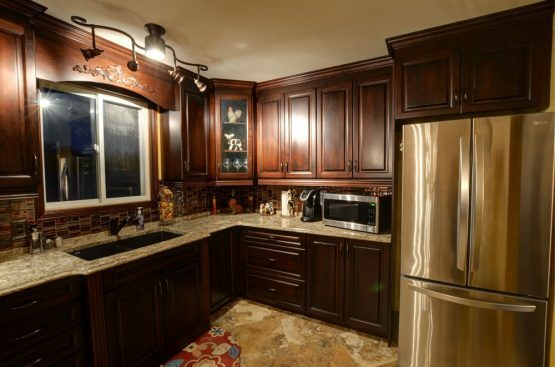 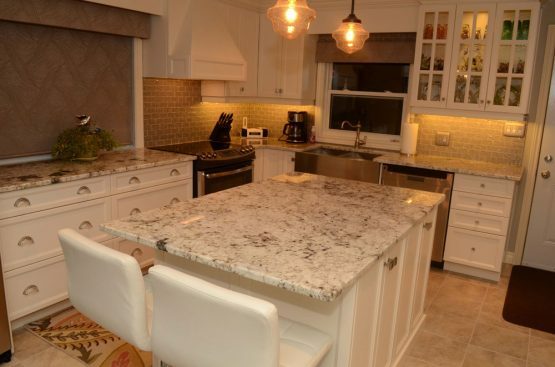 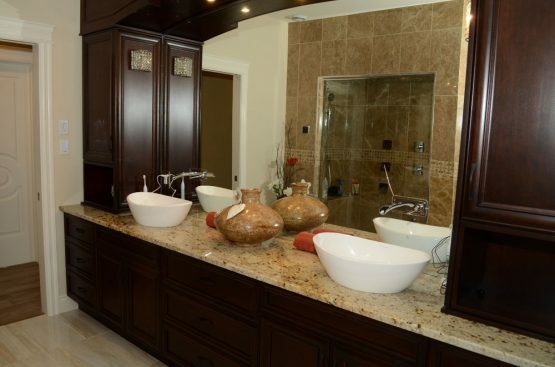 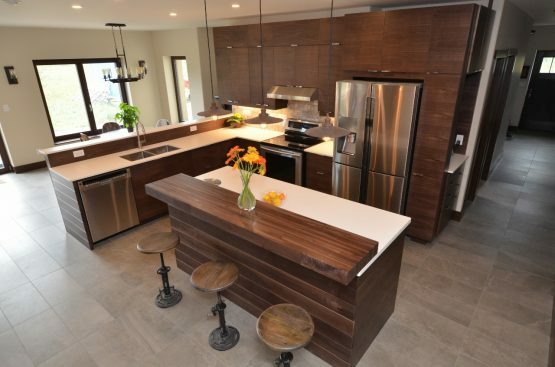 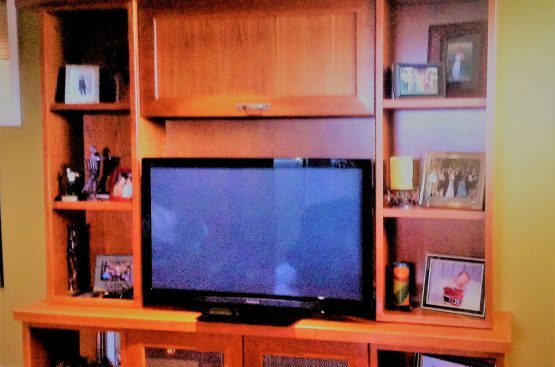 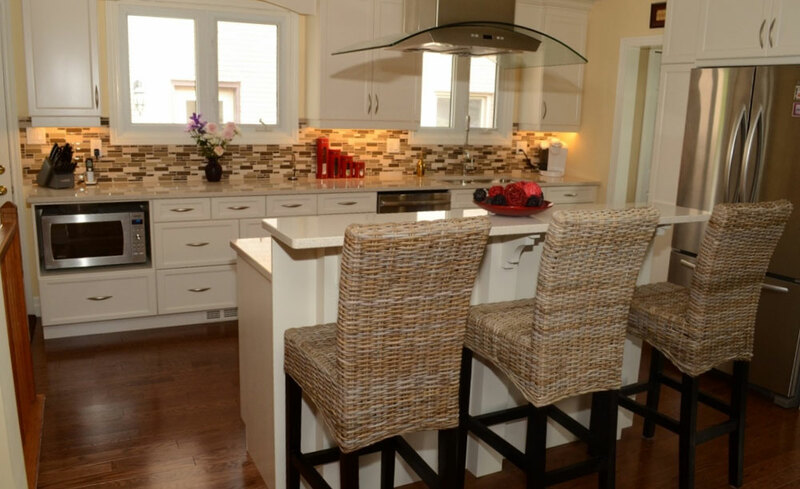 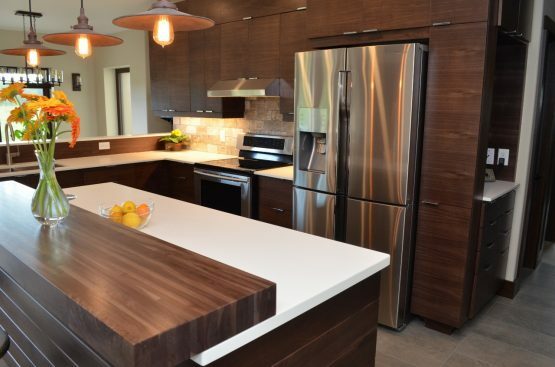 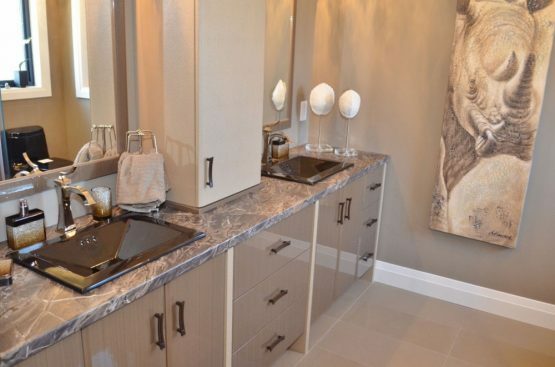 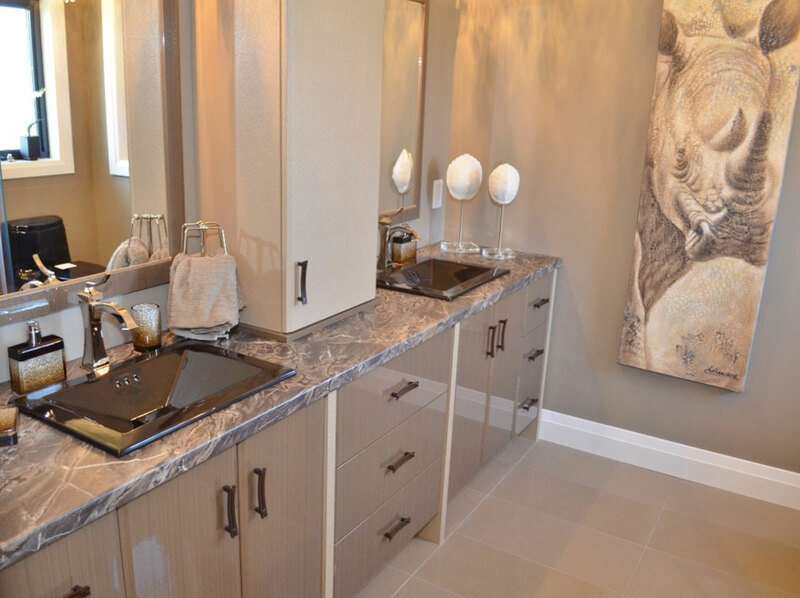 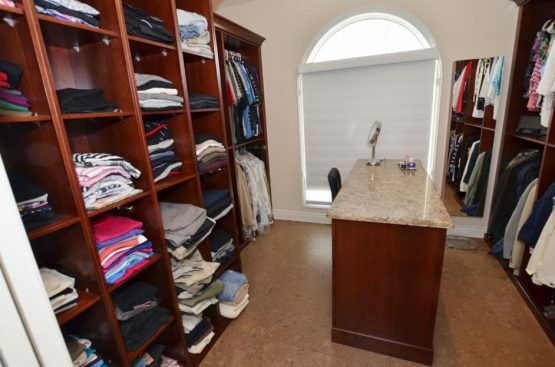 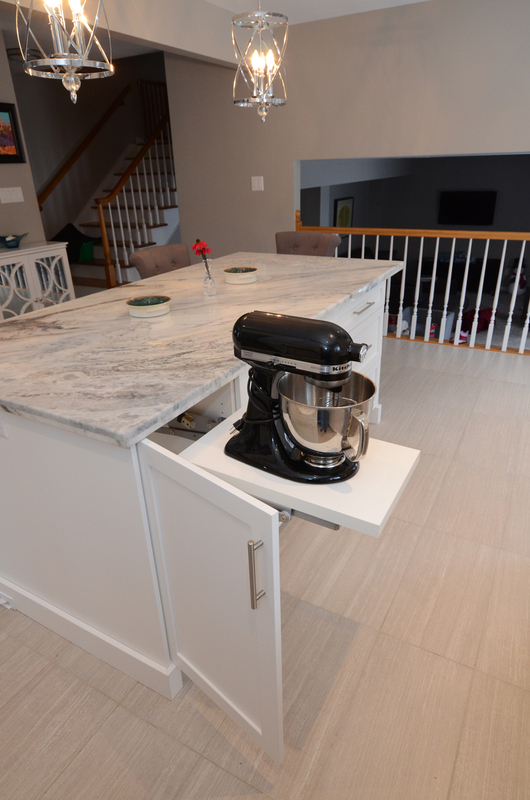 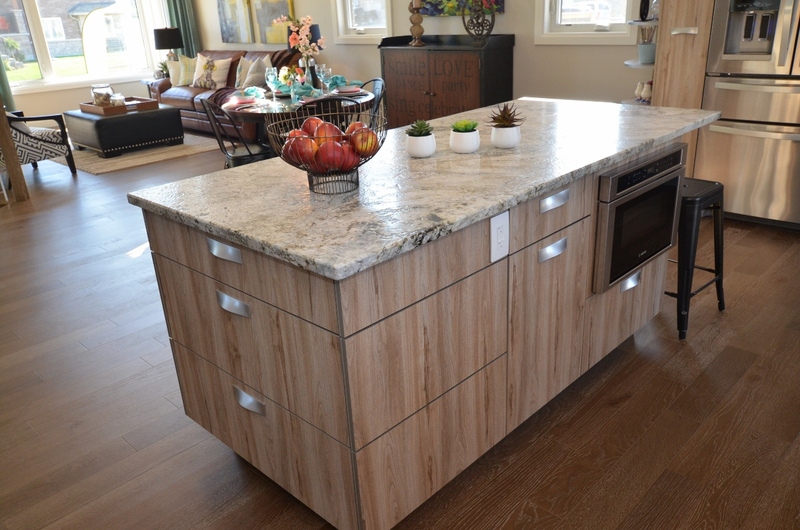 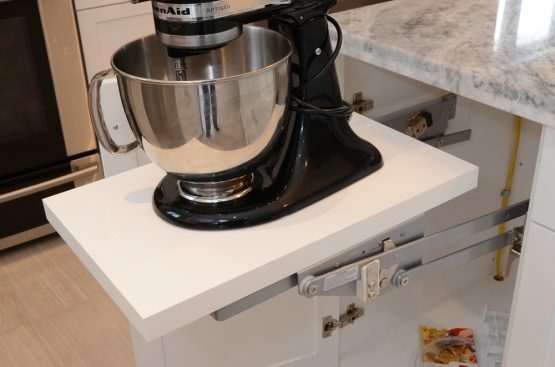 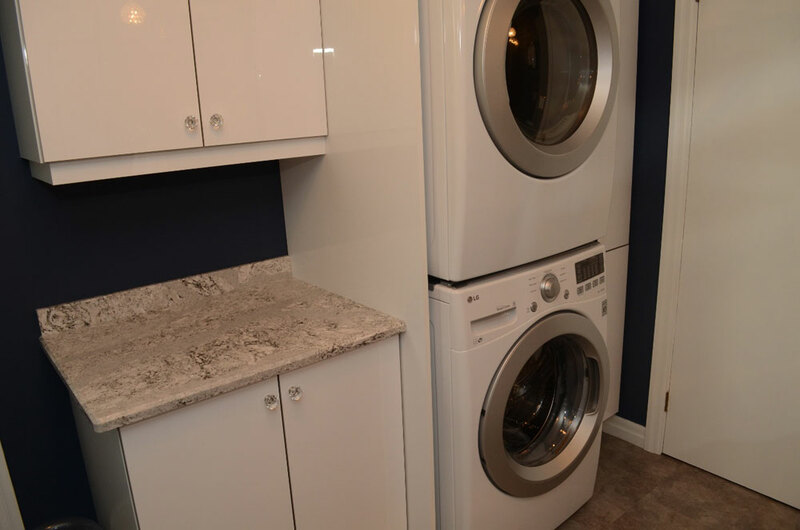 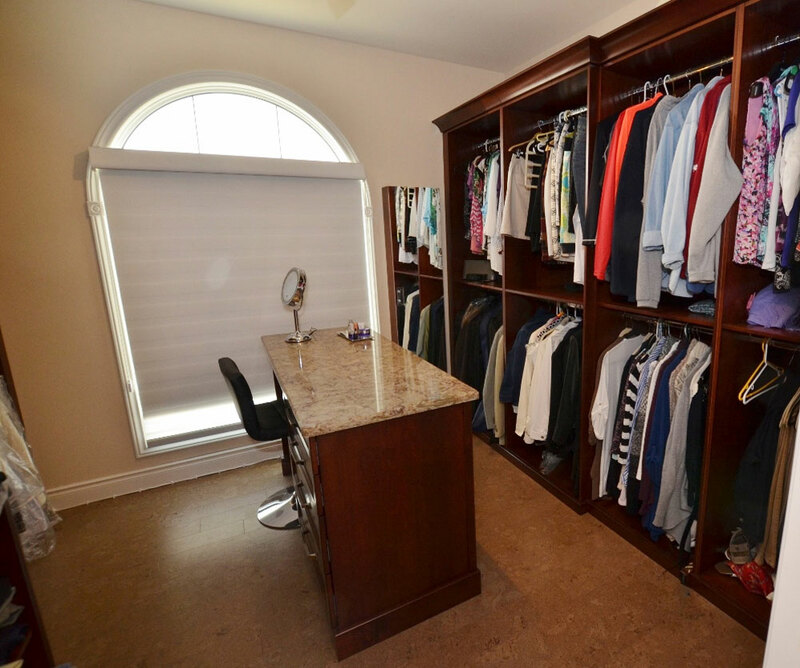 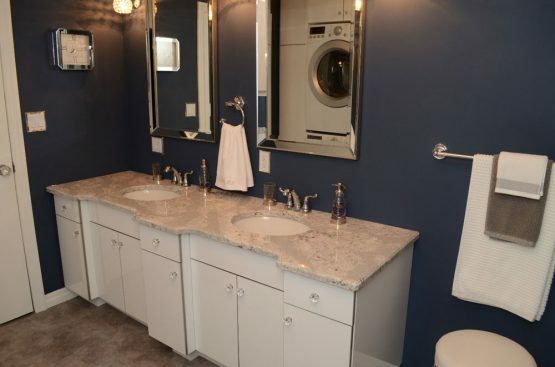 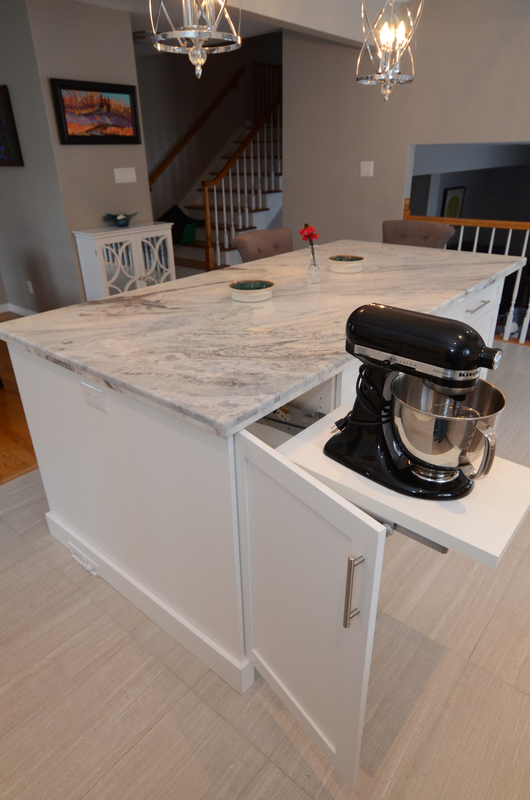 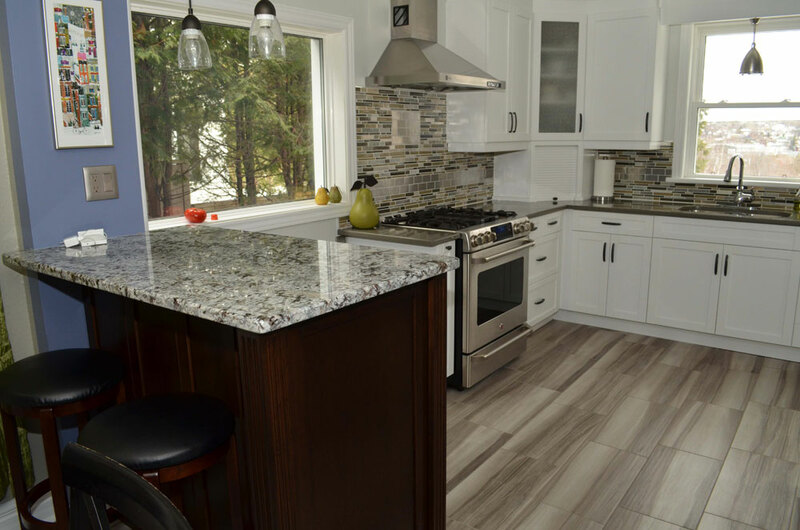 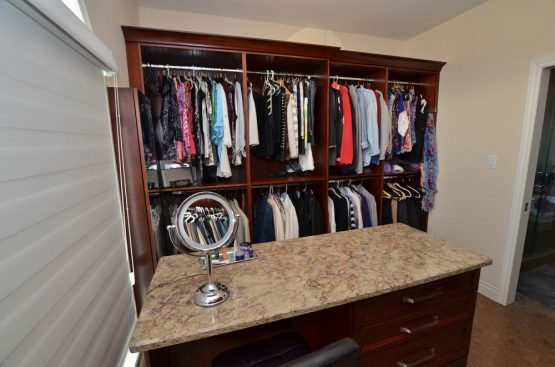 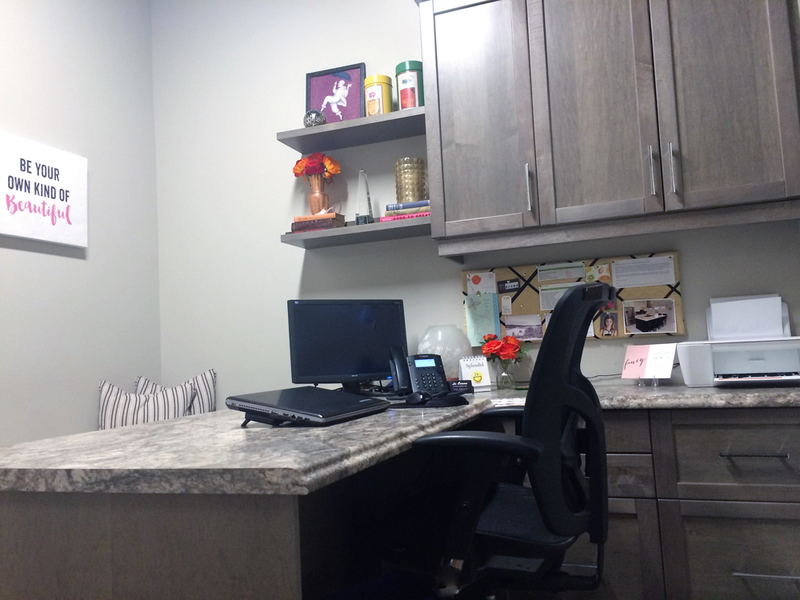 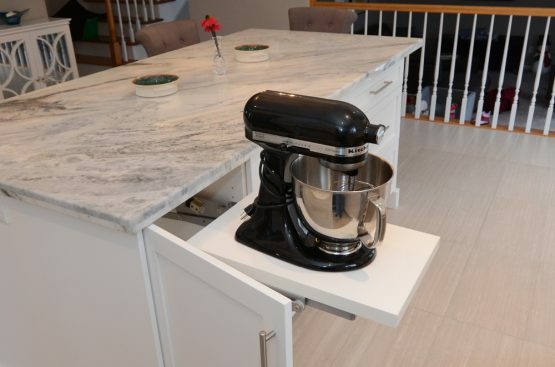 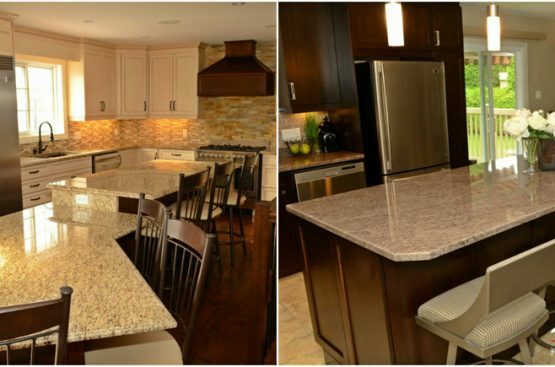 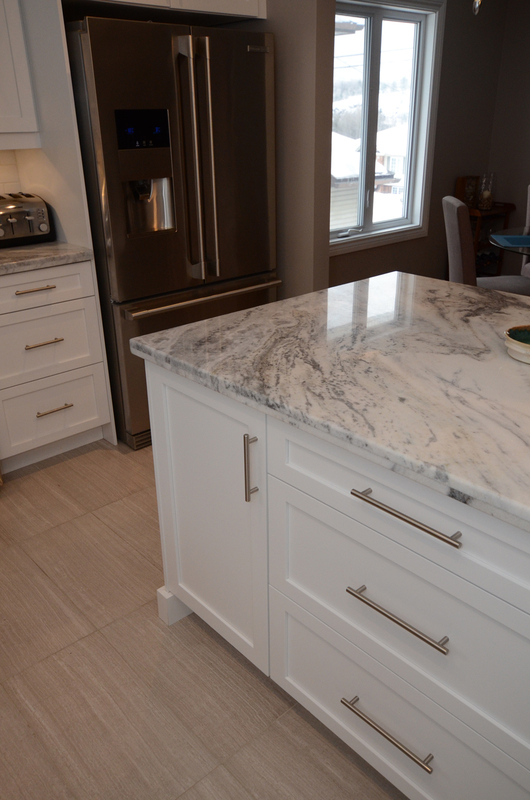 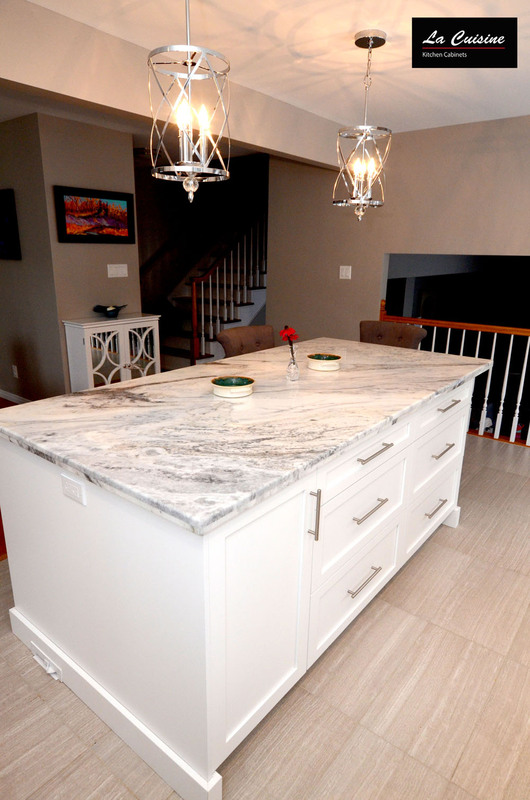 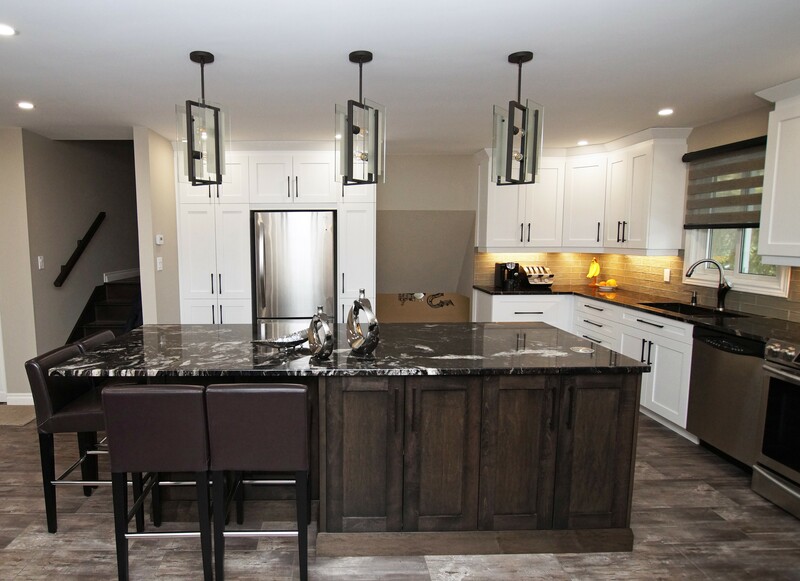 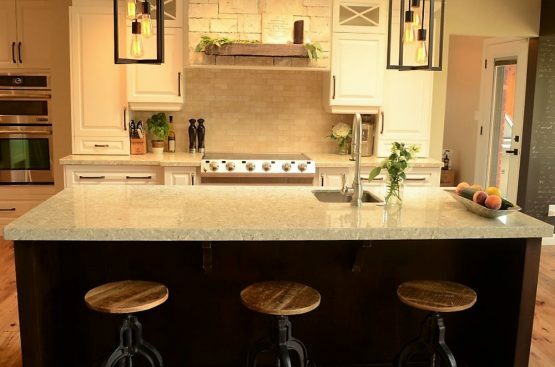 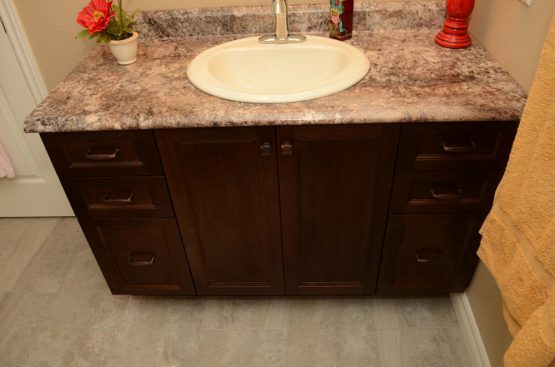 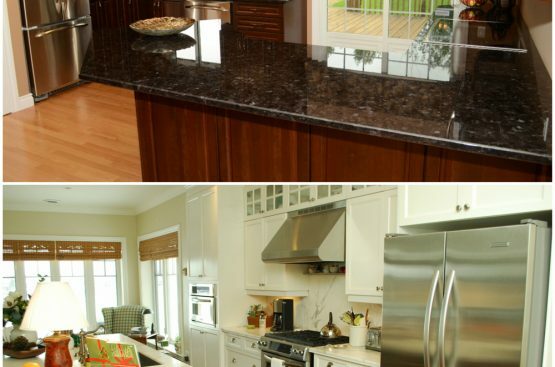 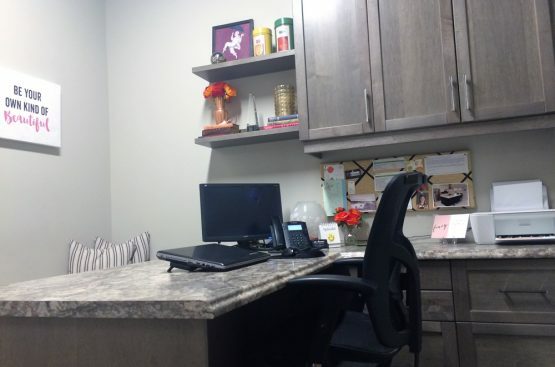 Natalie made house visits to take measurements, sorted through samples with us and, on numerous occasions, gave us feedback on countertops, appliances, fixtures, electrical and lighting. 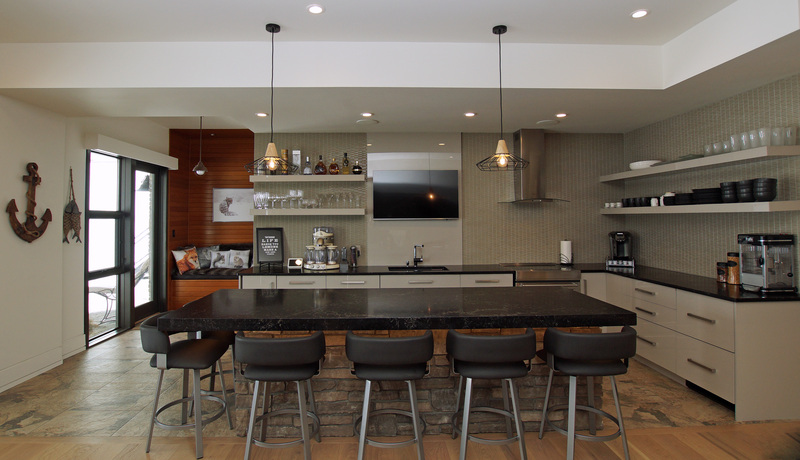 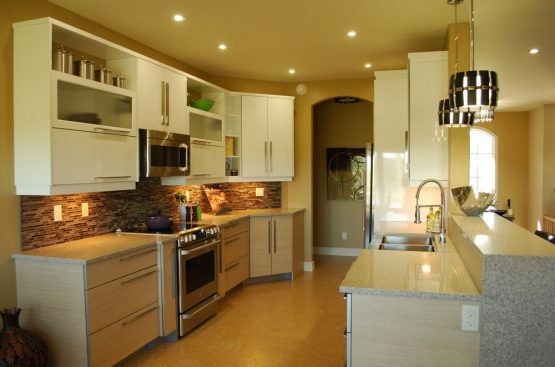 The end result is a functional, warm and inviting kitchen that is truly the heart of our home. 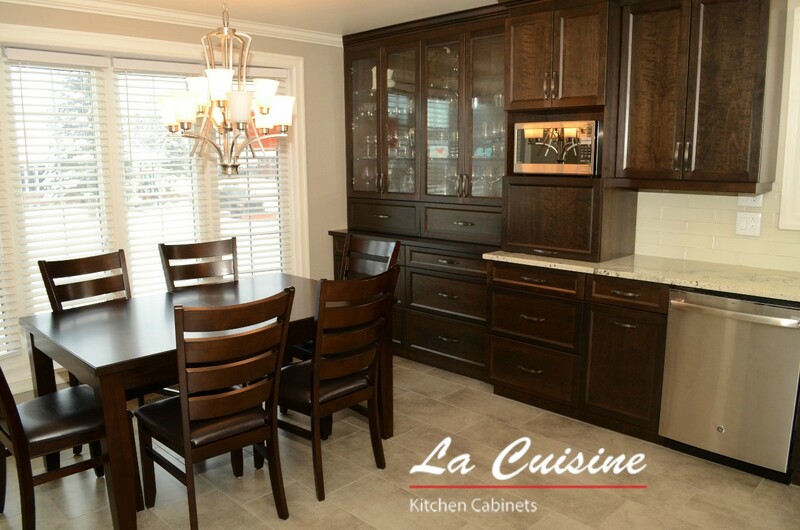 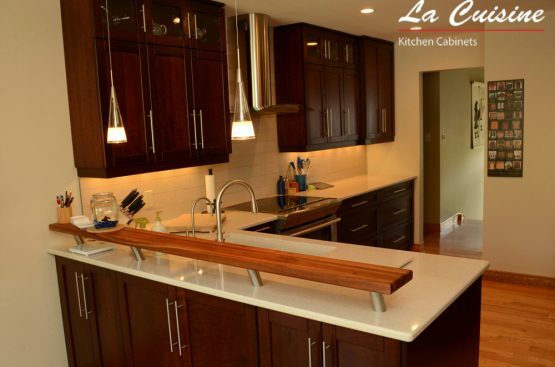 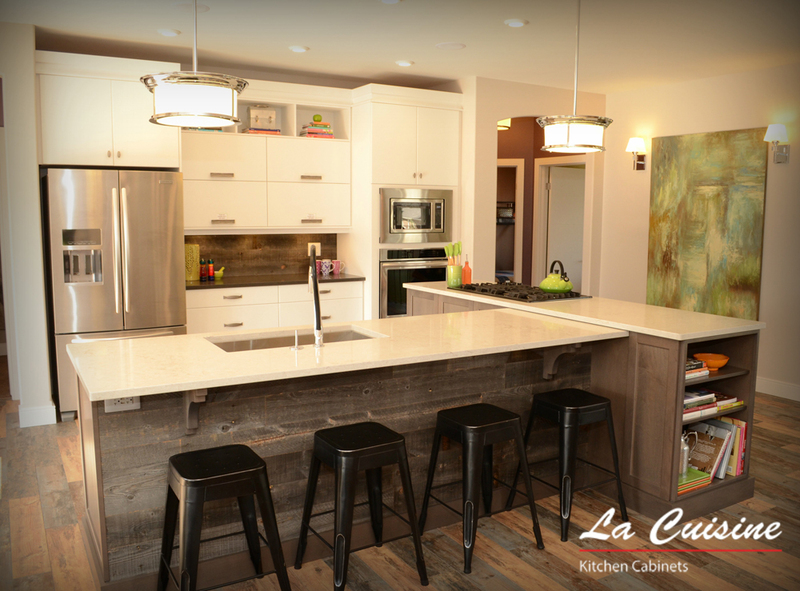 We would highly recommend Natalie and her staff at La Cuisine Kitchen Cabinets and wish to thank them for all their excellent work. 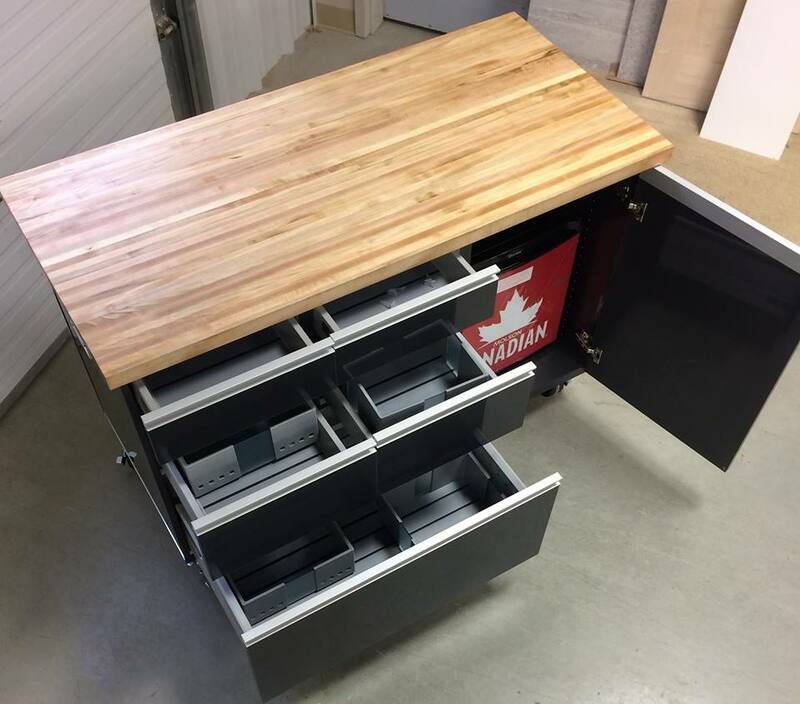 You have been the most amazing support! 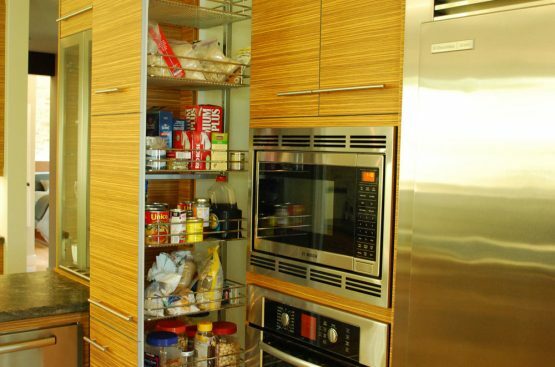 If it was not for you I probably would not even have a new kitchen! 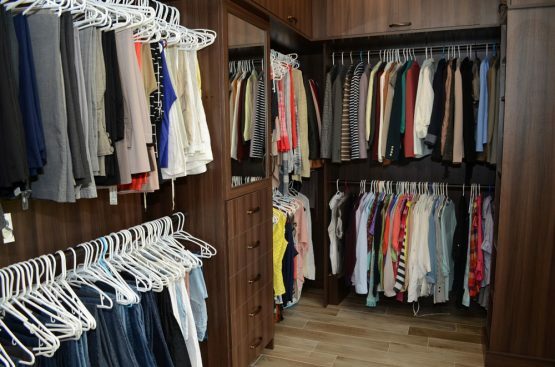 You made me and my sister feel like we did not have to worry about a thing. 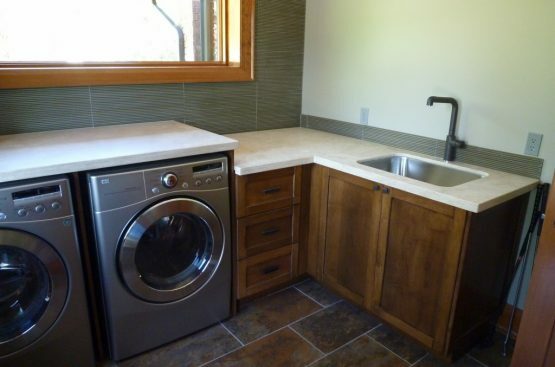 And it was so nice to have someone that took care of EvERyTHInG .. and somehow I didn’t even blow my budget. 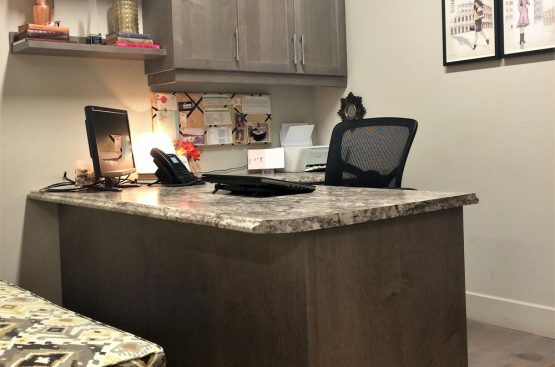 You were professional, kind and supportive all the way through and went over and above with everything you have done for us. La Cuisine transformed our tired looking, dated and poorly organized kitchen into a beautiful, unique and inviting space for our family. 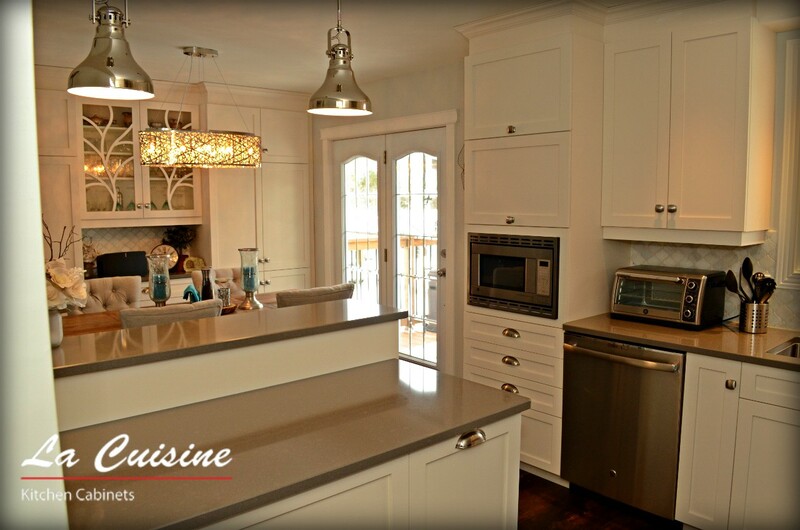 She brought to life the ideas that we dreamed up and put them into fruition for us. 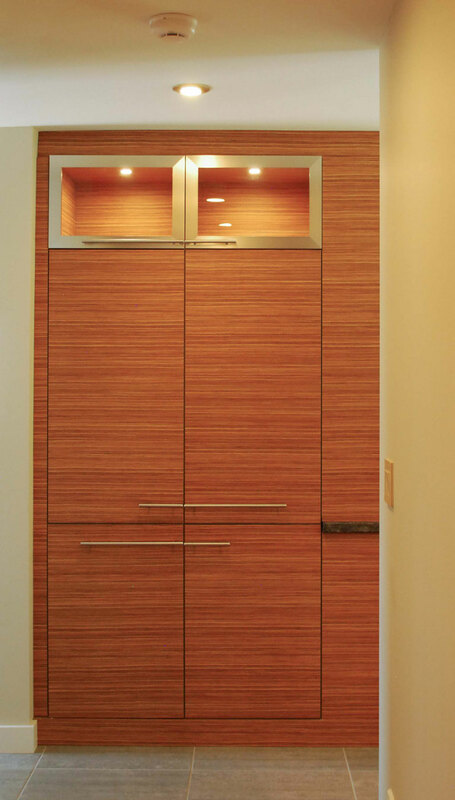 We are crazy about our roasted ash cupboards that keep looking better as they age. 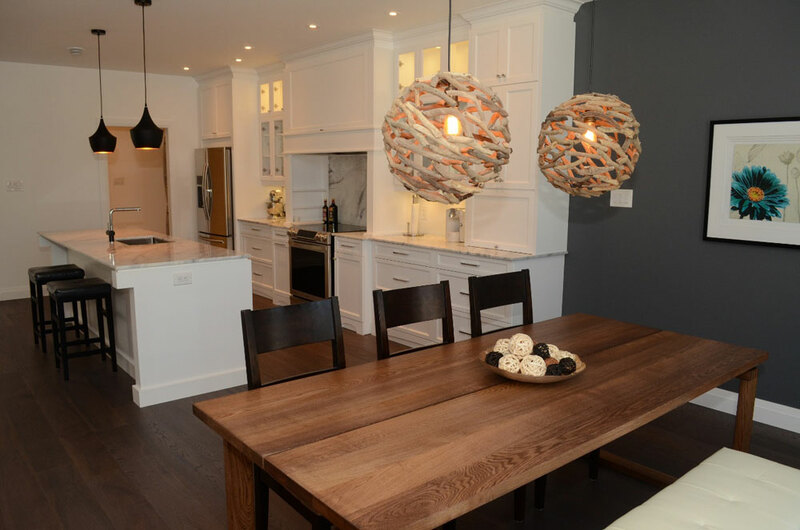 She brought in a beautiful light maple to accent the richer, darker wood. 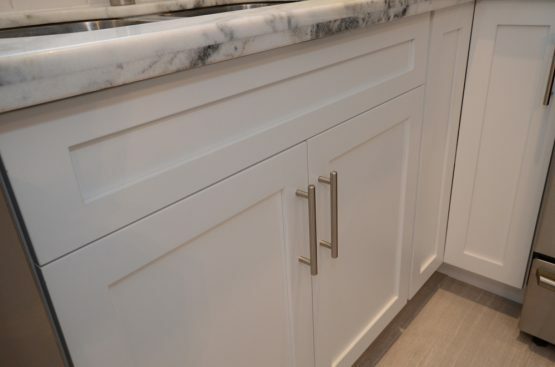 The handles she ordered bring a retro, modern feel to the kitchen. 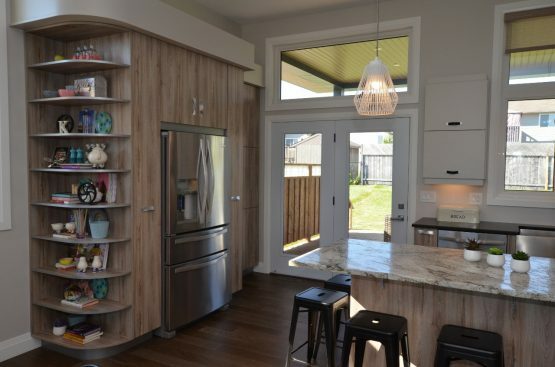 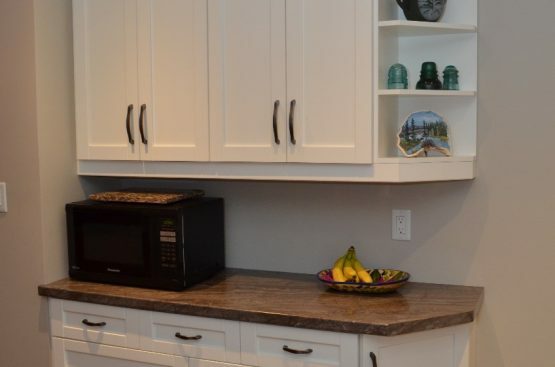 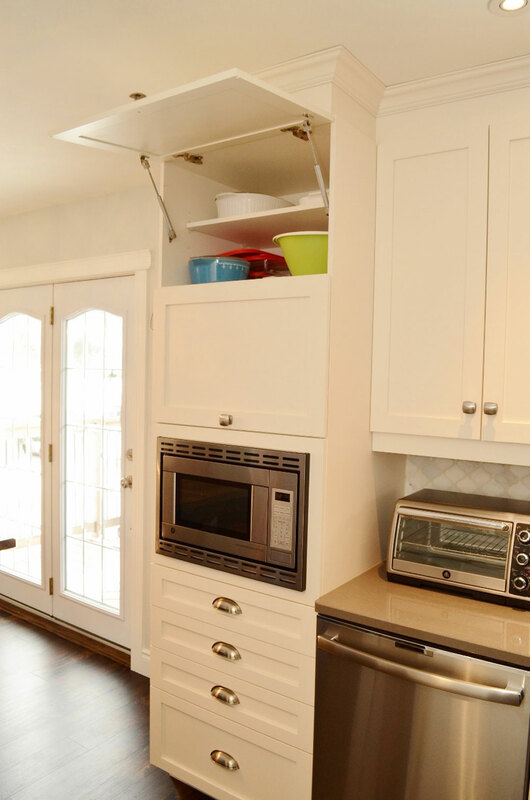 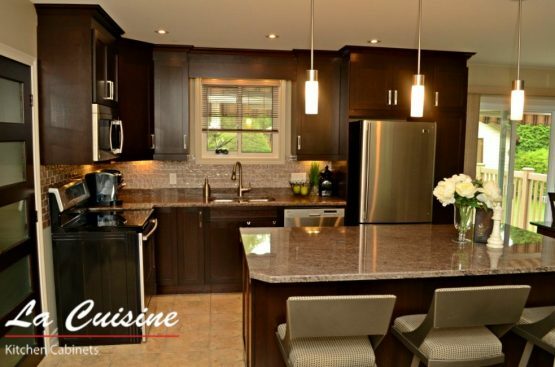 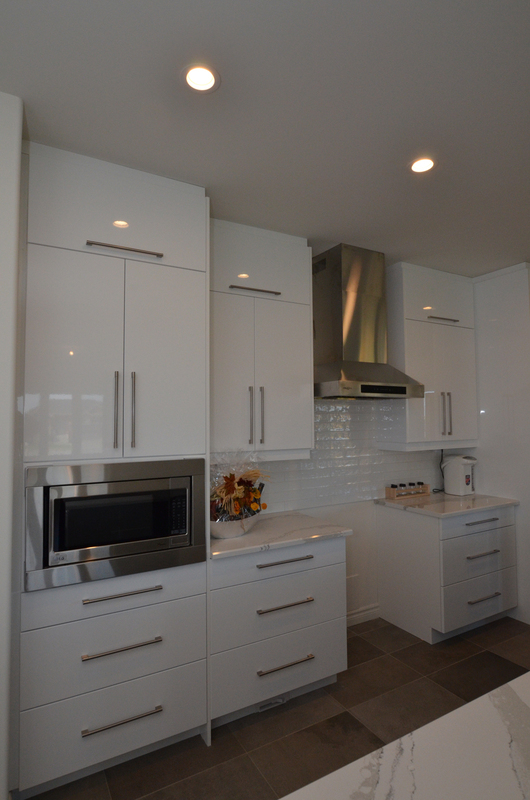 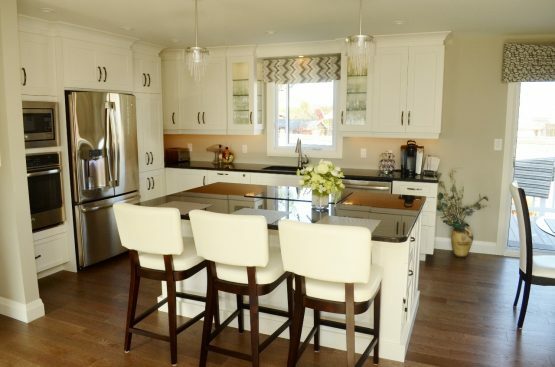 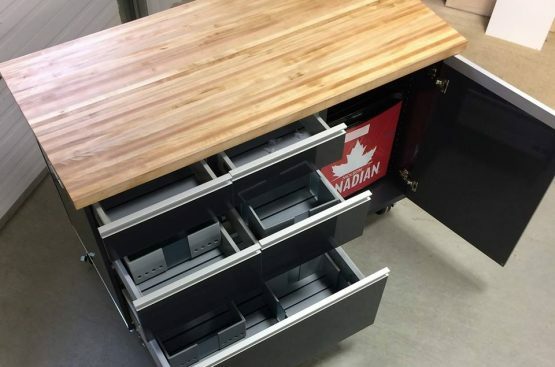 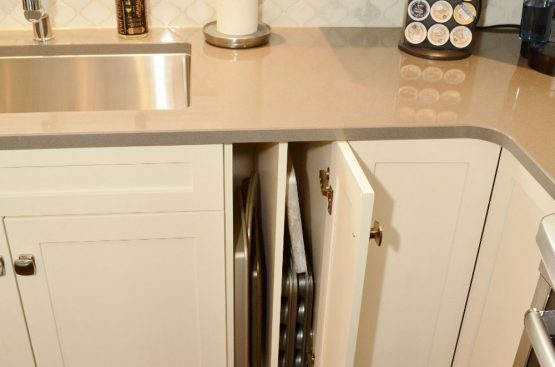 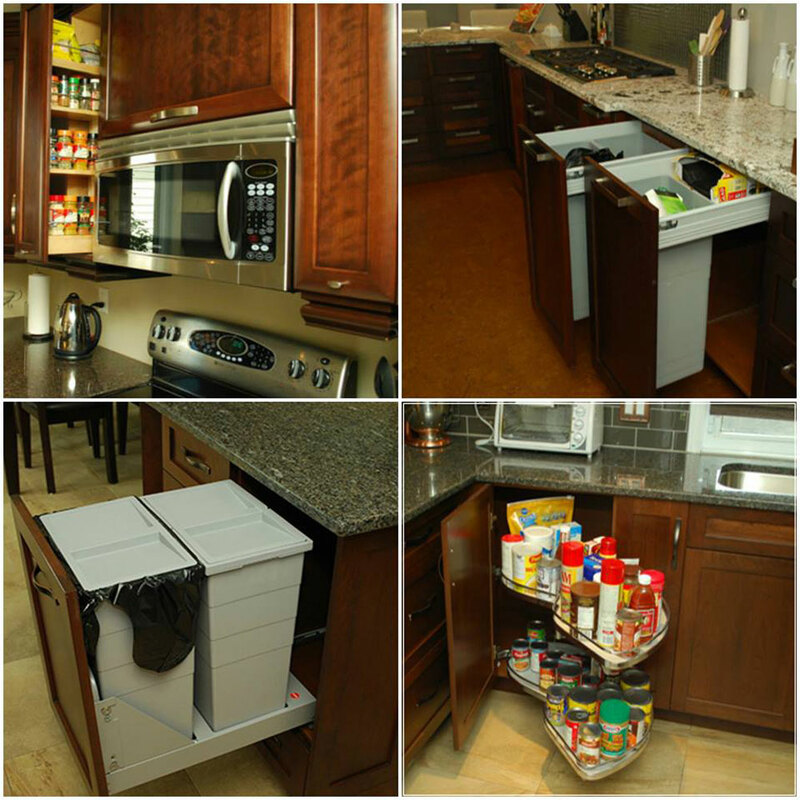 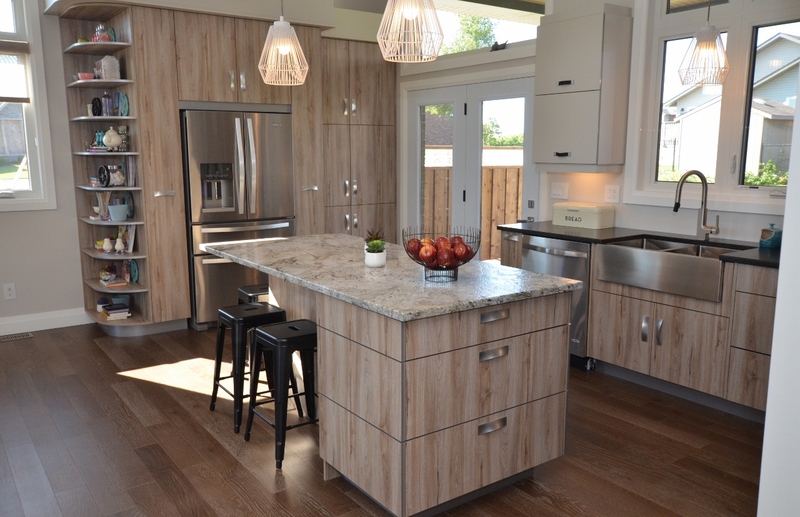 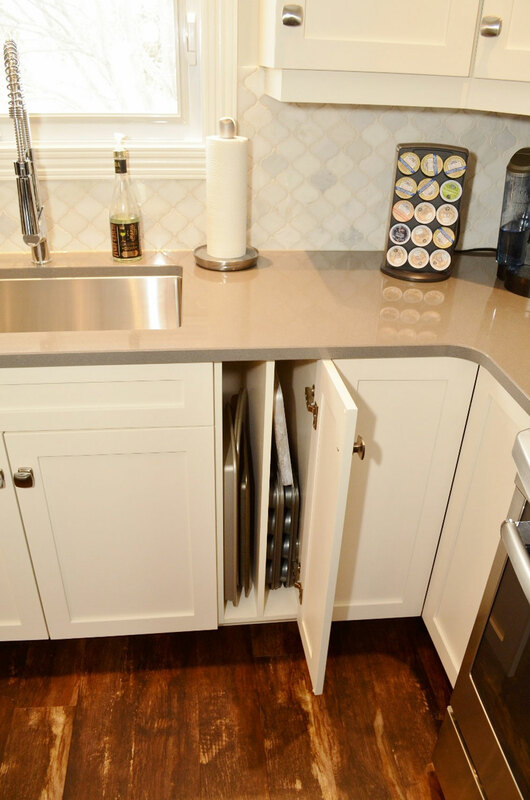 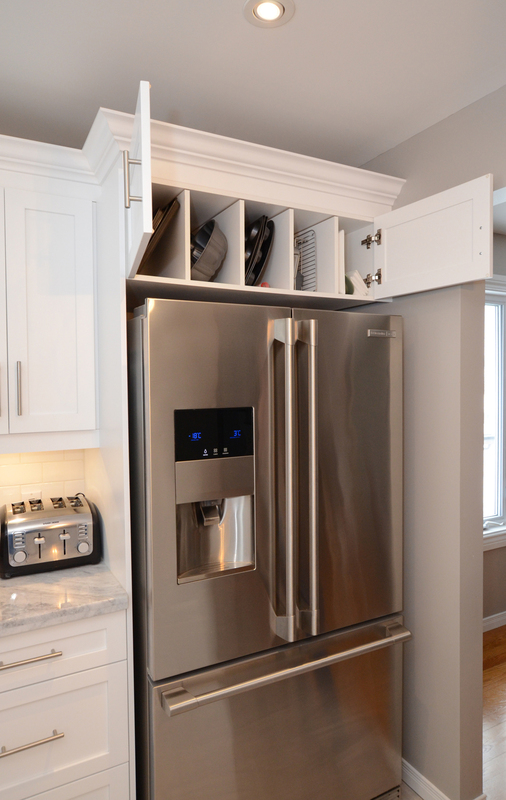 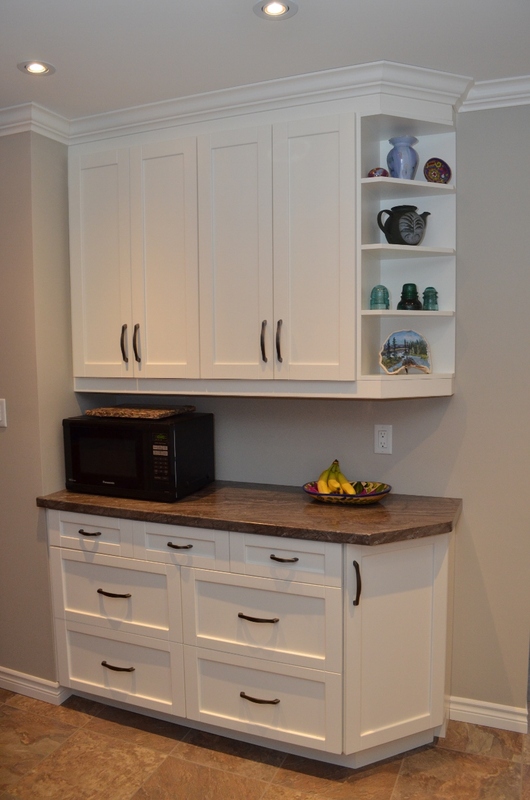 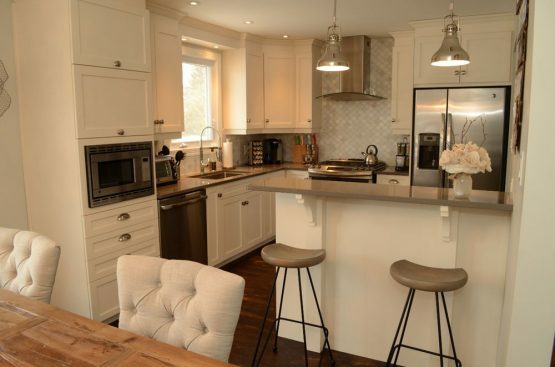 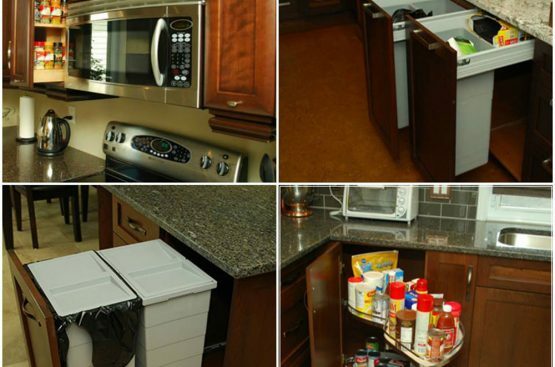 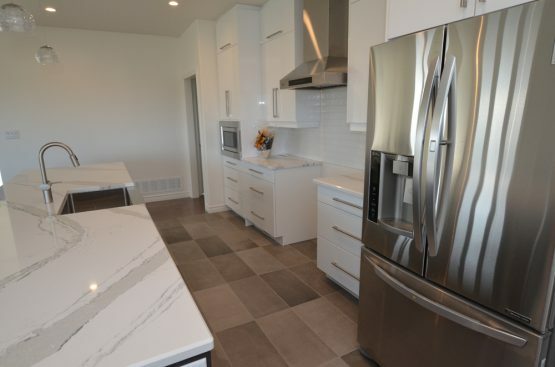 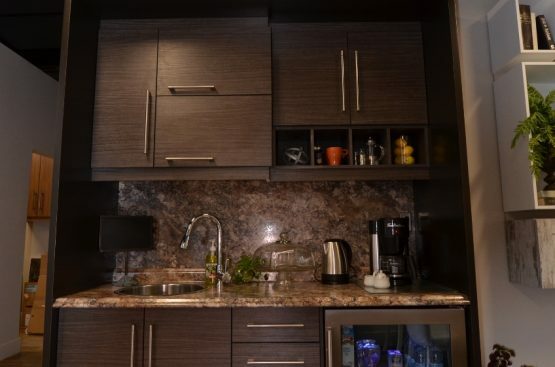 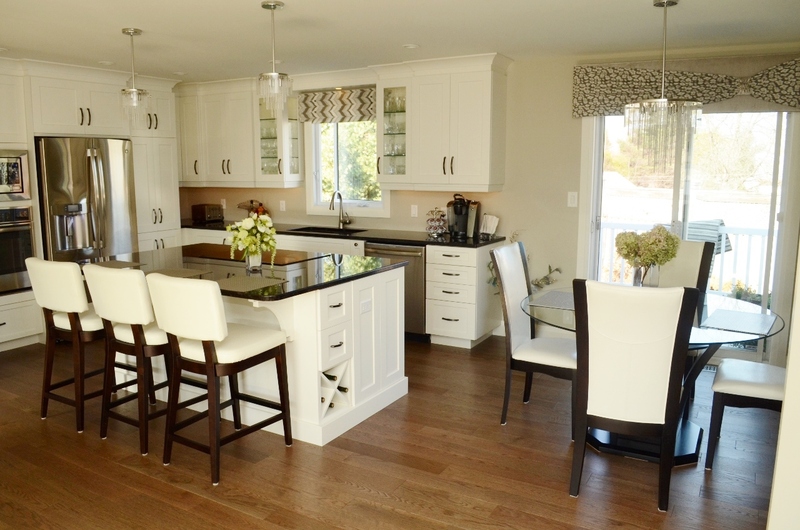 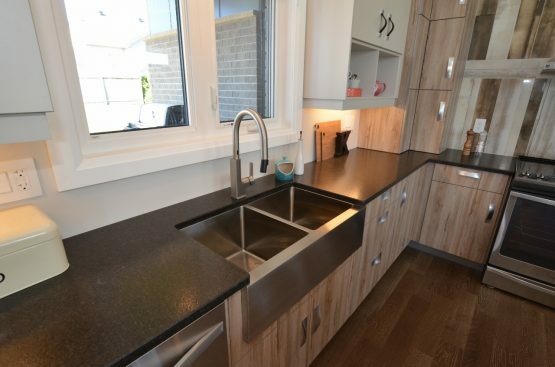 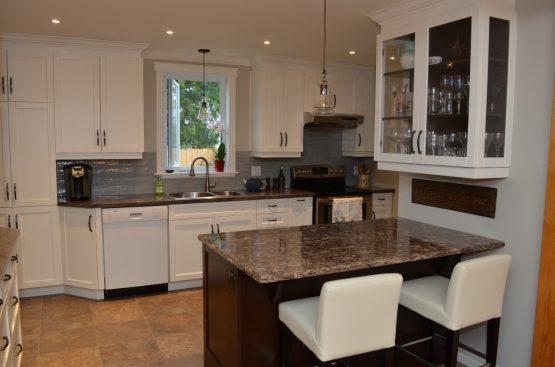 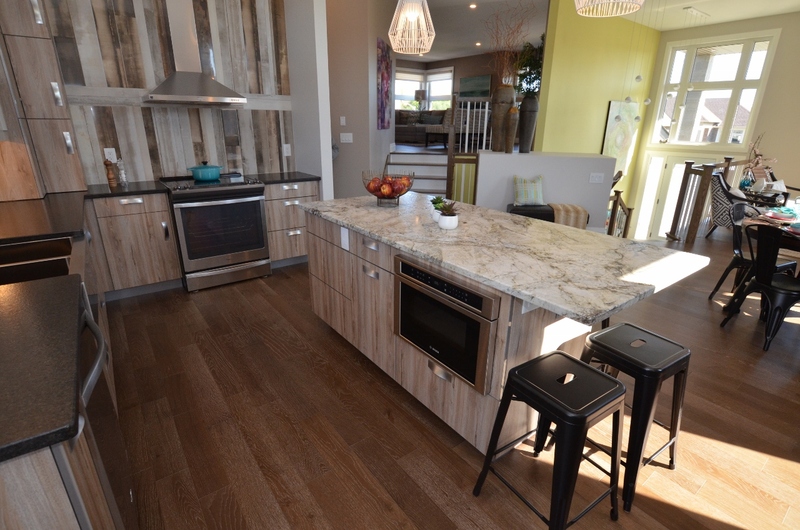 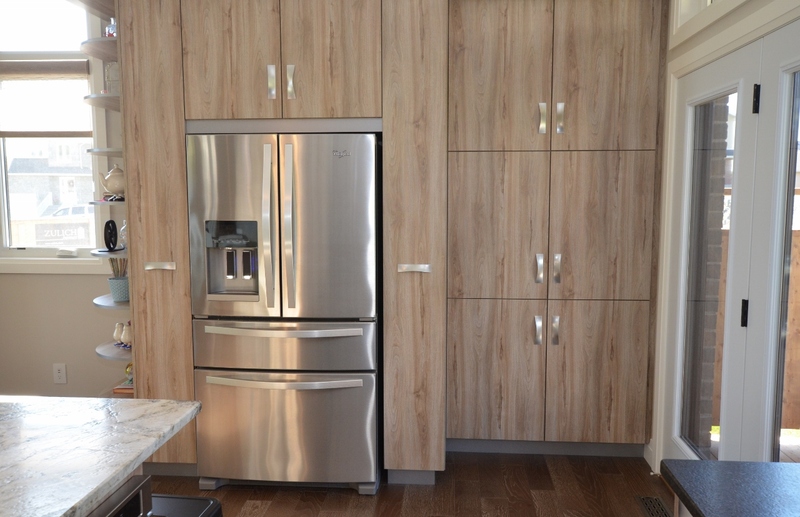 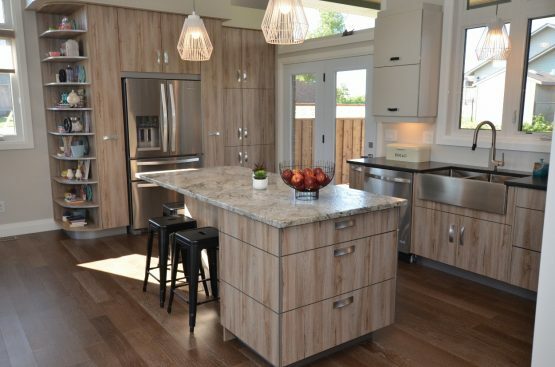 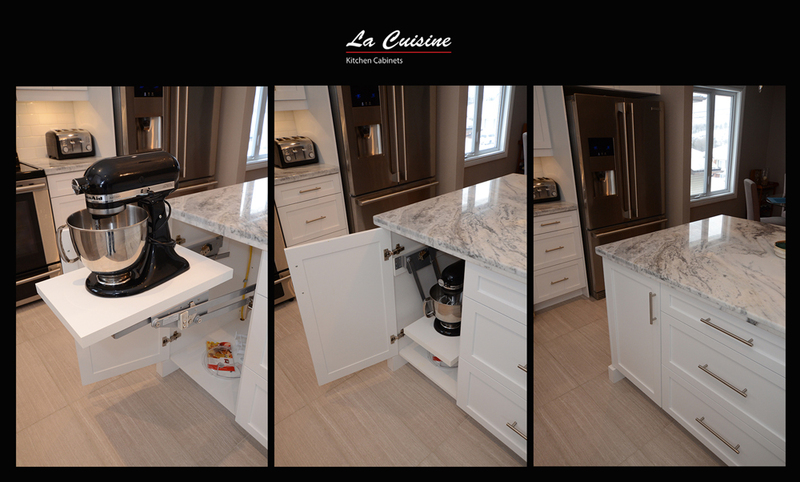 Some of our favourite features of our kitchen include the double slide garbage and recycling drawer, the soft close drawers and cupboards, the swing out style lazy susan, the backsplash, the island and built in microwave. 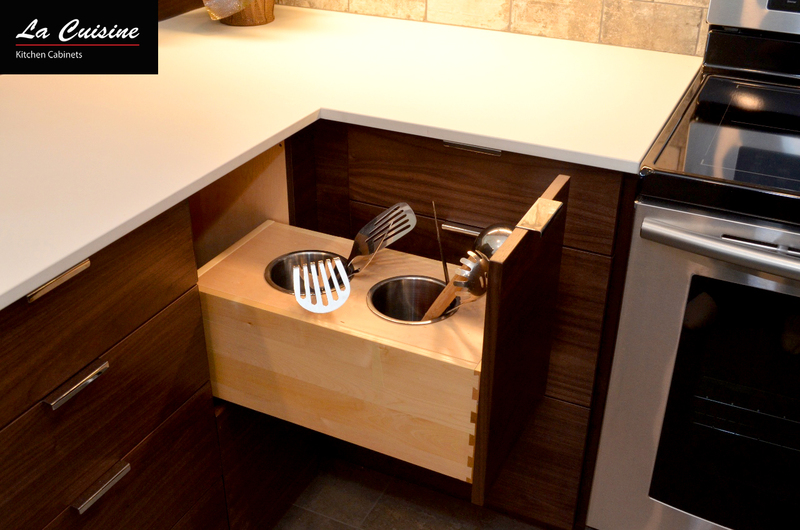 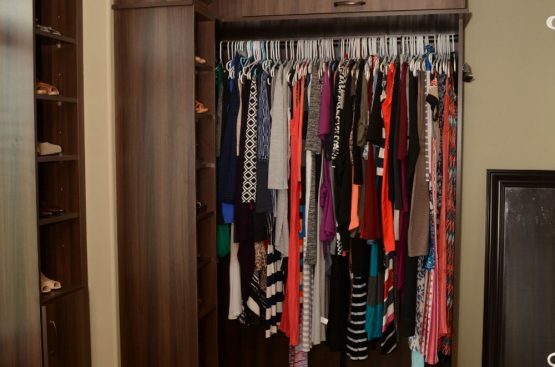 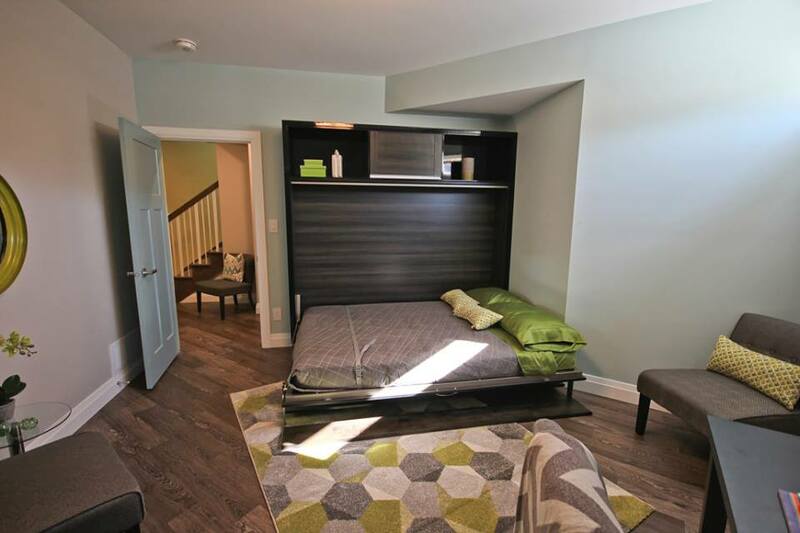 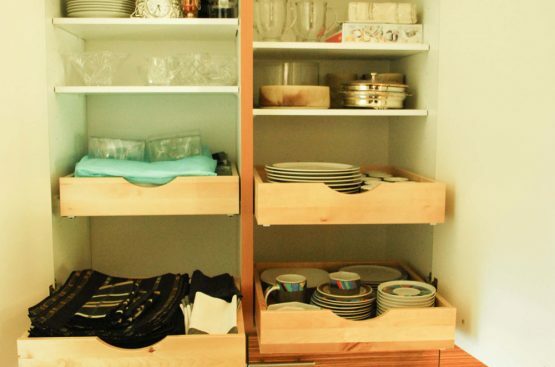 Overall, the efficient utilization of space! 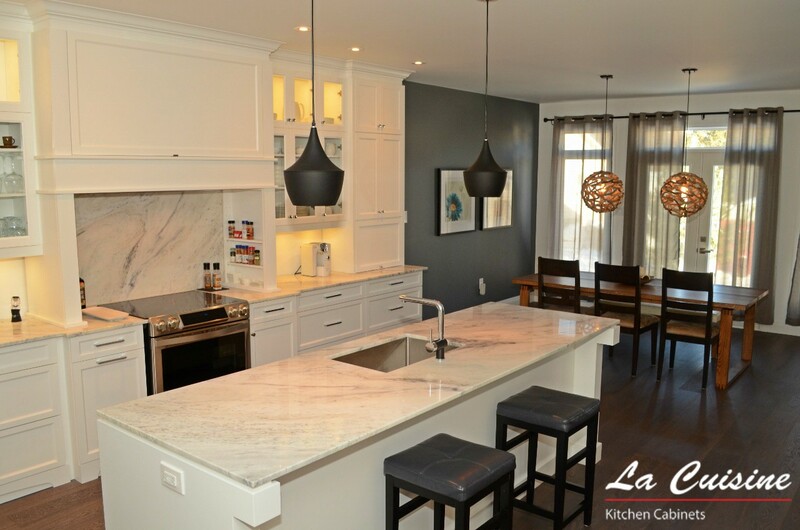 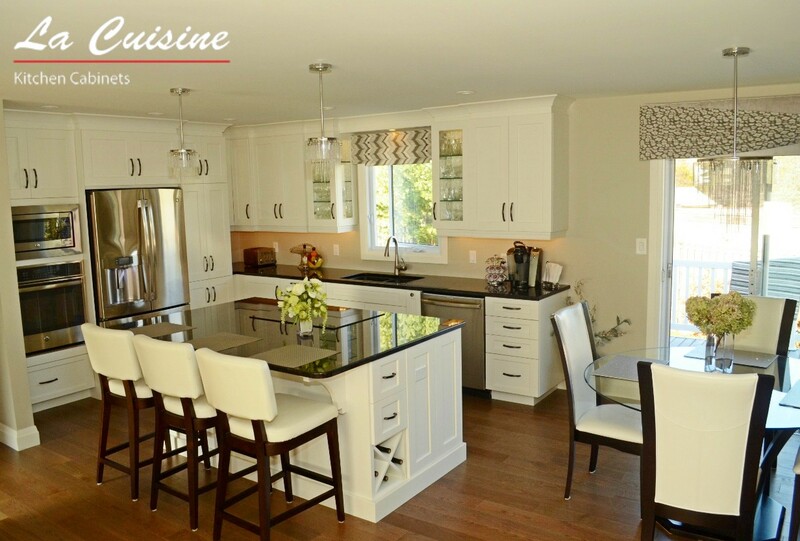 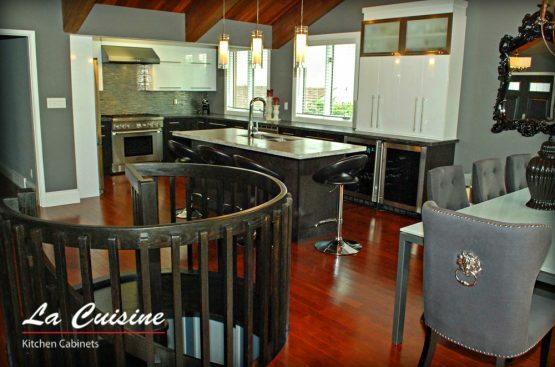 We are honoured to be a part of a LaCuisine benchmark after winning best renovated kitchen at the Home Builder’s Association Awards. Natalie is a true visionary in her field and it shows with every accent in our kitchen. 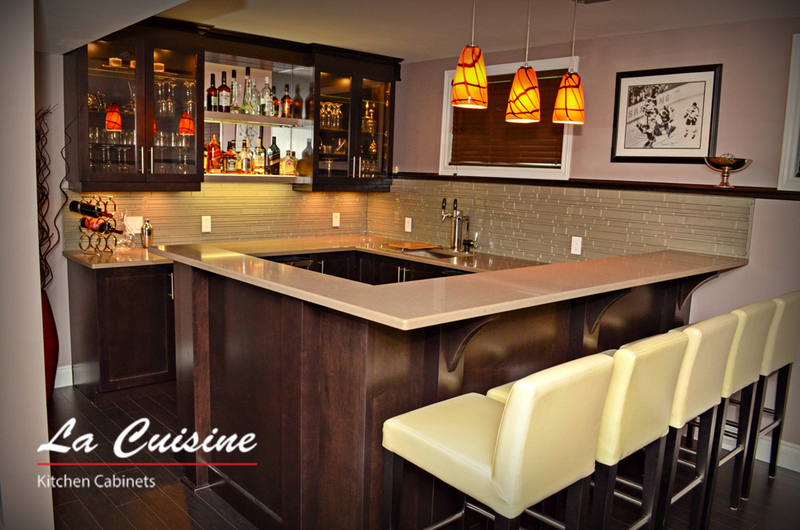 Thanks for creating a culinary wonderland! Great service, great quality and superb staff! 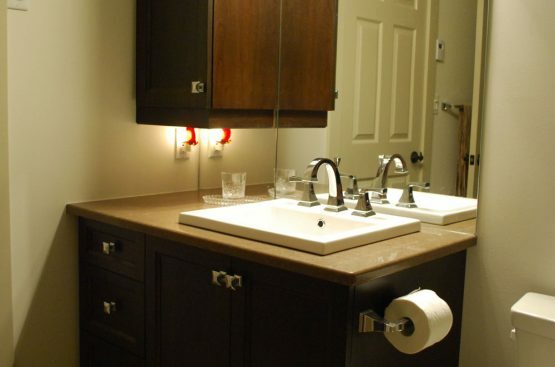 They were helpful and came up with some different options for our budget. 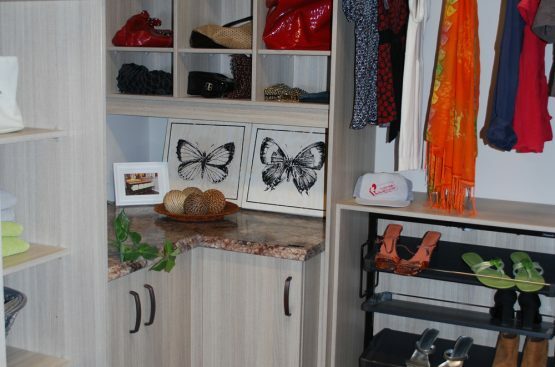 Highly recommend everyone to go see the beautiful store. 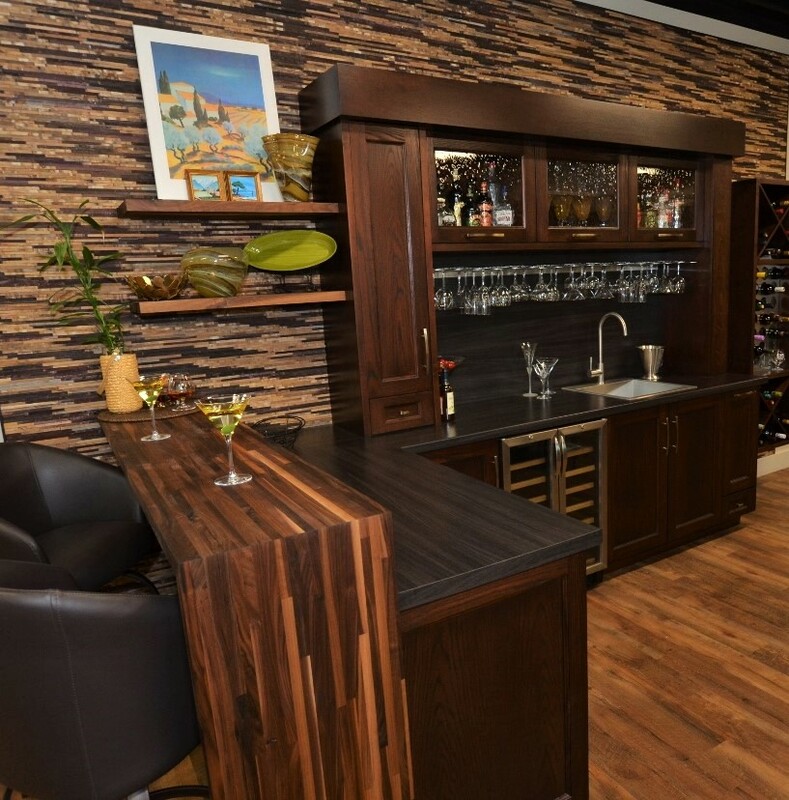 Support a local business! 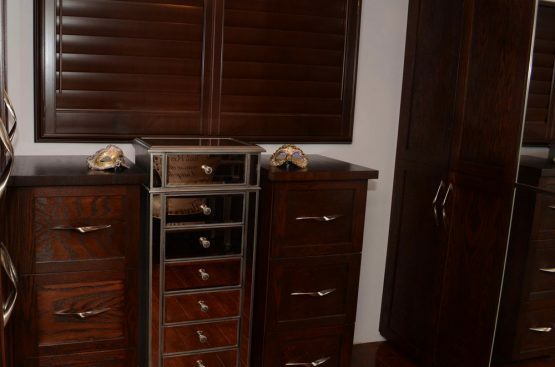 Just have to say absolutely loved working with Kelly, he gave a lot of great suggestions. 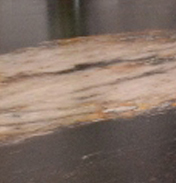 As for the business and the people (family) they are all awesome people. 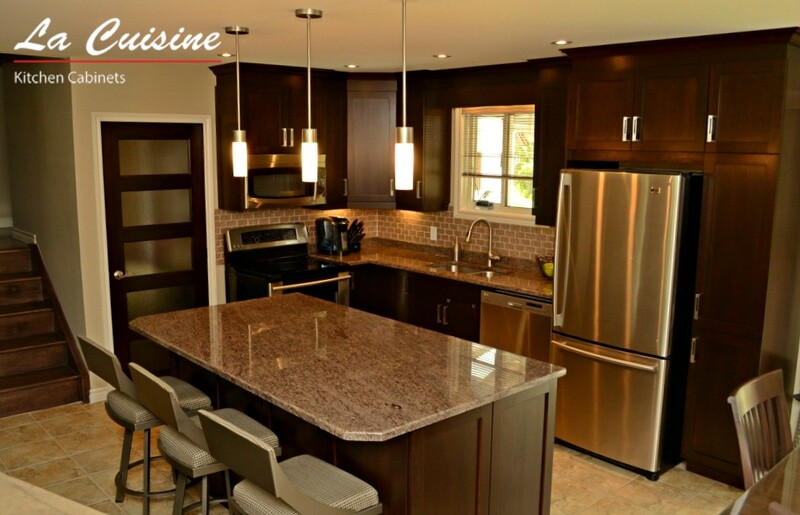 Very good feeling doing business with a local family business. 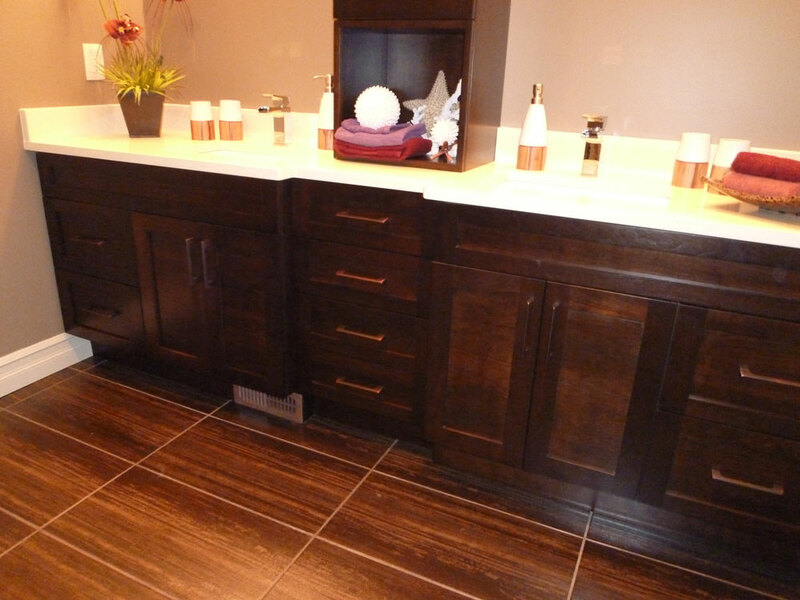 GREAT INSTALLERS ALSO!! 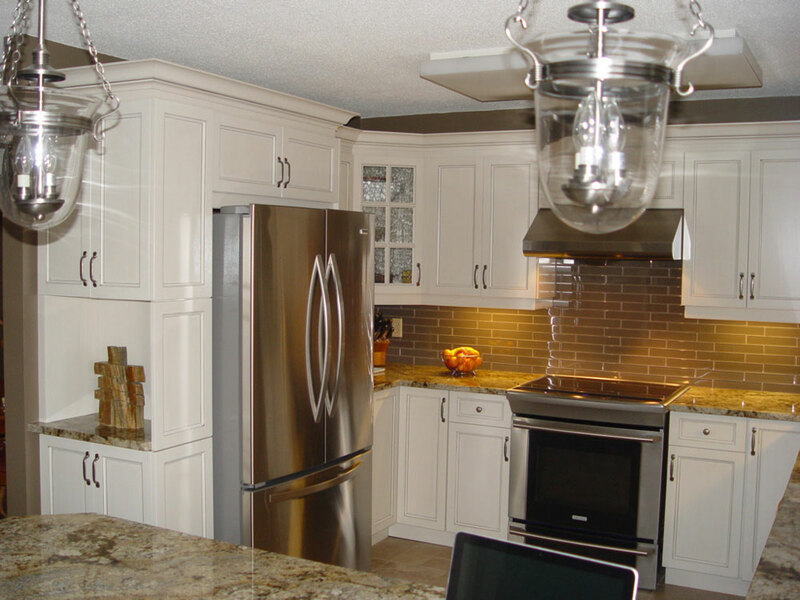 Got my kitchen done, very good service, good quality and I recommend them. 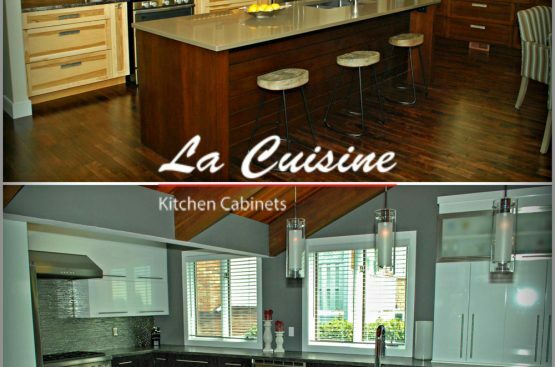 La Cuisine, helping families reconnect with their home! 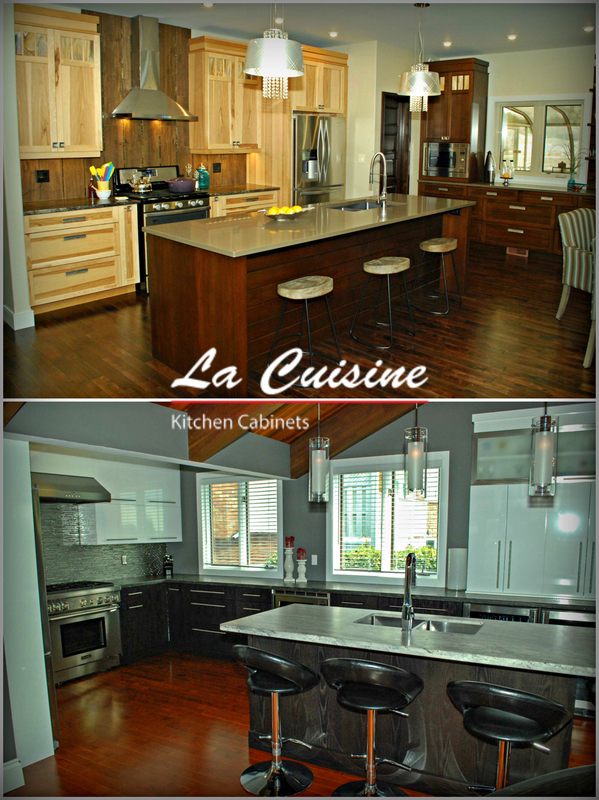 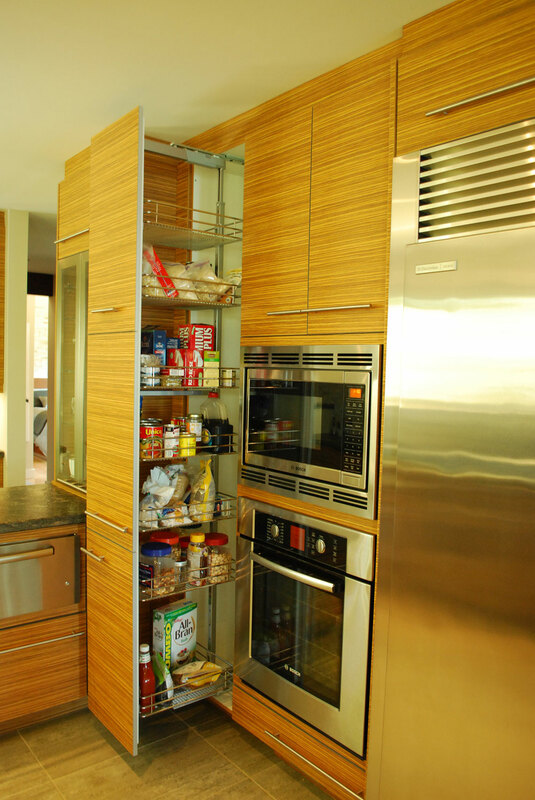 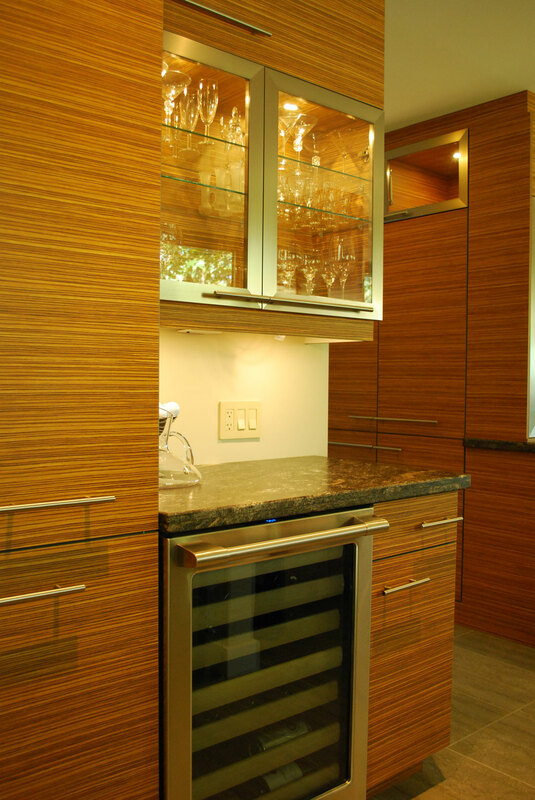 Thank you for you interest in La Cuisine Kitchen Cabinets. 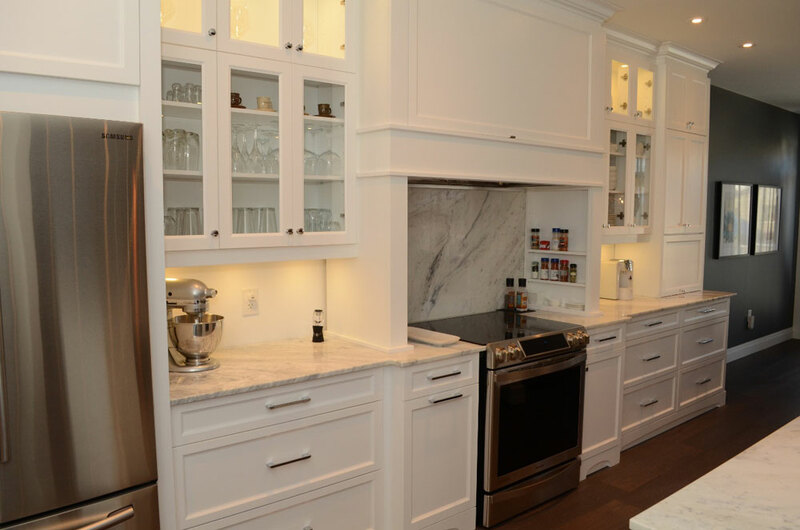 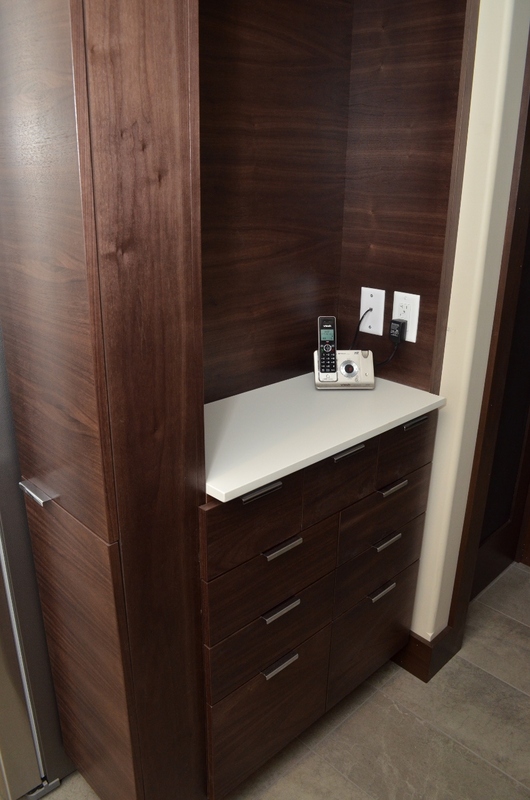 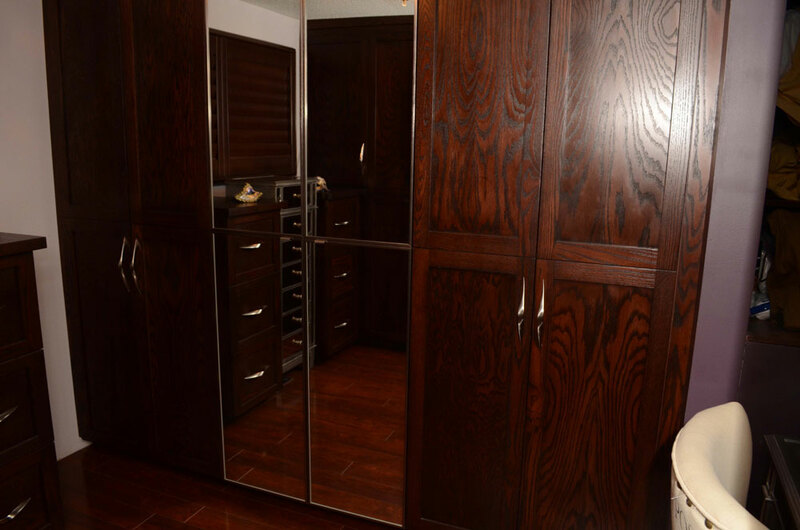 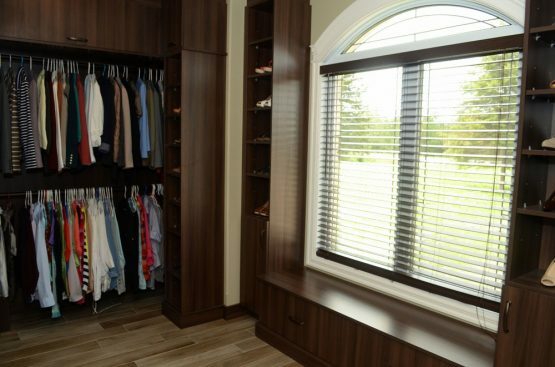 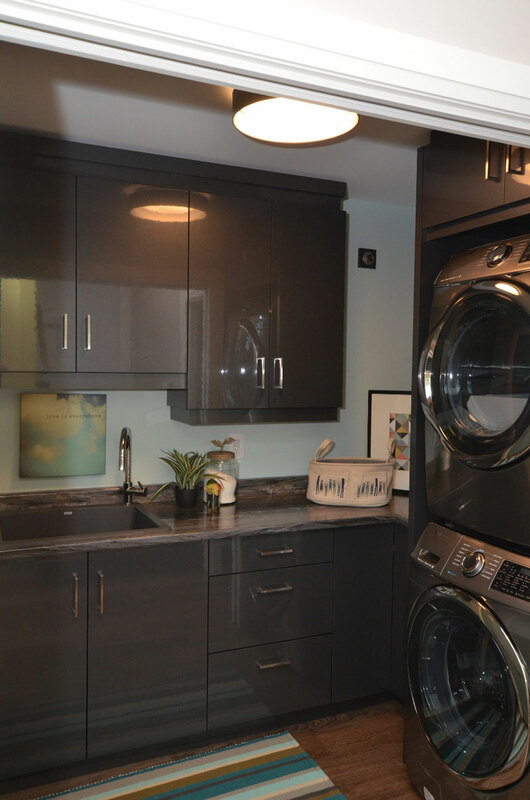 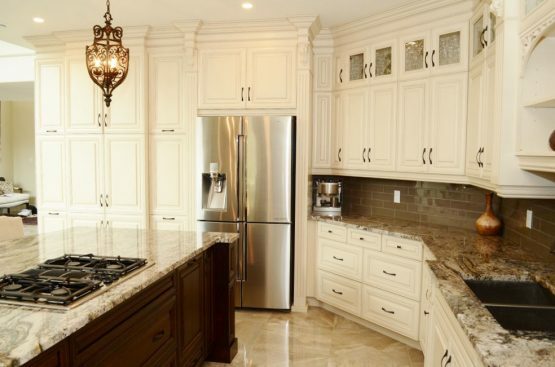 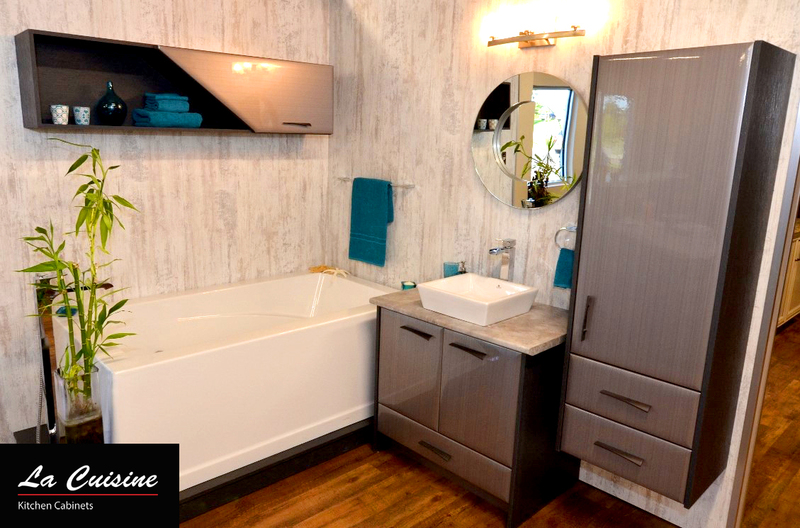 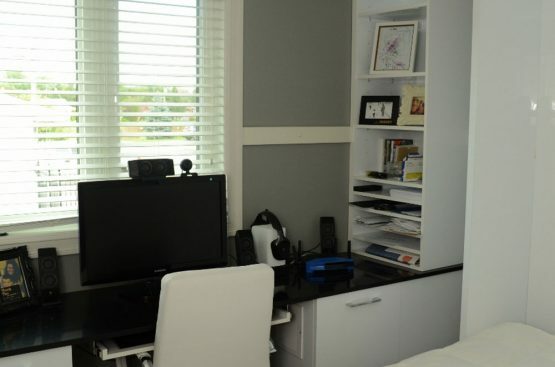 We are happy to answer any questions you may have about our product or services, and would be very excited to assess your home's needs and design the kitchen, closet or bathroom of your dreams. 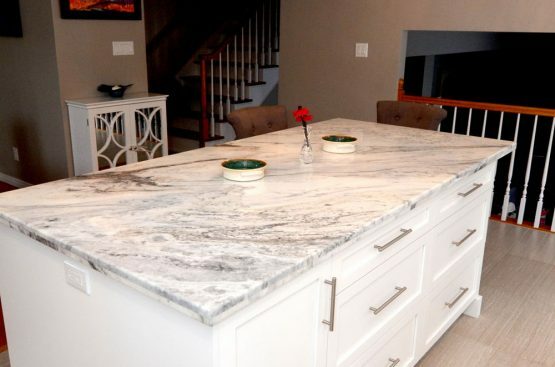 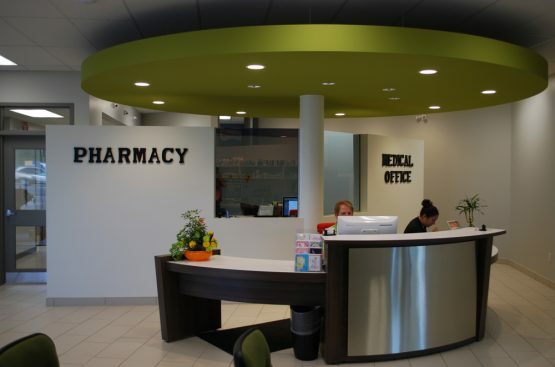 Please send us your contact information by submitting the requested information to the right, and one of our team members will be in touch shortly to answer your questions or schedule your design consultation.